It’s been a while since I put together one of my gargantuan matte shot tribute blog posts, and for that I humbly apologise. As I’ve often mentioned here, my personality is one of those where the ‘mood’ and ‘time’ just has to be right for me to embark on these (and much else I engage in too for that matter), and I tend to go through a sort of funk after each blogging wondering if anyone really reads them, or shares my passion for the old time trick work and whether I should bother doing another one - especially as most people - for reasons that escape me - nowadays probably read 'em on those damned cellphone sized devices with tiny screens. It doesn’t help matters when it’s known by many around me that I’m really a “cup half empty” kind of a fella, as opposed to the more upbeat “cup half full” seriously positive, driven types. Anyway, after a warm summer here in NZ involving a fair bit of relaxed sea/landscape oil painting, several home improvements, building and all sorts of chores which leave very positive impressions upon my wife, it’s high time for a new blog post. 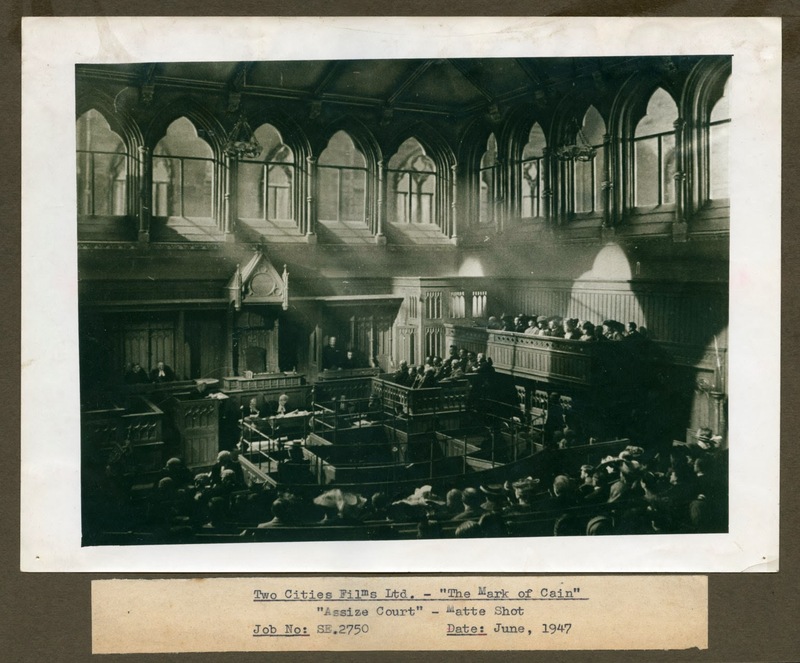 The ‘mood’ is right, and so in my odd, yet typically idiosyncratic explosion of energy which bursts forth from NZPete so infrequently, I’m shutting out all else while frantically bashing out this article on Rank-Pinewood’s effects department. In putting together this article I’ve been often at a loss as to whether to include as many of the films that I have, as some of those featured here may, or may not, have strong Rank connections and the production details aren’t always as easy to decipher as one would wish. So please bear with me if some of the titles in the greater scheme of things turn out NOT to have that Rank-Pinewood pedigree after all. 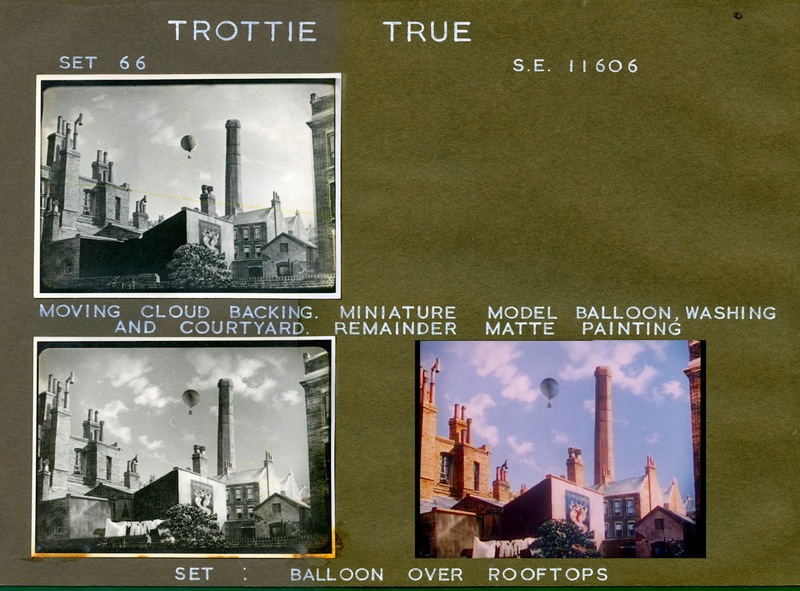 British trick shot work has been shamefully poor in documentation – something I tried to remedy with my earlier Shepperton Studio’s Matte Dept article in an extensive blog post a while back. Nothing much has really been previously published on British special effects departments (boy, I’d love a big coffee table book on the UK fx biz one day!) 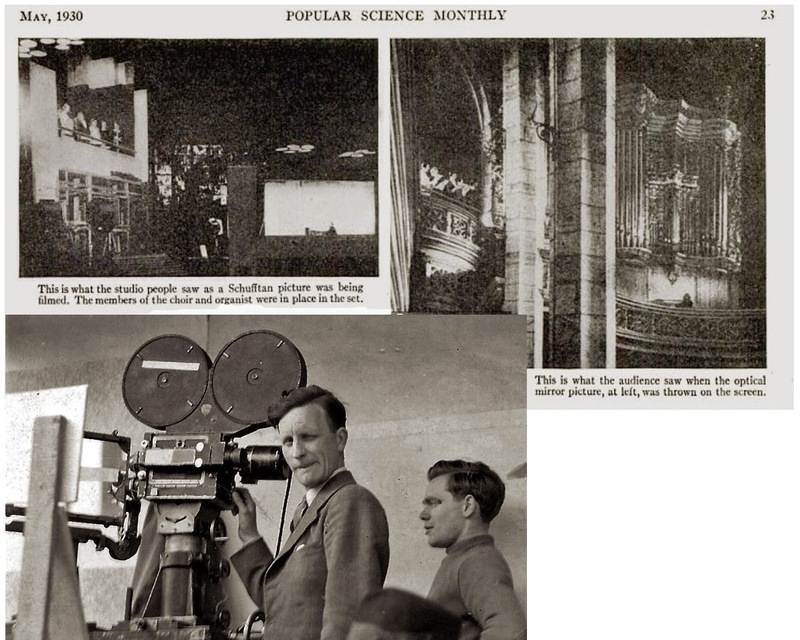 – so aside from numerous old British Kinematograph articles, clippings and similar from my archives, as well as the still vital and essential John Brosnan book Movie Magic, it’s been tough to piece together. 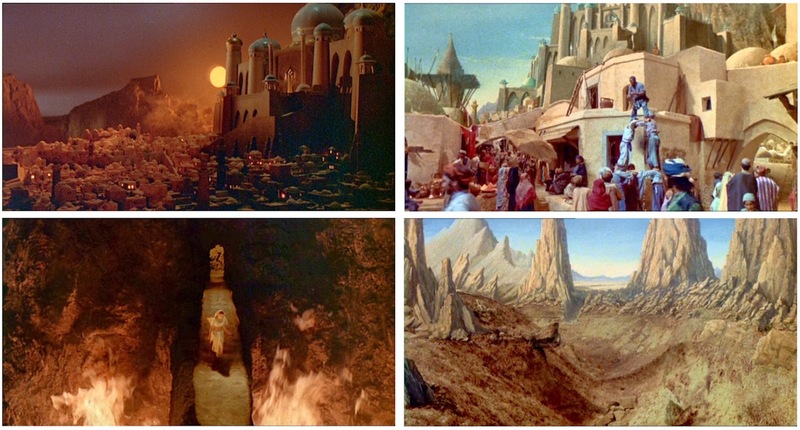 I’m especially grateful to British visual effects supervisor Dennis Lowe and former Pinewood matte artist Leigh Took for assisting me here with invaluable material from the Golden Era of Rank’s matte department trickery – much of which has never been seen before. I’m unsure where to start, though a run through of the personnel who would feature prominently behind the scenes at Rank in the special effects department seems the obvious move. One name in particular would appear to take a place of note in the development and advancement of trick work at the studio, and that is Filippo (Philippe) Guidobaldi. 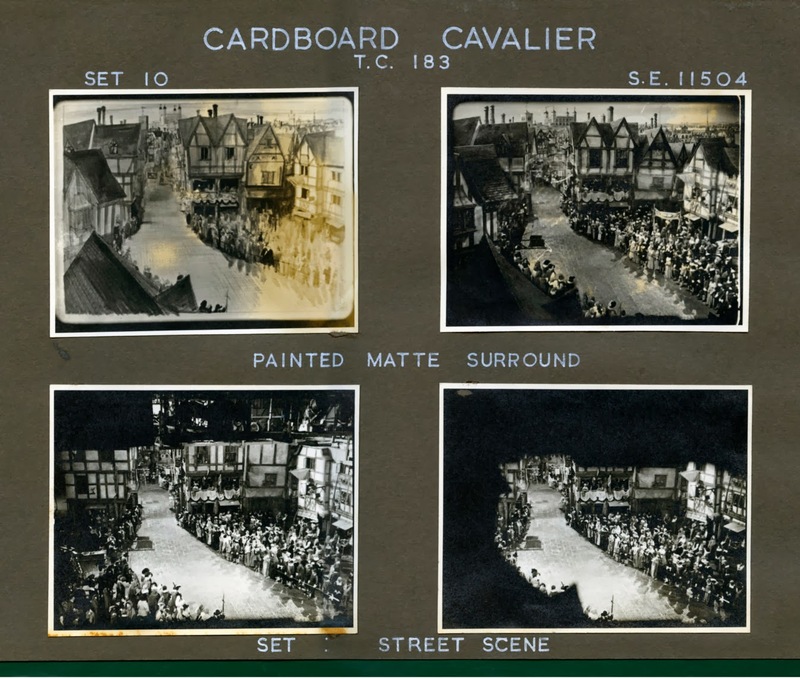 ‘Guido’, as he was known among his colleagues, was a noted designer, miniaturist and photographic effects man whose career included scores of pictures for Gaumont, Gainsborough as well as Rank. Guido’s work was held in high regard among his peers, and some might say he was the kingpin of British special visual effects. Guido would work with a young Albert Whitlock on several British films and received screen credit on many pictures – often simply as Guidobaldi – and continued to work up until his death in 1959. Guido’s collection of special effects related memorabilia, camera gear, photographs and designs recently came up for auction at Christies. Another key, long time name associated with the Rank effects unit was that of Bill Warrington (pictured at right). 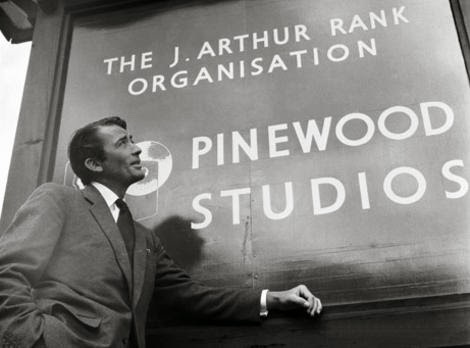 Already involved in trick shots at Elstree Studios before WWII, Warrington would join the J.Arthur Rank organisation at the end of the war at a time when Rank still had offshoot studios or stages at both Denham and Highbury. 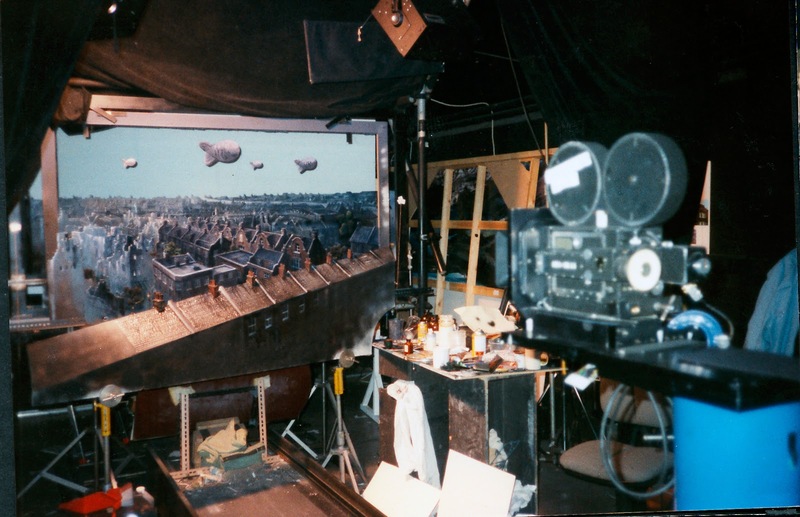 In John Brosnan’s book, Warrington tells of his involvement with the Schufftan Process of composite photography – which was the preferred means for a time of combining miniatures with live action and adding tops to sets, in camera, to great effect. Jimmy Wilson, BSC shooting a Schufftan shot. Note the mirror attached to the camera mount. 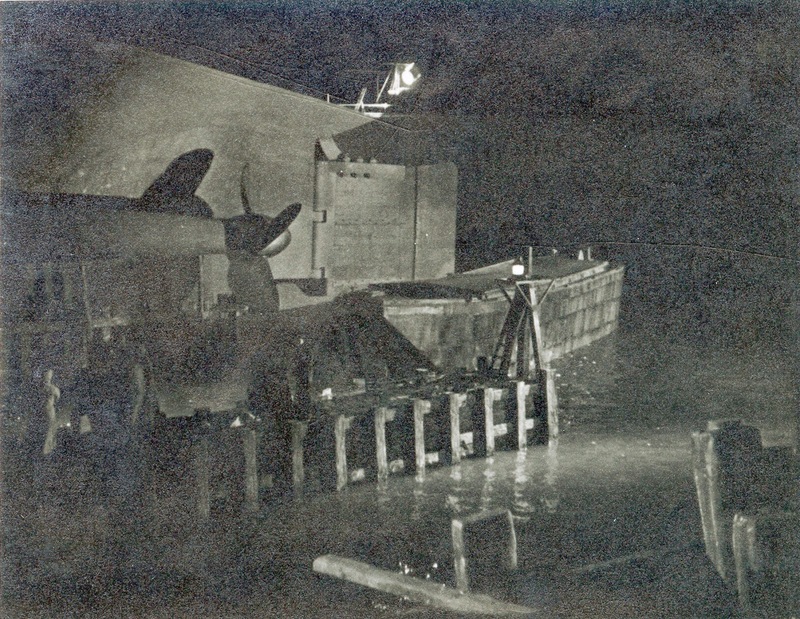 The early days of the Schufftan technique necessitated the old Tanning glass photographic plates – which according to Bill took around a half an hour to expose! 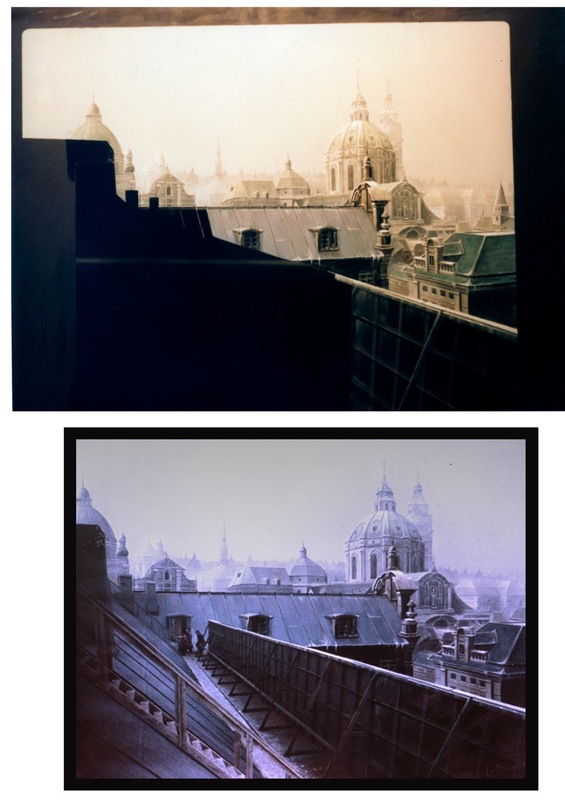 These transparencies measured some 24 inches in width and were mounted alongside the camera, with specific areas scraped away from the emulsion, which with the aid of a specially positioned mirror, portions of a limited set could be lined up and perfectly composited in camera, with flawless results. Bill would quickly become chief of all special effects at Rank-Pinewood, a position he would hold until he turned freelance in 1959. 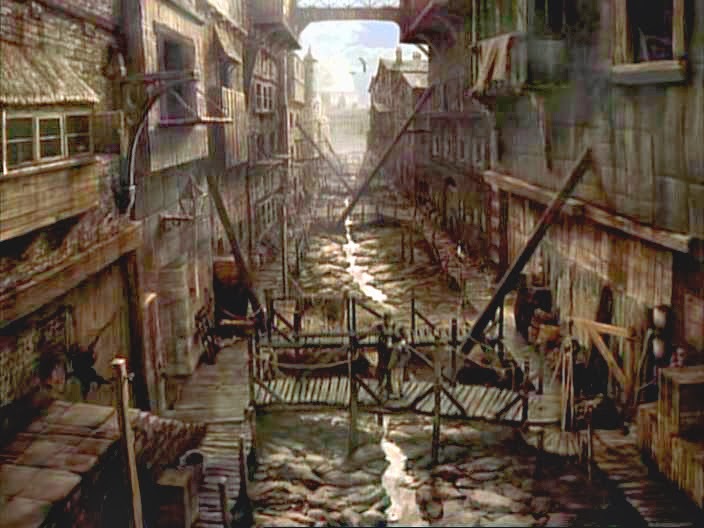 Although not a matte painter, Warrington would supervise all activities under the matte umbrella. As with many British effects men, Bill himself wasn’t pinned down in any particular field of trick work, unlike his American counterparts who tended more to specialise in their given area of expertise. 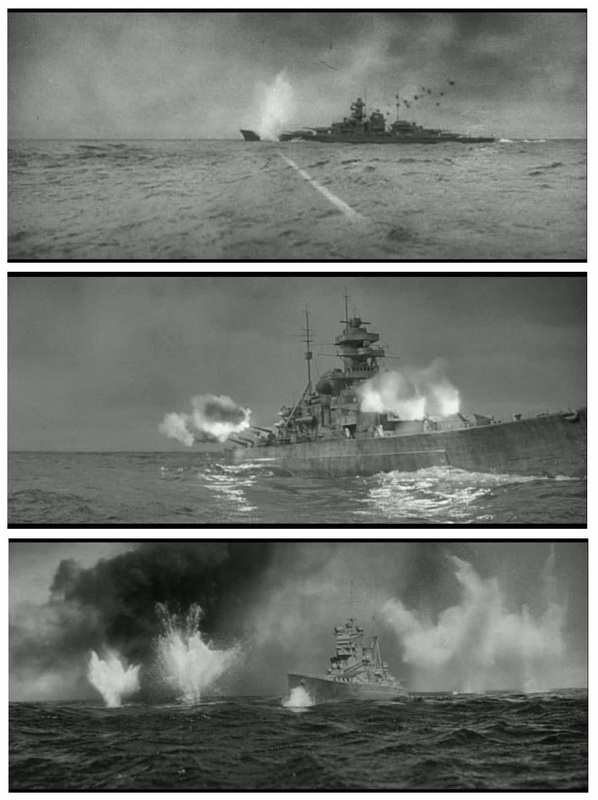 Warrington would gather experience with the Schufftan mirror techniques, hanging miniatures, tank model ship work and fully blown physical effects such as pyro and action gags. His final film was Steven Spielberg’s RAIDERS OF THE LOST ARK in 1981. In compiling this article I’ve not been able to find out just who painted the mattes at Rank before 1946. What is known is that Canadian born effects man Les Bowie (pictured at left) was ‘spotted’ by a Rank producer as both were POW’s in a German prisoner of war camp during WWII. At the time Les showed a keen ability in painting theatrical backings and making fake snow and things for camp shows as well as duplicating or forging passports and other documents for the escape committee – of which he proved most adept. 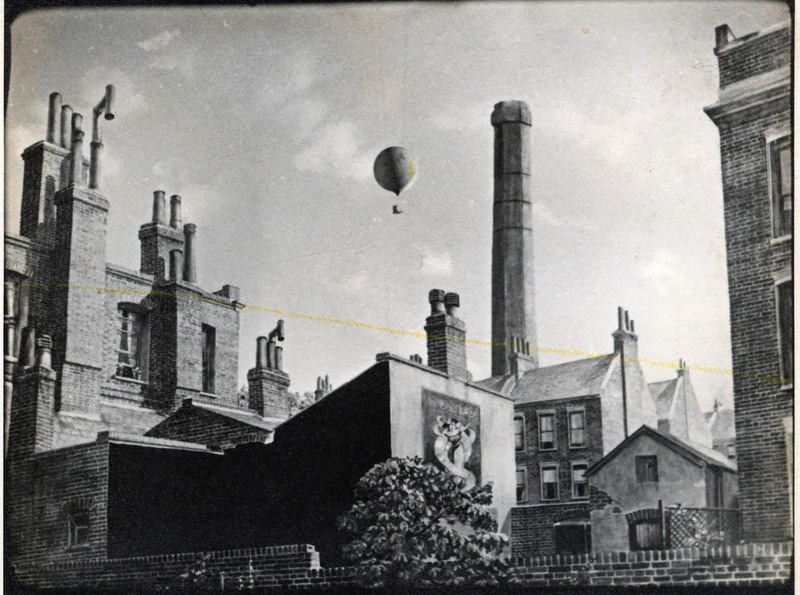 After the war Bowie got work on models and scenic art for SCHOOL FOR SECRETS (1946) and would soon after work at Denham under the legendary Walter Percy ‘Pop’ Day where he learned the art of matte painting working alongside such artists as Ivor Beddoes and Judy Jordan. Bowie would, after a brief period, make a move to Pinewood where, under Bill Warrington, he would be chief matte painter in the small unit. The means in which Les secured his position under Bill is now common folklore: Why should a glass painting take weeks or even months to complete (as it did with Pop Day) when it could be finished in a day or two? Les managed to convince Bill to let him have a go at knocking out a black and white glass shot in a day – of a coastguard station replacing unwanted high cliffs – which he did! According to Bowie the actual marry up of the elements was done that same day. Les was in! Thanks to matte painter Leigh Took, who kindly supplied me with very rare Rank matte proofsheets which Leigh rescued from a skip when his mentor Cliff Culley had a big clear out years ago, I have a number of Bowie’s largely unseen glass shots scattered throughout the following article. During Bowie’s tenure at Rank, several other young matte artists would come along and join the team – all of whom would carry on with long careers in the artform. 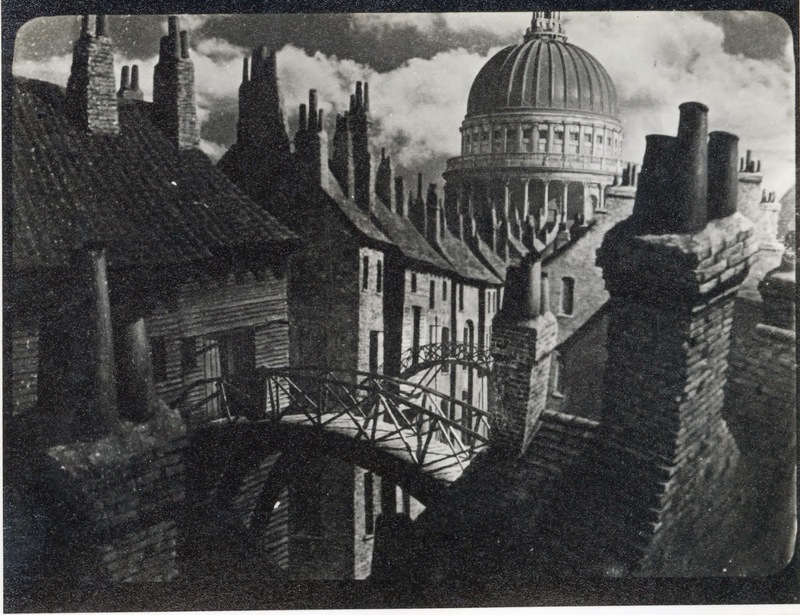 In 1946 Albert Whitlock was brought on board as matte artist, followed soon after by Cliff Culley and Peter Melrose. 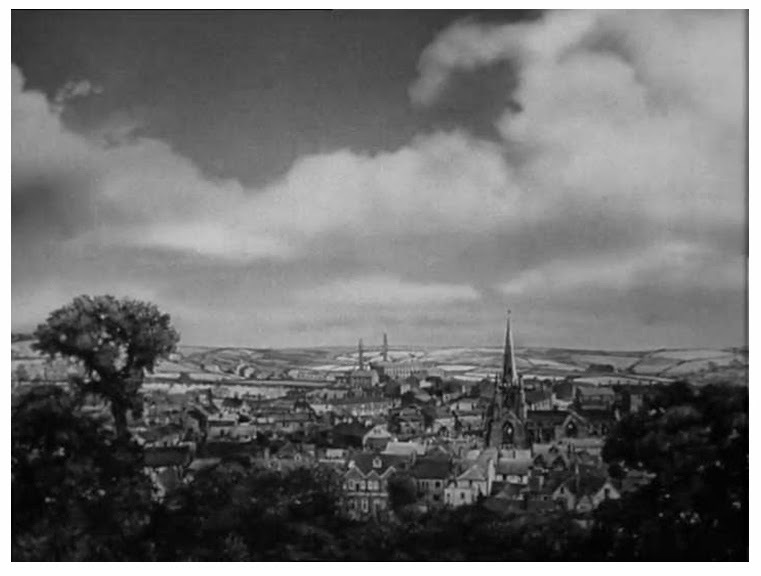 Both Whitlock and Melrose had backgrounds in scenic work, with both having experience earlier on in title work, with Peter having recently been employed in Rank’s title unit and Albert doing the same some years back at Gaumont for Hitchcock in the thirties. In an interview Peter Melrose detailed his long career by saying “In those days the main film title was almost always a visual effect. The title appeared out of the sea, blew away in the desert sand or spun out of the sky, or something like that, so in a way I learned the rudiments of producing visual effects and about cine cameras because it was one of my jobs to load and unload the camera”. Pinewood process unit at work. In the late forties it was apparently common for an artist to paint both backings and mattes before the unions in Britain put a stop to it. “I remember on many occasions assisting Albert to paint foreground glasses, with sometimes 3 or 4 stacked one in behind the other, building up the various planes of the picture or scene”. 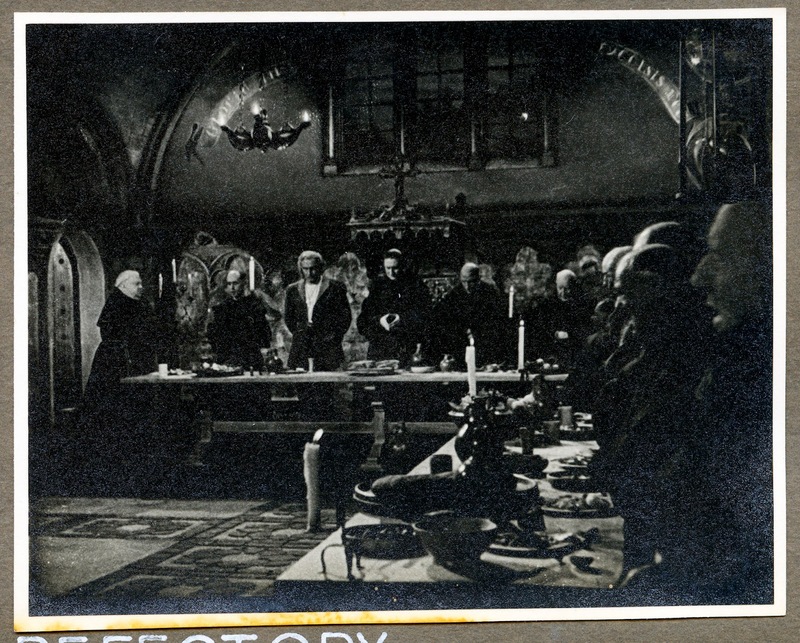 Peter remained with Rank for eight years before embarking on his own freelance career whereby he produced some memorable matte effects such as the mighty, multi-plane pullback for Polanski’s DANCE OF THE VAMPIRES or THE FEARLESS VAMPIRE KILLERS over at Shepperton with Doug Ferris and Gerald Larn. 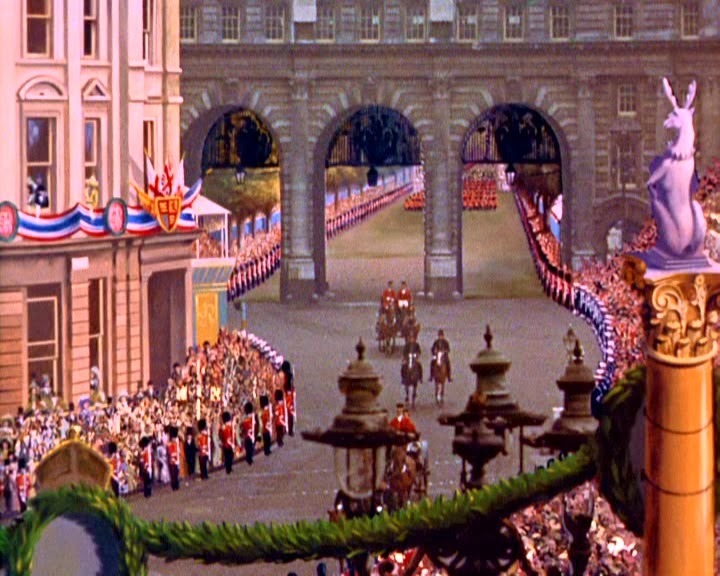 With a steady workload, Albert would continue on as one of the Pinewood matte artists, occasionally working on the UK based Disney pictures under the great Peter Ellenshaw such as SWORD AND THE ROSE until an opportunity presented itself in 1954 at the Stateside Walt Disney Studio as, at first a title artist, and then a fully fledged matte artist where he remained until 1961. 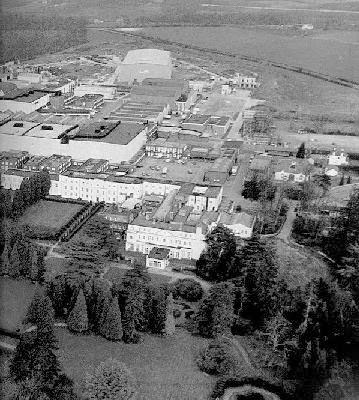 Cliff Culley was another key Pinewood name who not only started with Melrose and Whitlock, but who, in addition to being Sean Connery’s golfing partner, would continue on in the role of resident matte painter at Pinewood for the remainder of his career until he retired in the late 90’s. 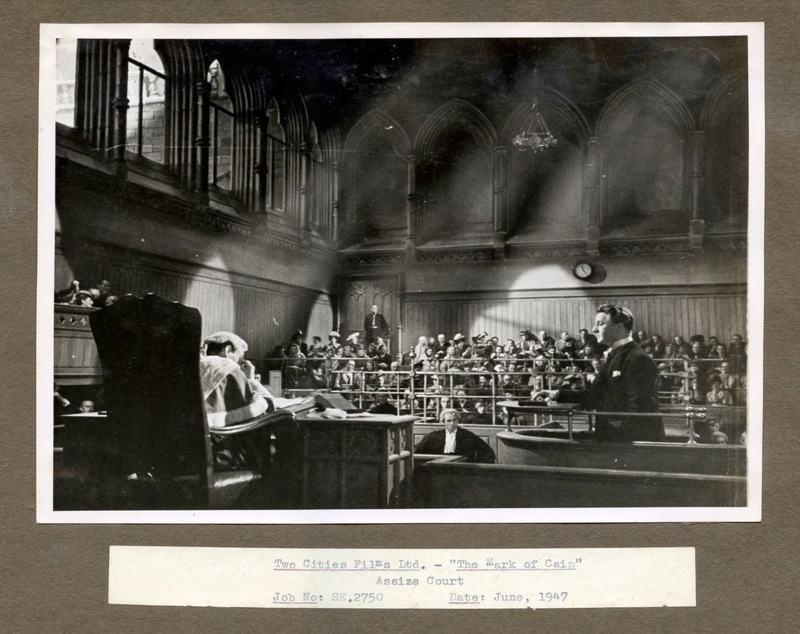 Almost all of the Pinewood pictures produced from the late 40’s to the late 80’s would have had Cliff’s hand in the show somewhere. Be they full on matte shots or models for all of those admittedly still pretty enjoyable Norman Wisdom comedies, through to the Carry On pictures, the Bond films and numerous television series. 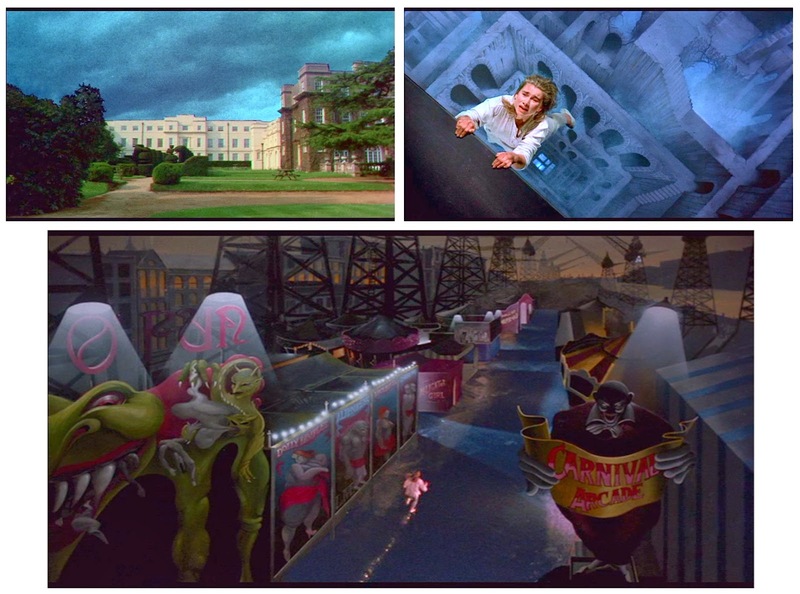 Cliff not only proved adept at matte art but also with ‘gags’ and other photographic effects such as the now famous reflection of the thug in the girl’s eye in GOLDFINGER and the Armageddon missile vapour trajectory animation for THE SPY WHO LOVED ME among numerous others. Although Cliff continued to work on the Pinewood lot, he established and operated his own effects house Westbury Design & Optical on the same site for a number of years. 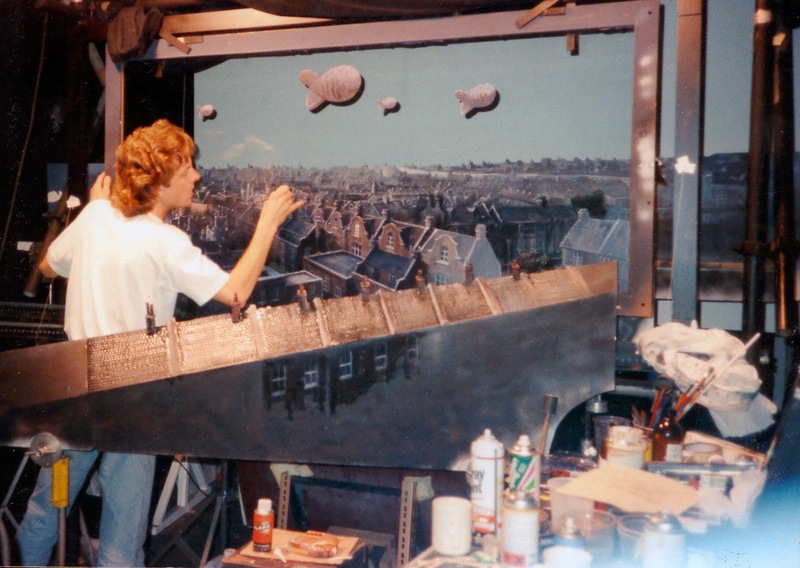 Cliff would be assisted by his son Neil Culley as cameraman, and a number of young entry level artists as trainee matte painters and effects exponents such as Steve Begg, Steven Archer, Terry Adlam and Leigh Took. Both Begg and Took have graduated onto very successful careers in visual effects, with Steve running all of the effects on the recent 007 pictures and Leigh establishing two busy effects shops specialising in mattes and miniatures, named, unsurprisingly, Mattes & Miniatures. 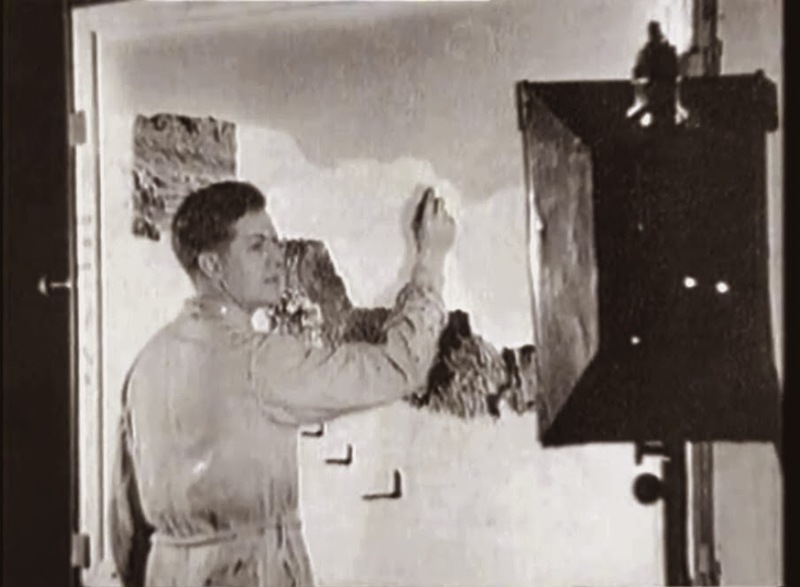 A young Albert Whitlock at work on a matte painting at Rank, circa 1946. 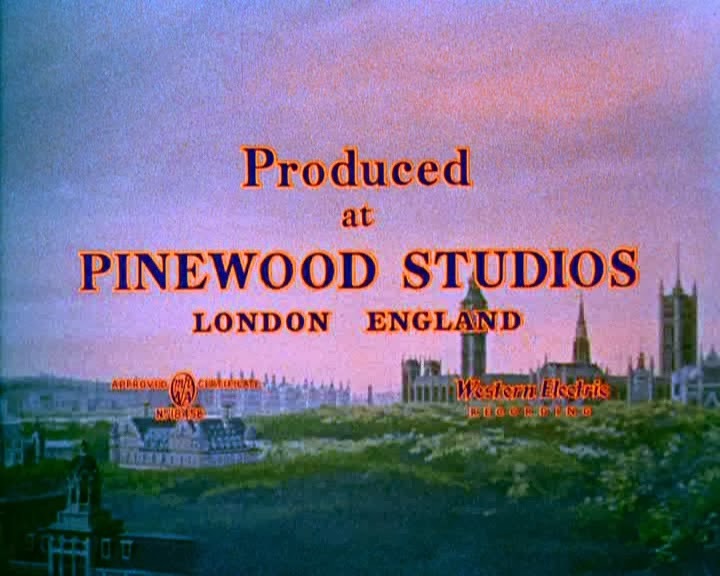 Another important name long associated with, not just Pinewood, but with the British industry as a whole as far back as 1930 is that of optical effects man Bryan Langley. 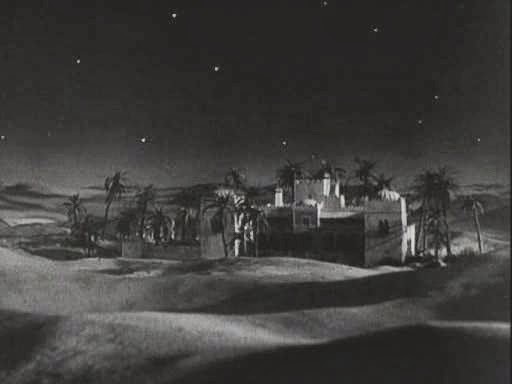 Bryan’s area of pre-eminent expertise was in the travelling matte compositing techniques which Pinewood was noted for. 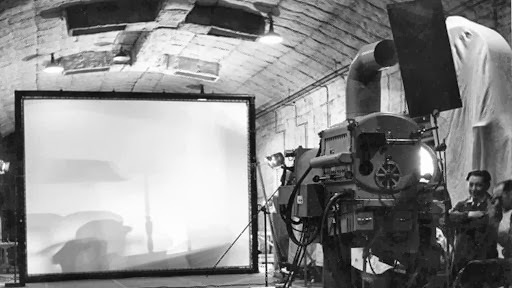 Langley, in an interview stated the importance of the travelling matte method to the British film industry: “It all really was a life saver to the British film industry because it eliminated the need of the ‘long throw’ required for large screen back projection and one could work in the smallest studio or the largest. 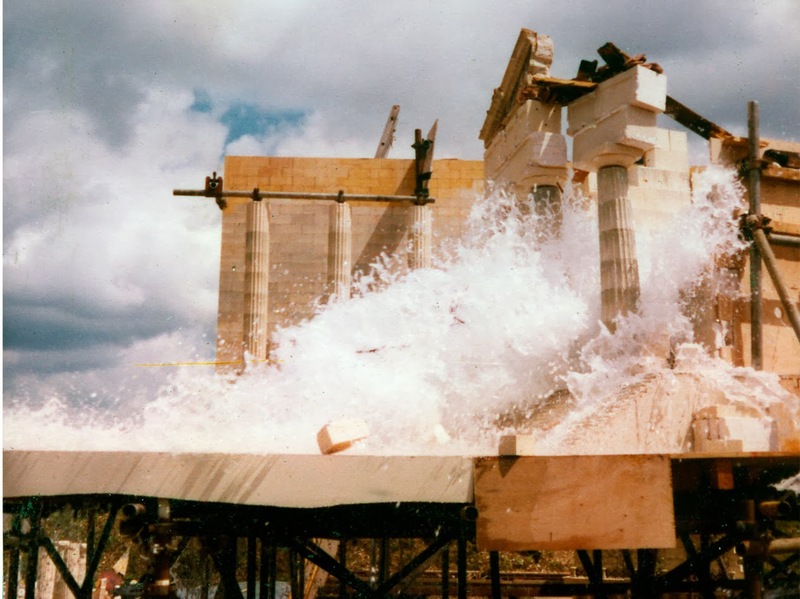 Actors could be filmed before a blue screen and the effects added later. 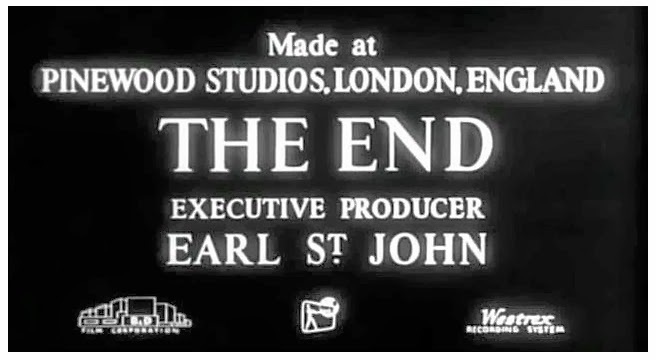 It was like sticking a stamp onto an envelope.” Bryan was compositor in residence at Pinewood for a long period and would be regularly hired out to other studios such as Elstree, Shepperton and the long gone Walton-on-Thames. 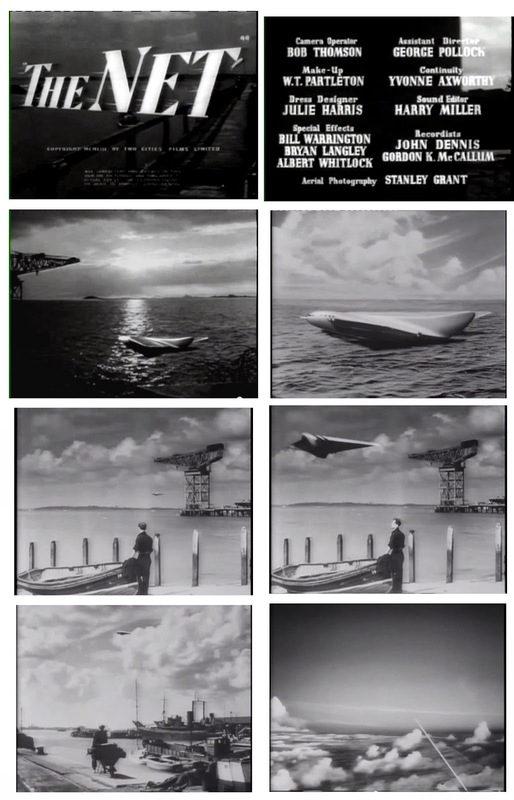 Although I’ve spotted his name often in films of the fifties, Bryan stated to his interviewer: “The absence of a formal credit and not getting credits on many films was because the travelling matte part was a very small percentage of the whole finished thing.” Among Langley’s many credits were some extraordinary opticals for REACH FOR THE SKY (1957), the excellent original Orwellian adaptation of 1984 (1956) and THE NET aka PROJECT M7 (1953). For years Bryan was assisted by Reg Johnson on the opticals. In an effort to be as comprehensive as possible (as nobody else has bothered to) – I’ve compiled as detailed a listing as I can on the many technicians, matte painters and cameramen associated with the Pinewood visual effects department. 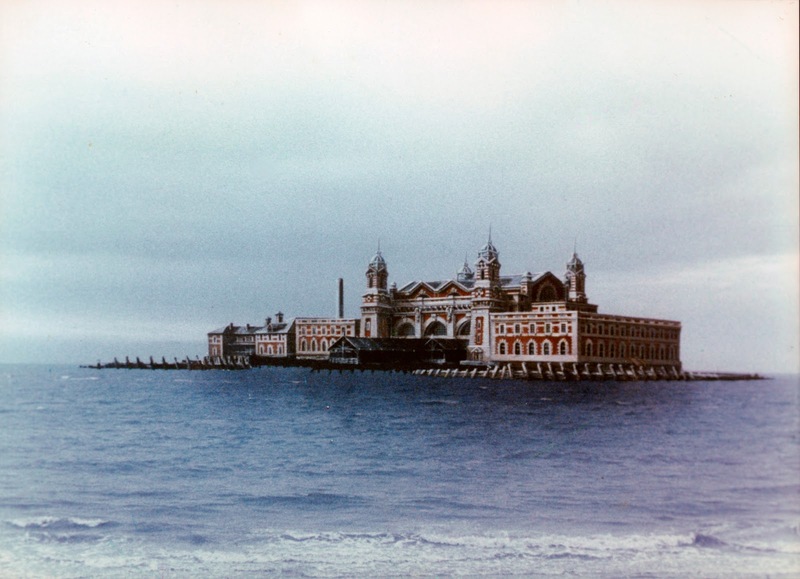 Vic Margutti and Roy Field were both concerned with composite photography, with Field having a long and successful career both at Rank and as an independent contractor, winning an Oscar for SUPERMAN-THE MOVIE (1978). Margutti was a key participant in Rank’s travelling matte work- possibly with or under Bryan Langley. Vic left Rank to form a sometimes volatile creative partnership with Les Bowie as Bowie-Margutti Films. In 1956 Margutti was lured back to Pinewood to develop the new sodium vapour matte process - which proved very successful and would be adopted Stateside by Ub Iwerks and Eustace Lycette at the Disney corporation as their travelling matte methodology of choice for decades. 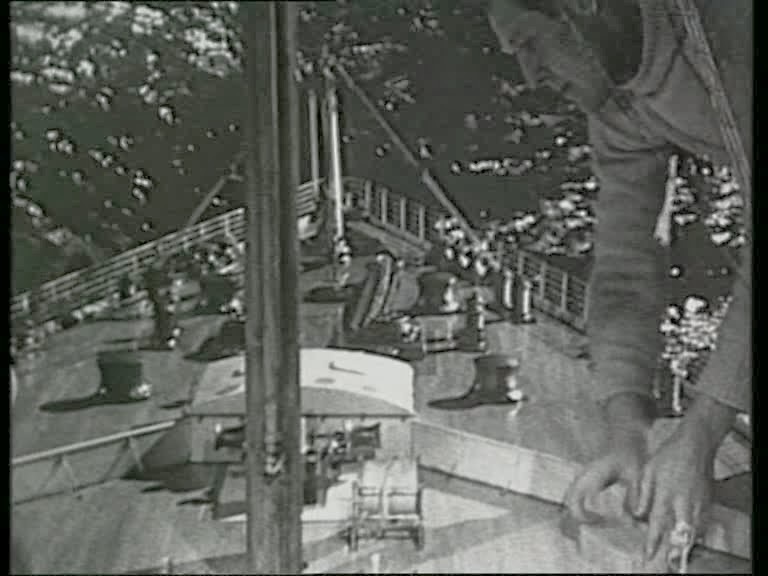 Johnny ‘Jack’ Mills was another technician associated with the optical composite process whose career went back as far as the Korda THIEF OF BAGHDAD and on through the 1950’s and 60’s and assembled the travelling mattes on Disney’s IN SEARCH OF THE CASTAWAYS (1961). 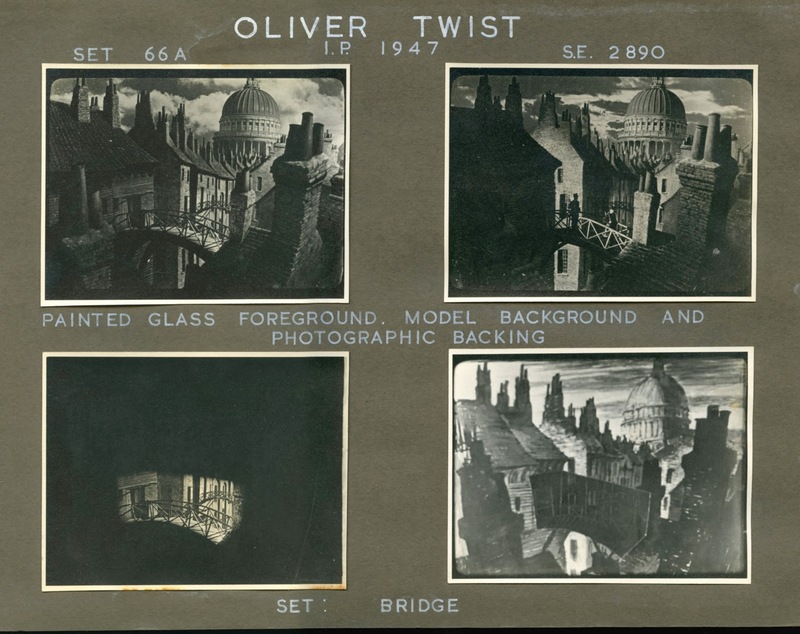 Joan Suttie as best I can discover was most likely a matte artist during the 1940’s and was possibly the chief matte artist once Bowie departed. According to Bill Taylor, Albert Whitlock sometimes mentioned working under a lady at Pinewood, though he never learned her identity. 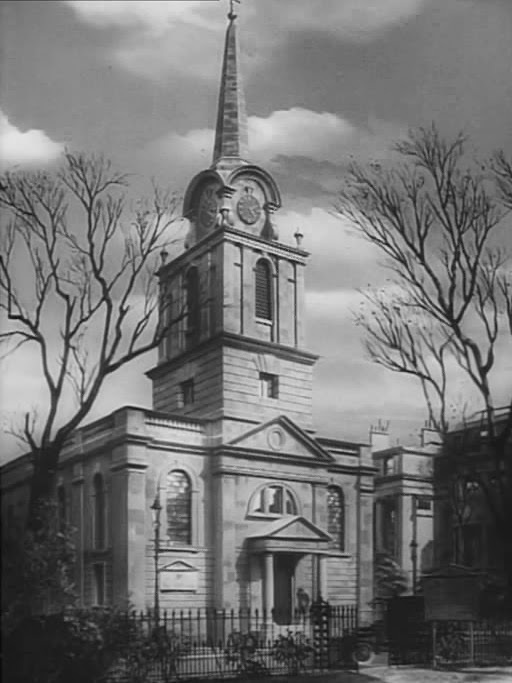 Suttie was credited on David Lean’s OLIVER TWIST and UNCLE SILAS, though it was Les Bowie who largely painted on the Lean film, so who knows? 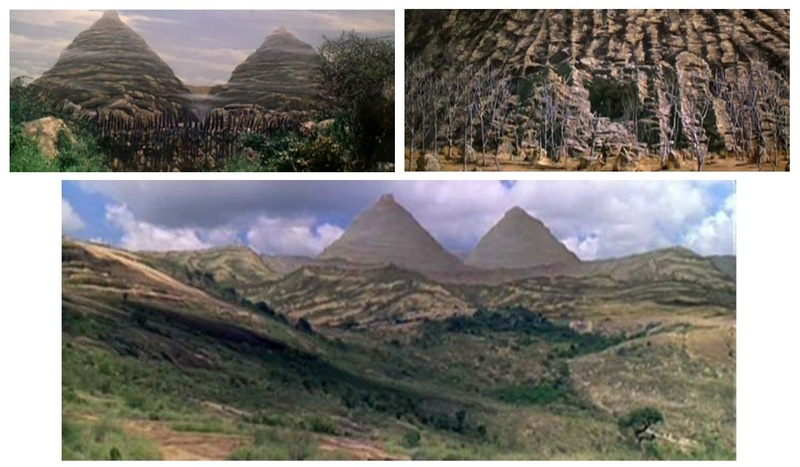 I'm fairly confident that Suttie was that head matte painter. 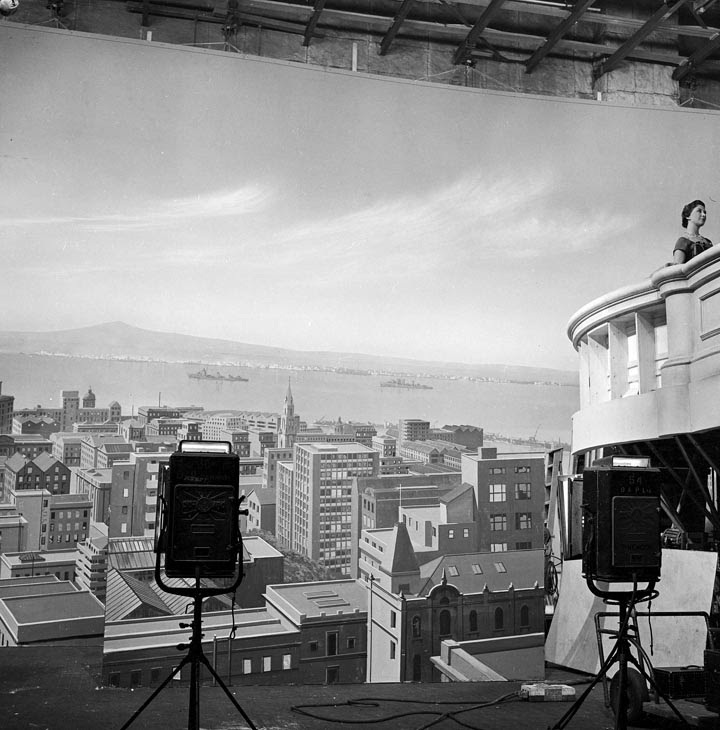 Bob Bell and Charles Stoneham were both matte painters at Pinewood, with Bell being active in the matte unit until around 1958. I believe Bob moved into art direction and later worked with Derek Meddings on the Gerry Anderson shows and was involved with the under rated JOURNEY TO THE FAR SIDE OF THE SUN feature film. Bob came out of retirement in the late 80's to assist Culley with the many mattes for the Clive Barker film NIGHTBREED. 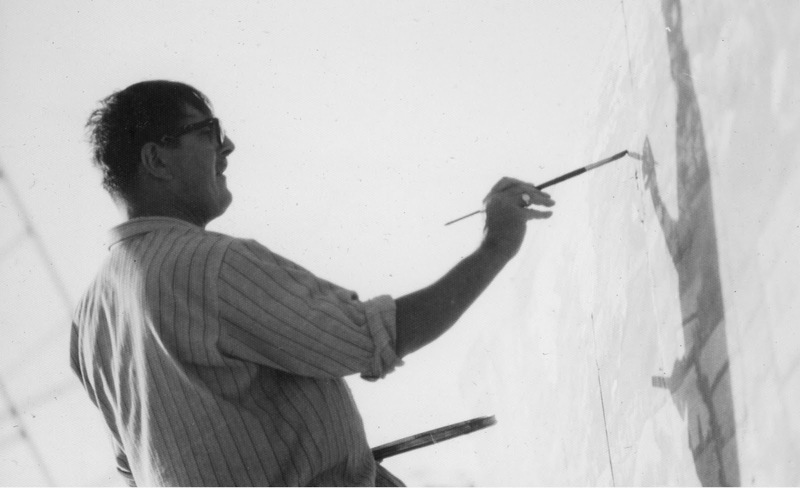 Charles came along much later than Bell – maybe in the 60’s when Cliff Culley apparently found him working in the stores dept at Pinewood and upon seeing his artwork persuaded Charles to join him in the matte unit. Stoneham painted on numerous films through the 1980’s such as THE DARK CRYSTAL, BRITANNIA HOSPITAL, GANDHI and THE LAST DAYS OF PATTON. Stoneham would work often with Roy Field and John Grant on a variety of projects. 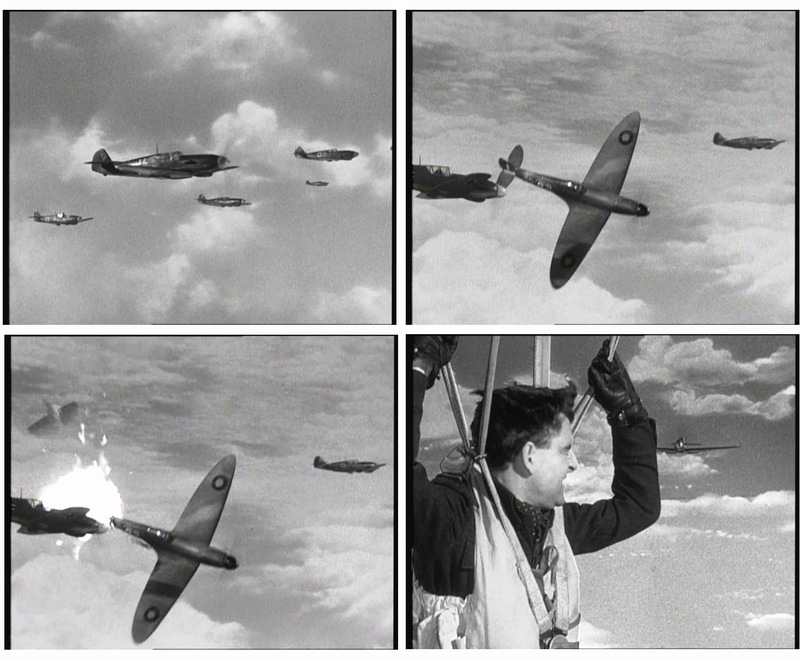 Interestingly, the well known English effects man John Stears began his effects career at Pinewood on the classic true story REACH FOR THE SKY (see left) in 1956 as a model maker and moved for a time into matte painting and stop motion during the 1950’s as well before settling back into practical effects and becoming one of Britain’s best known (and reputedly most highly paid) special mechanical effects men on shows such as STAR WARS. 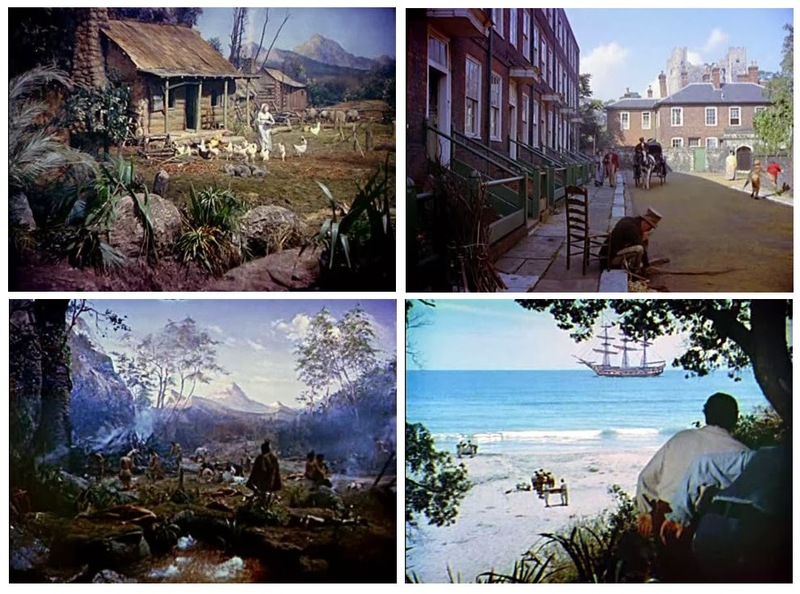 Alan Maley was in the Pinewood matte department for a time as well and along with Cliff Culley assisted Peter Ellenshaw on the scores of high end mattes and other effects for the huge Disney effects show IN SEARCH OF THE CASTAWAYS (1961). Maley was mainly based at Shepperton Studios under Bob Cuff and Wally Veevers around this period so I assume Alan’s tenure at Pinewood was a brief career sidestep. Alan was eventually hand picked by Ellenshaw to replace Al Whitlock at Disney in the States around 1963 from which he would run the matte department at Disney. 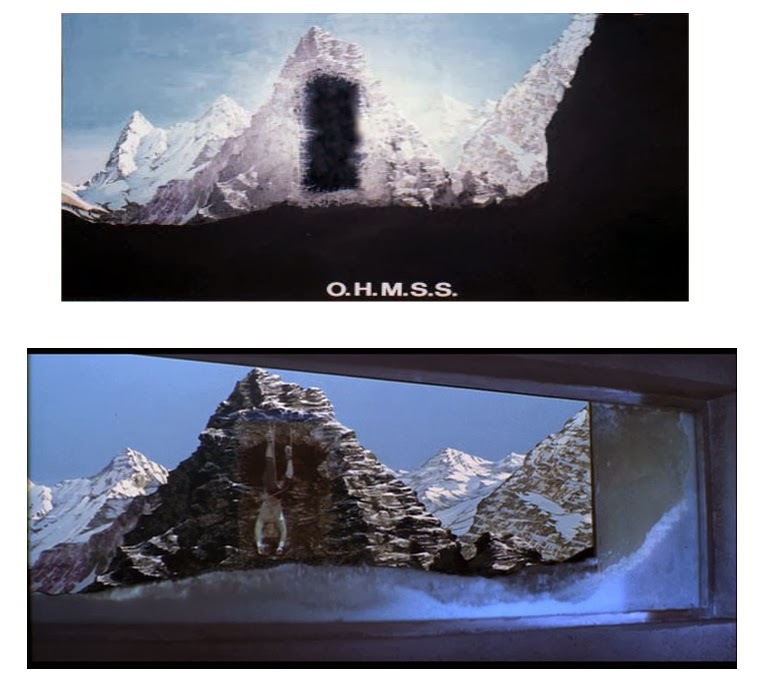 Maley would return to Pinewood for a number of highly creative matte effects for the 1977 Bond picture THE SPY WHO LOVED ME – arguably the best of the series. 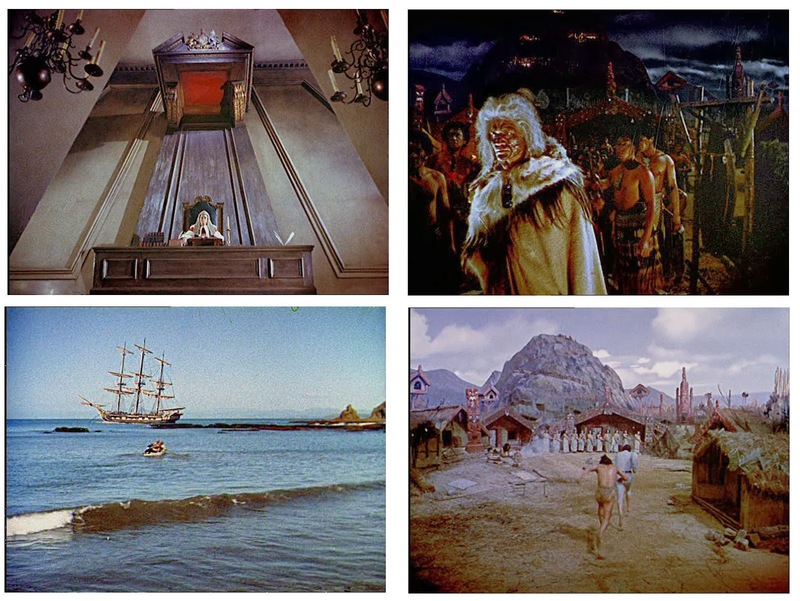 Bert Marshall, Henry Harris & Stanley Grant were all visual effects cinematographers, with Marshall employed as chief miniatures and matte shot cameraman, with all three on the payroll through the 1940’s and 50’s. All received various screen credits on a variety of projects. 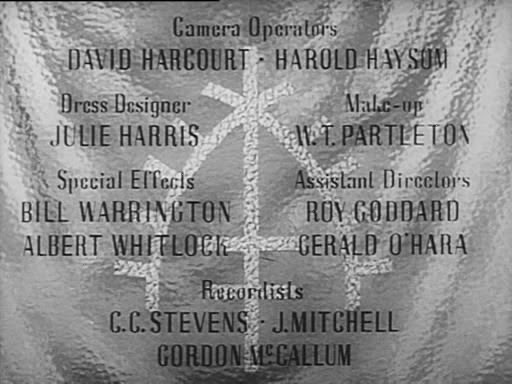 Additionally, James Bawden and Bernard Ford were camera operators on the miniatures unit. 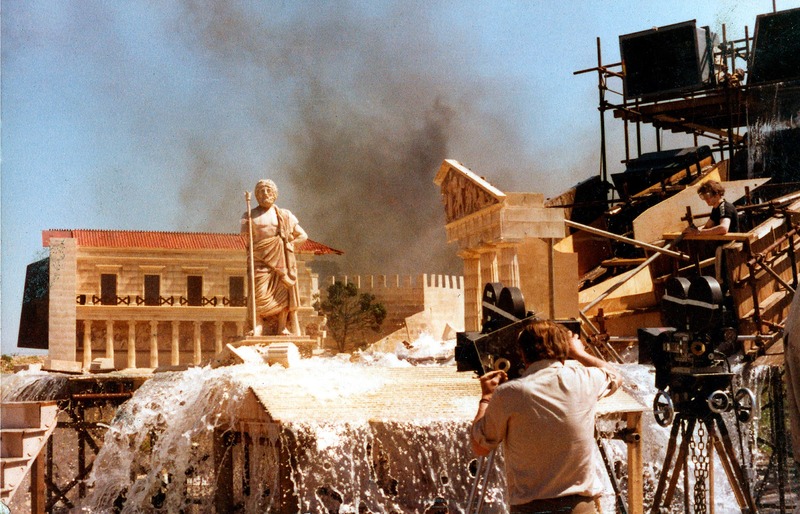 Shooting a James Bond title sequence. Martin Shorthall was matte cinematographer for Cliff Culley through the 1960’s and 70’s on such films as CHITTY CHITTY BANG BANG and YOU ONLY LIVE TWICE and would also work on those Bond films imaginative title sequences with master designer Maurice Binder along with fellow visual effects cameraman Robin Browne, who’s career dated back as far as A NIGHT TO REMEMBER (1958) and SINK THE BISMARK (1960) – both big effects movies. T.W Stubbs and L. Boyes were additional members of Culley’s matte crew in the 1960’s. The Pinewood matte department in 1961 as depicted in this joke set of jailhouse mugshots made expressly for Peter Ellenshaw when he was there overseeing the complex effects work for IN SEARCH OF THE CASTAWAYS. 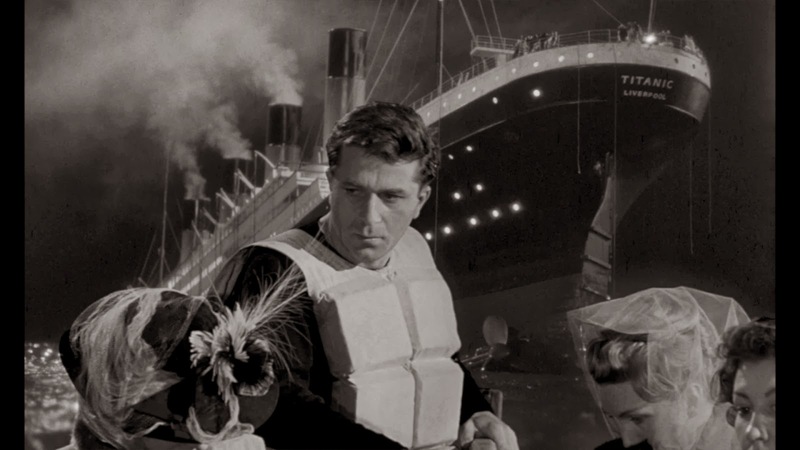 From left to right: Camera assistant T.W Stubbs; Chief matte painter Cliff Culley; Matte assistant L.Boyes; Effects cinematographer Martin Shorthall; Matte painter Alan Maley. 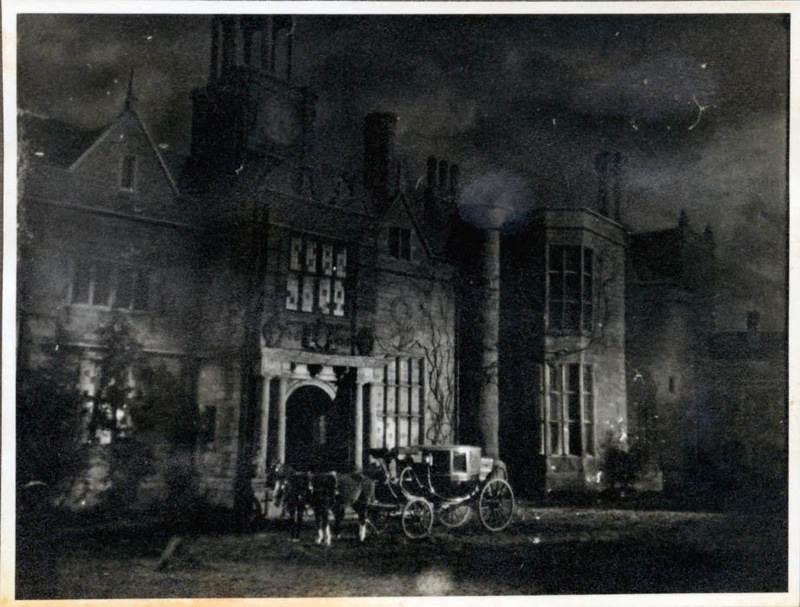 Charles Staffell's Pinewood process set up. 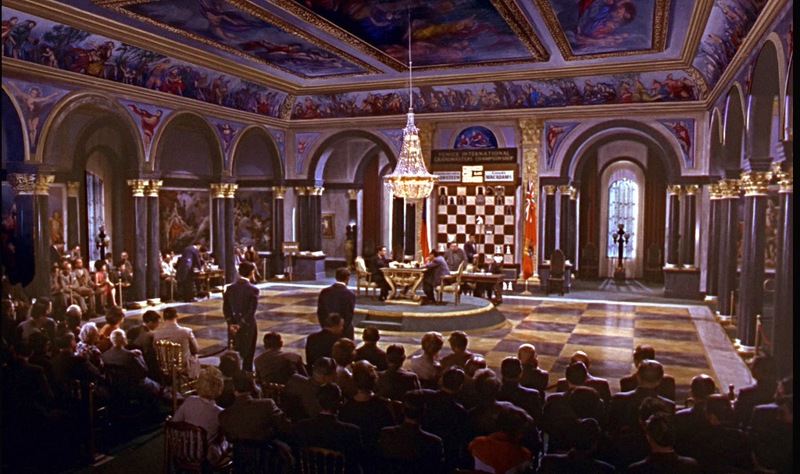 Douglas Woolsey, Jack Higgins, Frank George, Sydney Pearson and George Blackwell all played a part in building and supervising miniature effects at various periods in Pinewood’s history, with Blackwell in particular being noteworthy for excellence in this arena, with credits on big pictures for several studios through the 1940’s through to the 1960’s. 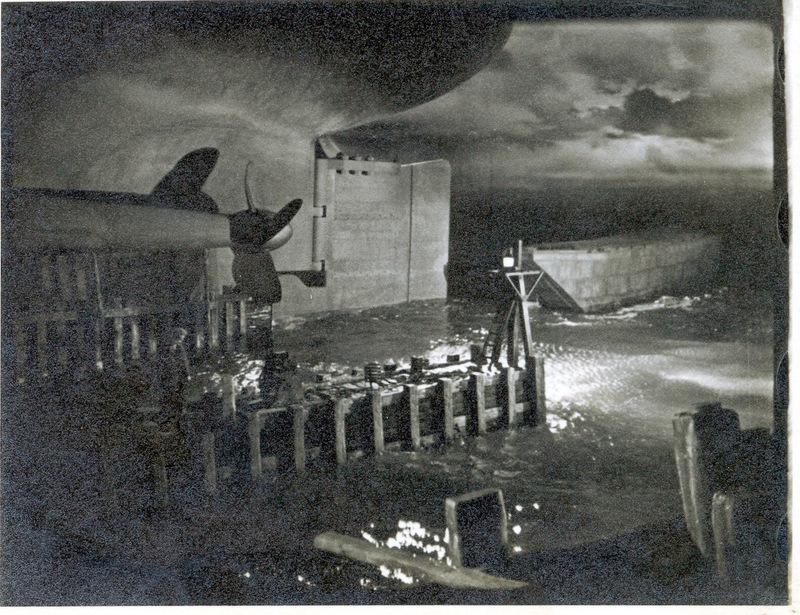 Doug Woolsey specialised in model work of ships and airplanes and contributed to several wartime pictures such as the excellent model work in Noel Coward’s IN WHICH WE SERVE (1942) and some invisible hanging miniatures for David Lean’s GREAT EXPECTATIONS (1946) with remarkable foreground miniatures to fill out grand ballrooms and so forth to great effect. Lastly, the Pinewood process unit were leaders in the field. 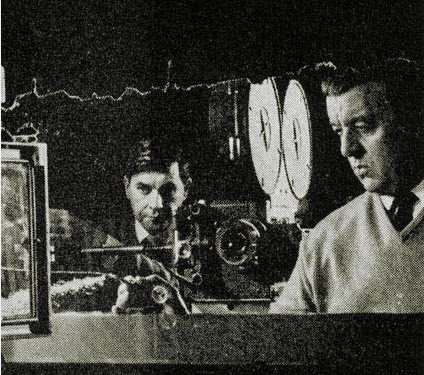 Charles Staffell (pictured at right) and Syd Howell ran the set up from the mid 1940’s with Staffell developing the technique to much advantage later on to include triple head process projection and also high resolution reflex screen front projection whereby Staffell was one of the pioneers of the process. Rank's process projection units - both motion 35mm and still transparency set ups. What follows is a pretty comprehensive review of the many miracles created under the Pinewood flag, some of which will be familiar and many totally fresh to the special effects afficienado. The excellent 1956 version of the timeless George Orwell exercise in state sponsored paranoia, 1984. Now, I'm unsure if this film is an actual Rank picture but I'm including it as key Pinewood effects men Bryan Langley and George Blackwell executed the vfx which leads me to think Cliff Culley may have painted the mattes. Blackwell's miniatures of the city are noteworthy. Big brother was watching these film makers I'm certain. A tremendous push in from the heavens from 1984. Miniatures by George Blackwell. A pair of mattes, supervised by Les Bowie, from the 1948 film BLANCHE FURY. 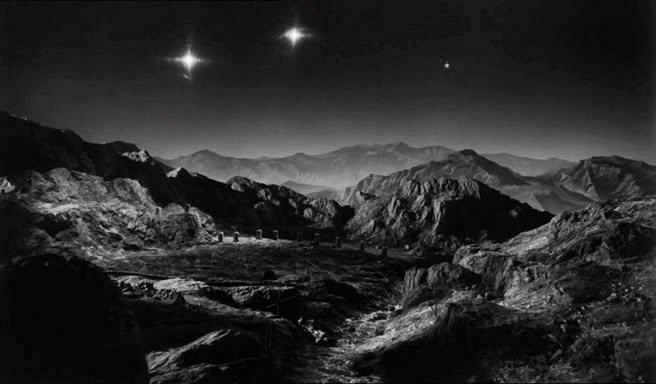 A delightful treat is this super rare Les Bowie matte shot from BROTHER JONATHAN (1947). 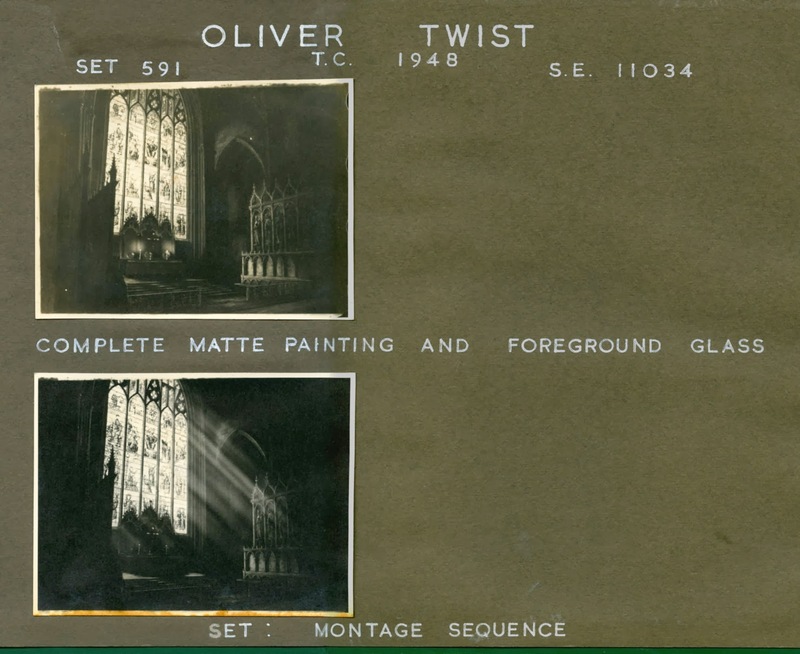 Pinewood would catalogue all of their effects shots on these file cards, often with technical specifications for every film. Matte painter and former Cliff Culley protege Leigh Took rescued many from the garbage skip one day when Culley decided to have a clean out. Like me, Leigh values the artform of old. Matte from the WWII picture APPOINTMENT WITH VENUS (1951). Venus, by the way, is a cow! 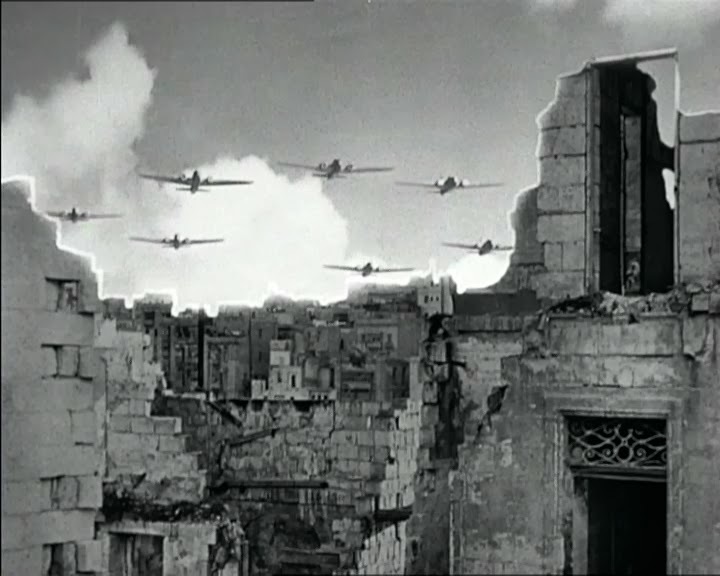 Also from the same film is this scene of painted devastation courtesy of the Luftwaffe. In an attempt to re-awaken the wonders of Korda's THIEF OF BAGHDAD, Kevin Connor produced ARABIAN ADVENTURE (1978) to mixed result. Lot's of Cliff Culley mattes and all too obvious model shots and Mickey Rooney as a pissed off hermit. 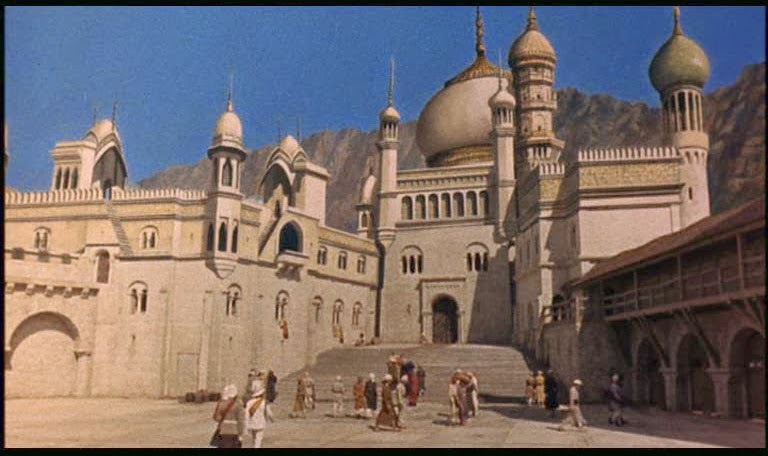 Cliff Culley matte, assisted by a young Leigh Took: ARABIAN ADVENTURE. 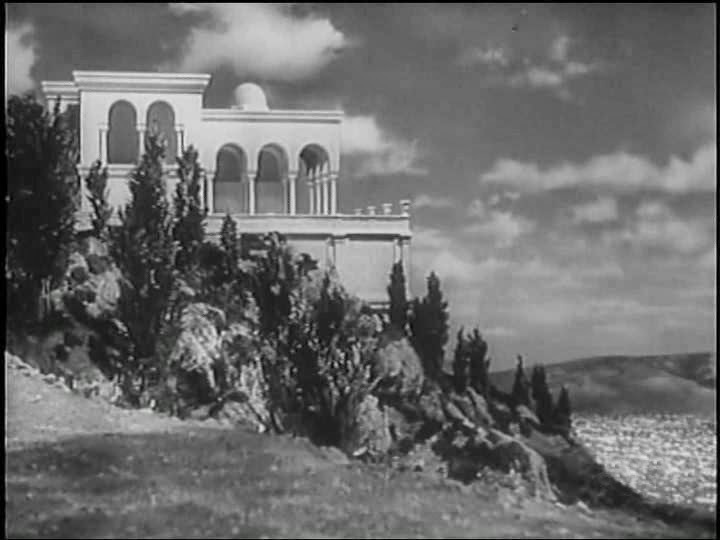 Same film. I liked this shot. Some nice sleight of hand where Oliver Tobias performs in front of a process screen with model/painted plate, and then he darts out of frame and reappears as part of the already composited back projection plate and proceeds to swash his buckle with bad guy. The sort of trick shot John Fulton would have employed back in the old days. Works well. 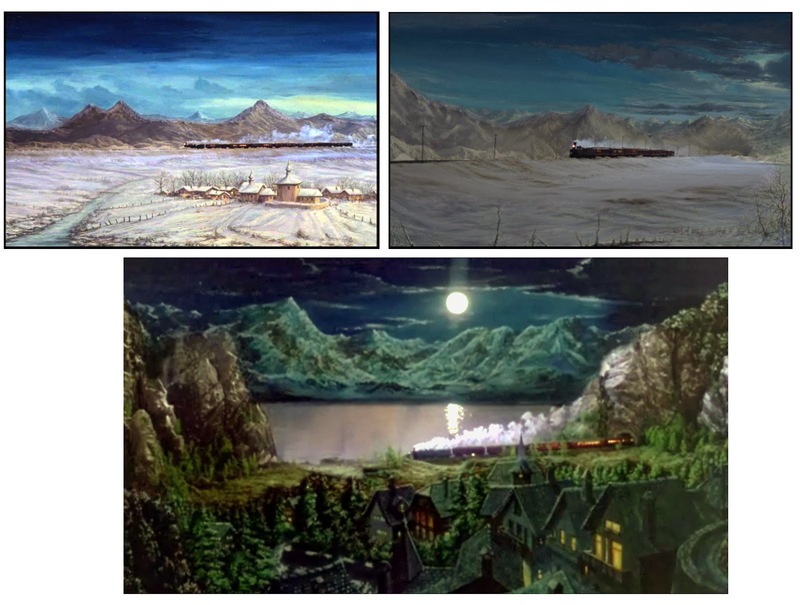 Same film, with curious combination of painted foreground against rear projected miniature mountains. The hot spot gives the game away. Interestingly, Culley and Whitlock would employ painted glass foregrounds against models as far back as the 1940's and 50's to allow a broader depth of field with slow film stocks and lens optics. 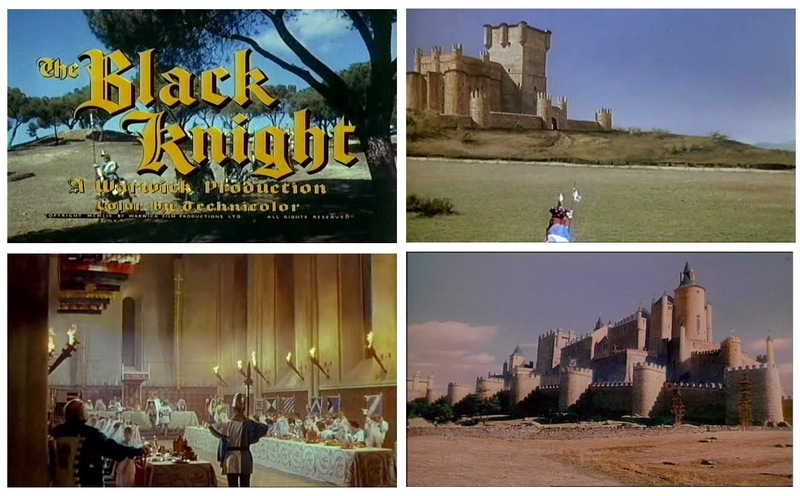 The grand 1954 costumer THE BLACK KNIGHT featured a number of good mattes. 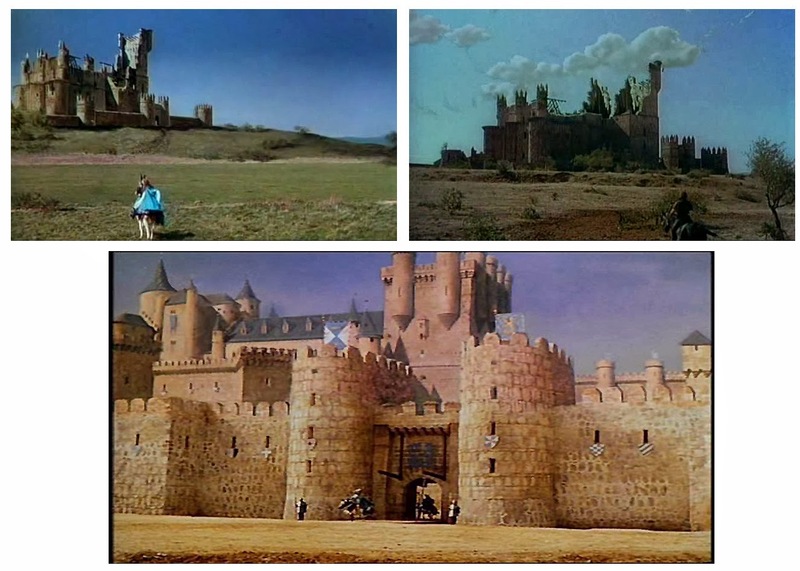 Note the shot at lower right is a multiple element matte composite whereby the main castle is partly a real Spanish fortress at Segovia, while the walls are from another different Spanish site at Avilla which has then later been adapted and extended by Culley's matte department to extend the shot somewhat - all quite invisibly. 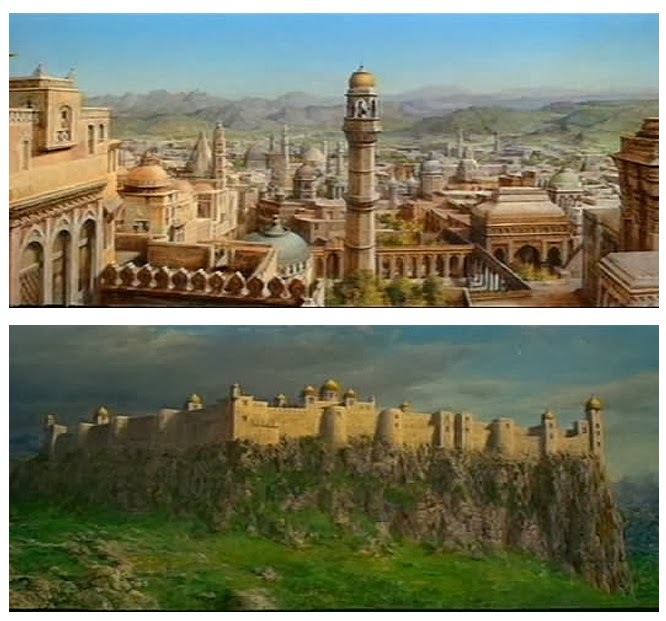 The same medieval structure would also be adapted some time later by Ray Harryhausen for the dire SINBAD AND THE EYE OF THE TIGER through use of miniature add ons. Also from THE BLACK KNIGHT. It's possible Albert Whitlock may have had a hand in some of these as he was in the process of moving to the USA. Bob Bell and Peter Melrose were active at Pinewood too. 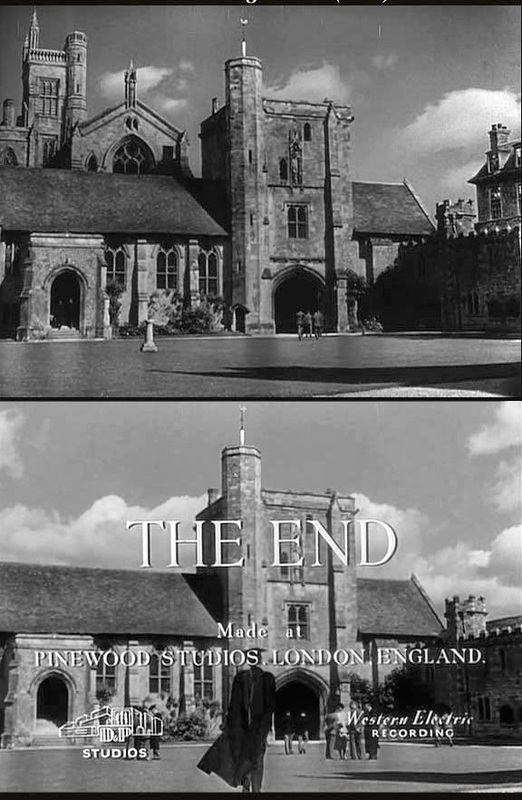 An intriguing before and after from the wonderful 1951 film THE BROWNING VERSION - both of which appear in the film! The flawless painted extensions would fool even an expert, and it's not until the end credits pop up do we see the same shot 'unmatted' in error. Very odd editorial choice, but us matte fans thank them for it. As an aside, the 1990's remake is brilliant, with Albert Finney never (I repeat, never) better. Two thumbs up from NZPete. I've always a soft spot for goofy comedic trick work, and this wacky cel animated sequence from the out of this world Norman Wisdom slapstick show THE BULLDOG BREED (1960) is a great example. Ole' Norm is inflated like a life raft and blasts off across the harbour like one of those god-awful jet ski's (an abomination against mankind and should all be seized and crushed as should the wankers who own them ... though I digress). Nifty animation and time consuming hand roto and effects must have put pressure on Cliff' and Roy. More great Culley painted mattes from THE BULLDOG BREED. Interesting as the dog and Norman are both added into full frame paintings via travelling matte, much like today's insistence on 'virtual sets' and bloody green screens! Culley matte composite from THE BULLDOG BREED, with effects animation of Wisdom motoring through the sea. Norman hangs on for grim death... BULLDOG BREED. 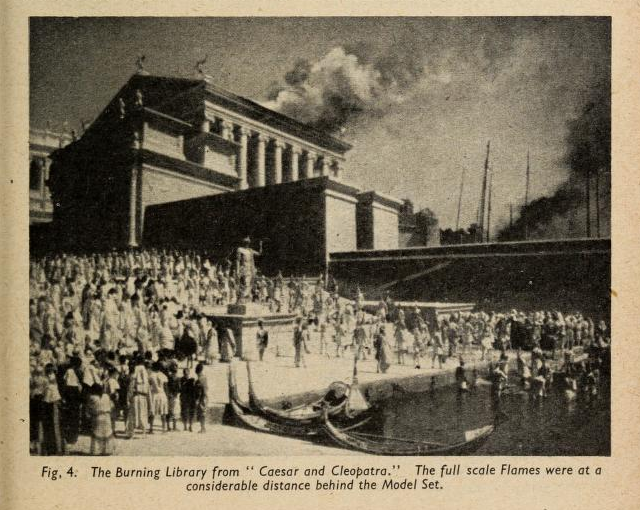 The big 1945 epic CAESAR AND CLEOPATRA featured some astounding effects, though interestingly, even as a Rank film (made at Denham in all probability) all of the mattes were painted by Pop Day, several huge miniatures were handled by Bill Warrington, Douglas Woolsey and Henry Harris. 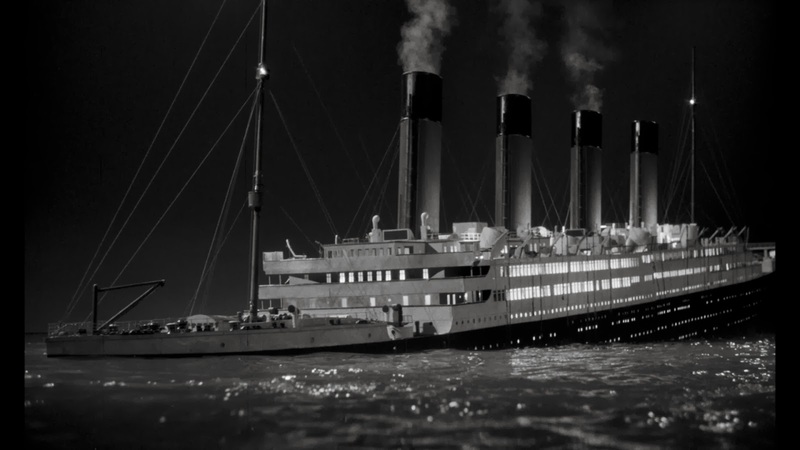 Art director John Bryan stated that this model and some others were miniatures, though a term which should not be taken too literally, as some of the miniatures were thirty feet in length and there are more models in this film than one would suspect. The shot as seen in Technicolor as intended. Through the mid 1970's Disney based a number of their productions in the UK, with Cliff Culley providing mattes and effects, sometimes assisted by future stop motion expert Steven Archer. The film is CANDLESHOE (1977). Albert Whitlock painted on the 1946 film CARAVAN. 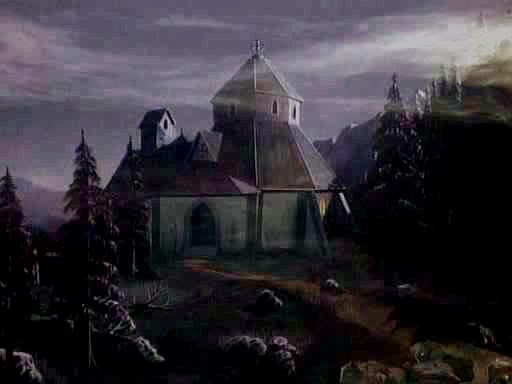 The celebrated British matte artist Albert Julion also worked on the film and would become a leading matte exponent at Shepperton. Whitlock sometimes referred mysteriously to "my mentor in England" and I wonder whether Julion may have been just that mentor? 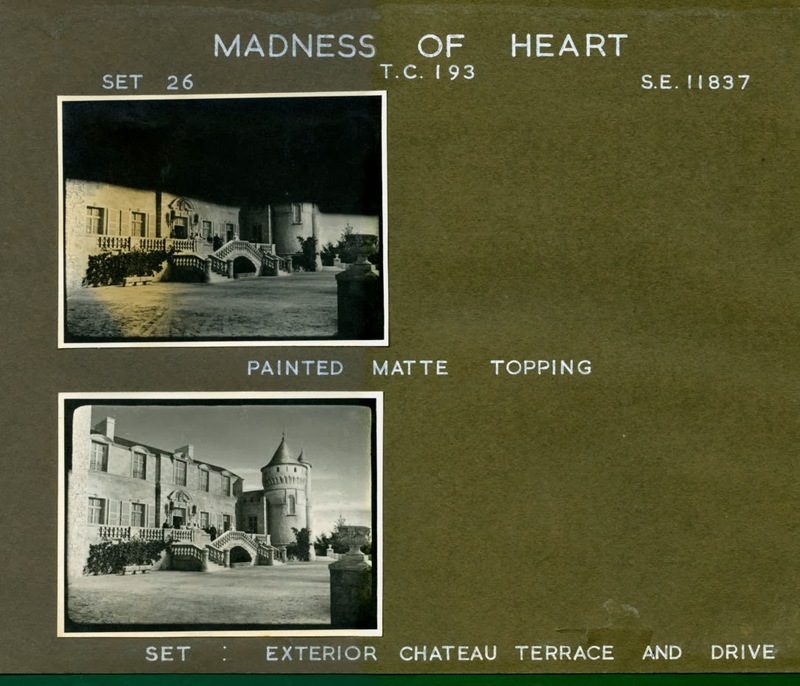 Another of those wonderful old Rank matte dept proofsheets - this from CARDBOARD CAVALIER (1949). 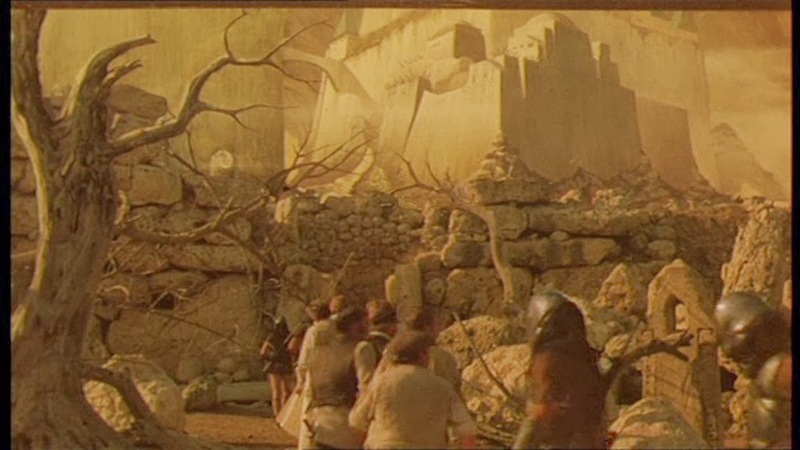 Effects credited to Bryan Langley and Bill Warrington, though I'm told by Leigh Took that Les Bowie was matte painter. One of the many entries in the long running CARRY ON series, with this being CARRY ON CLEO. 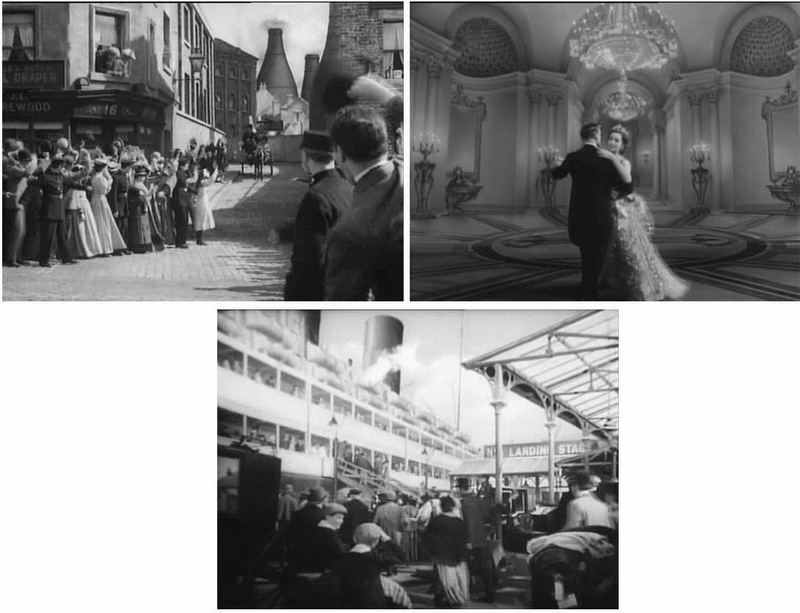 The shot at bottom left is in fact a stolen shot from CAESAR AND CLEOPATRA, a vast 30 foot miniature of the marketplace according to British Kinematograph. Not entirely sure if the 1967 CASINO ROYALE qualifies as a Pinewood film, though the mattes were farmed out to Les Bowie and Ray Caple. 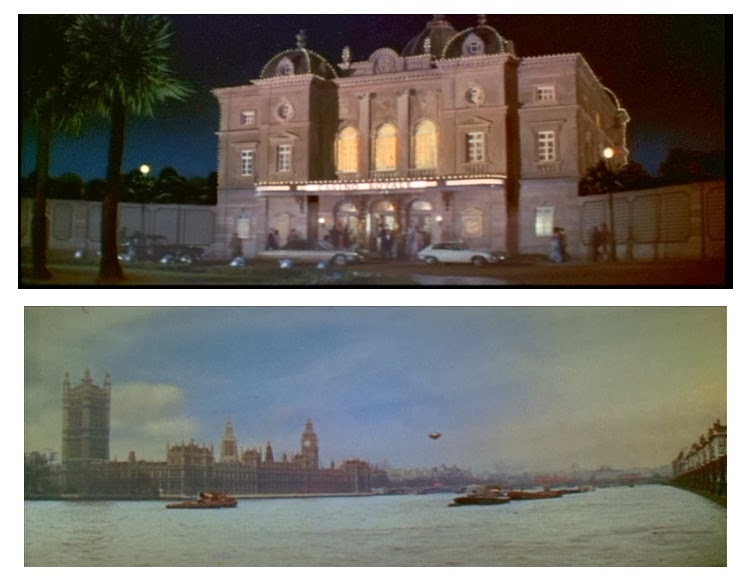 Two more matte comps from CASINO ROYALE which may not belong here, but what the hey! 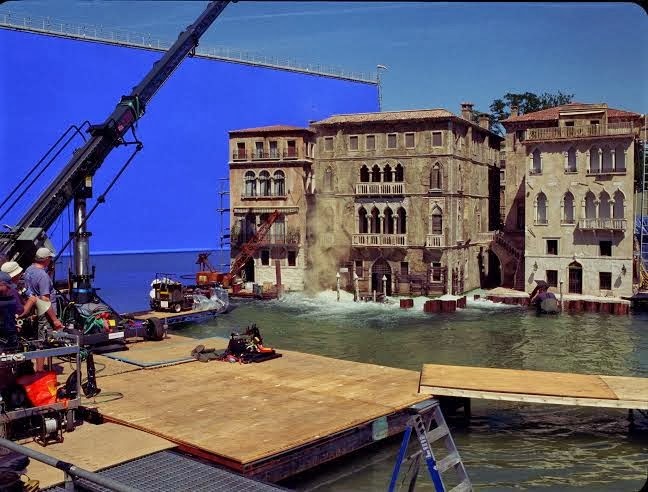 As seen on screen with Steve's miniature set flawlessly combined with actual Venetian locale. Those miniatures will collapse most convincingly in a terrific action sequence. 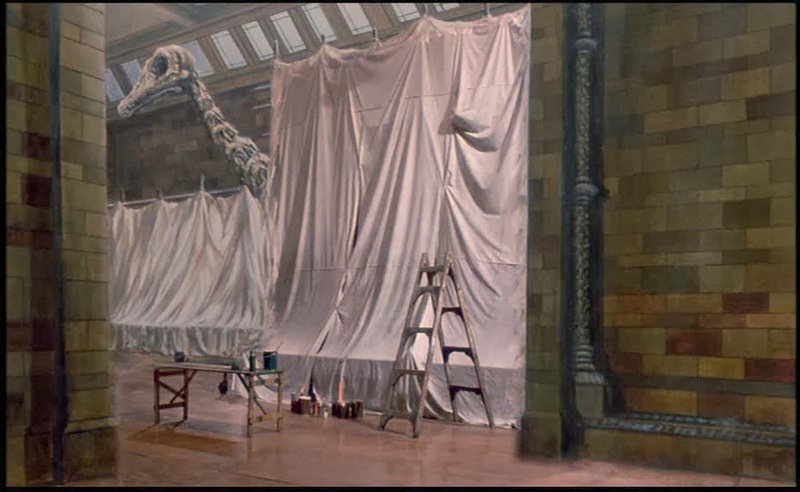 Leigh Took at work on a multi plane matte painting for the Keifer Sutherland wartime drama CHICAGO JOE AND THE SHOWGIRL (1988). Another view of the same matte set up, with motion control rig in foreground. 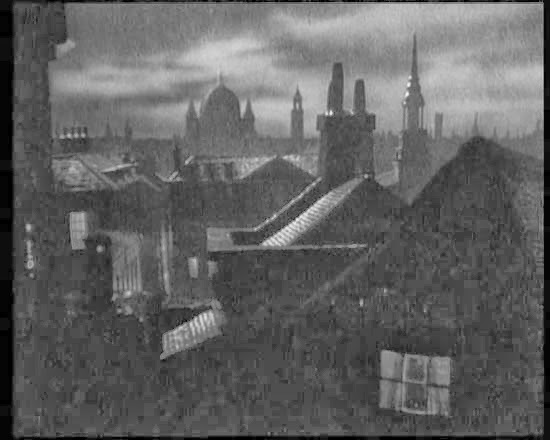 The finished shot as it appears on screen, with a bold camera move from the people in the window up and out to reveal London during the blitz. A brief shot, and so dark it's hard to spot in the film and seemed an awful lot of work that was not properly exploited. 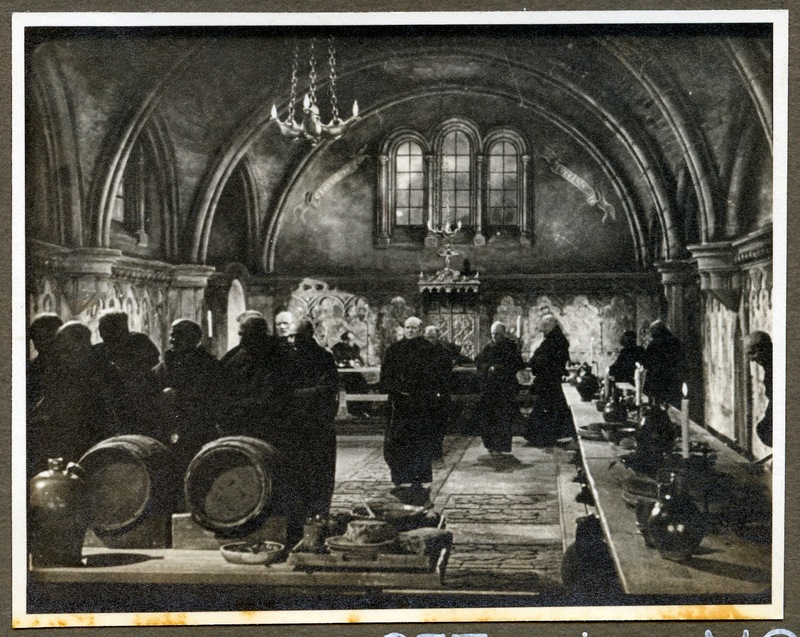 An interesting look at the Pinewood matte room set up for a shot in CHITTY CHITTY BANG BANG (1968). 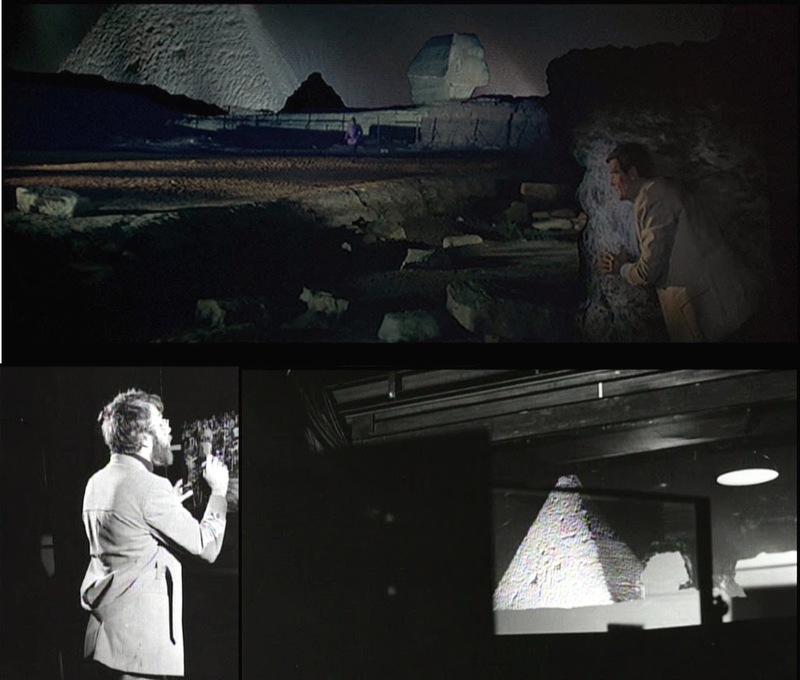 At top left we can see matte artist Cliff Culley visible through the clear, unpainted area of the matte glass while the process projectionist threads up the 65mm rear screen projector. 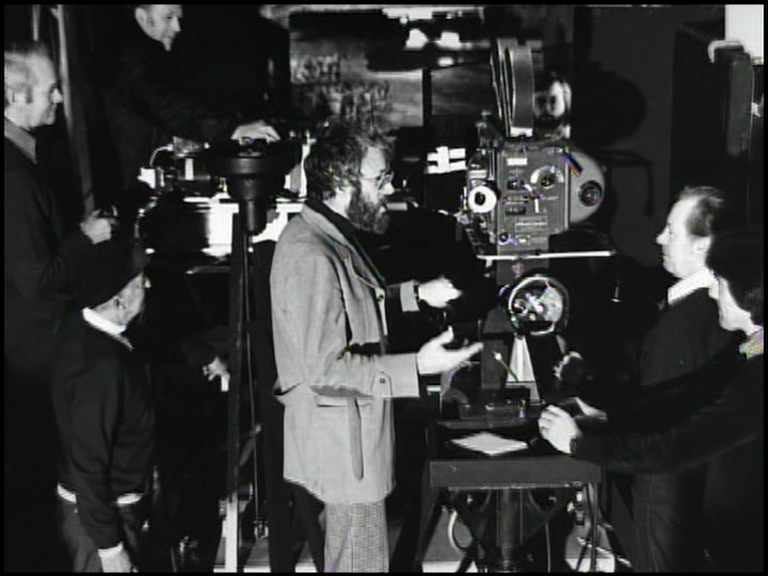 At top right we see the same set up from the other side of the glass (note matte line demarcation), where the projectionist sets up the carbon arc while cameraman Roy Field prepares the 65mm matte camera as Culley adds finishing touches to blend the matte line. Before and after location plate photography for above. 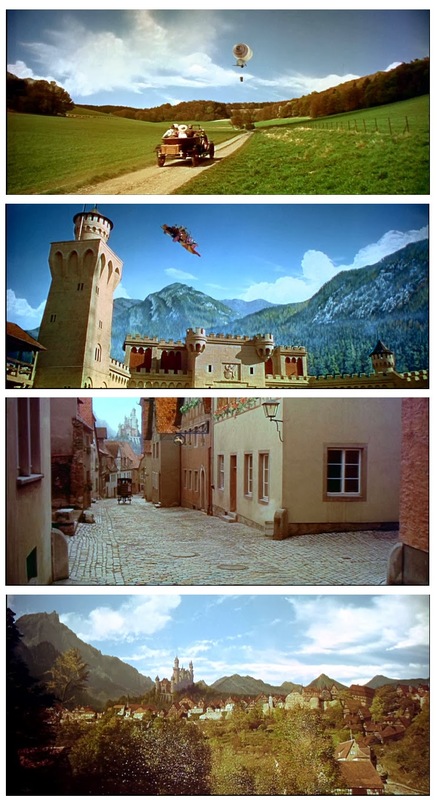 Some more 65mm Culley shots from CHITTY CHITTY BANG BANG. Another nice painted matte comp from the same film. 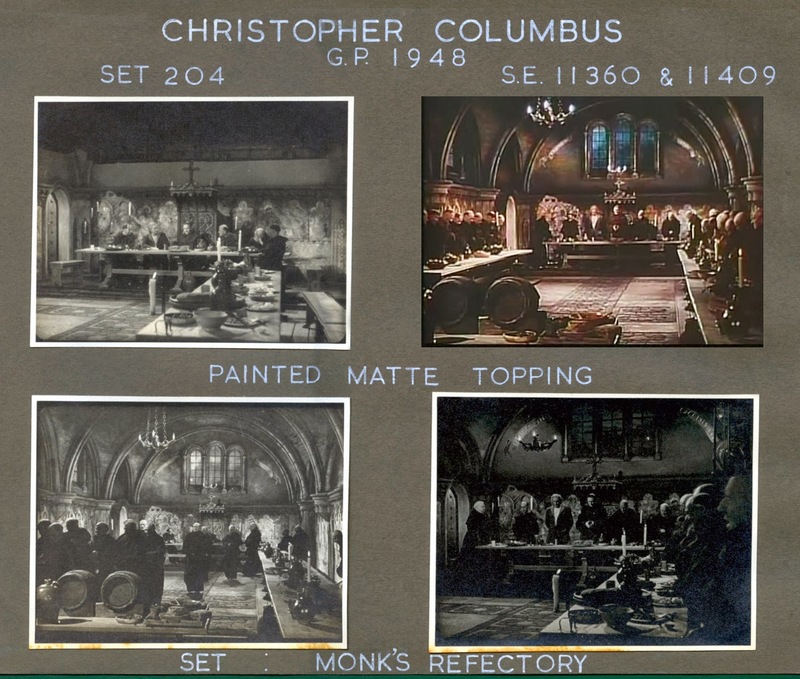 Supposedly Albert Whitlock's first on screen credit, CHRISTOPHER COLUMBUS (1949) featured matte art, miniature ships and what I suspect at lower right, to be a Guidobaldi hanging miniature ceiling. Closer view of Whitlock's monastery interior. Another close look at shot #2. 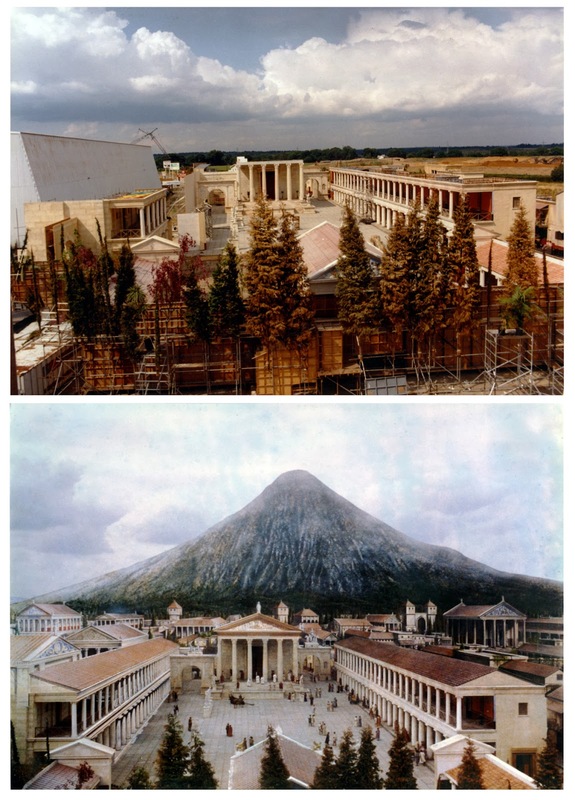 On Ray Harryhausen's CLASH OF THE TITANS (1980) the Pinewood fx unit provided a number of services, with Cliff Culley in a change of roles as 'special miniatures' man, assisted by Leigh Took. 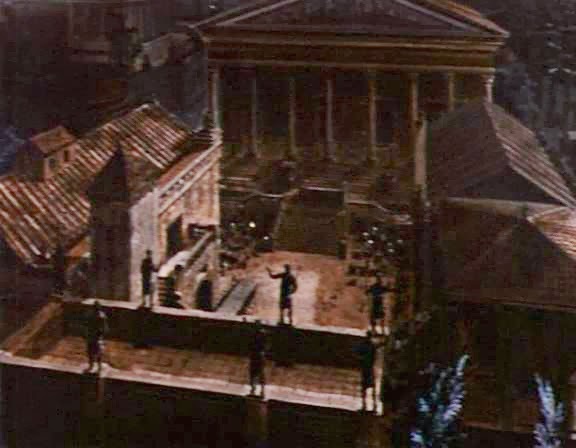 Most of the top ups of sets such as this were made employing matted in miniatures - Harryhausen's preferred modus operandi. Another CLASH composite, though this looks painted to me rather than a model. 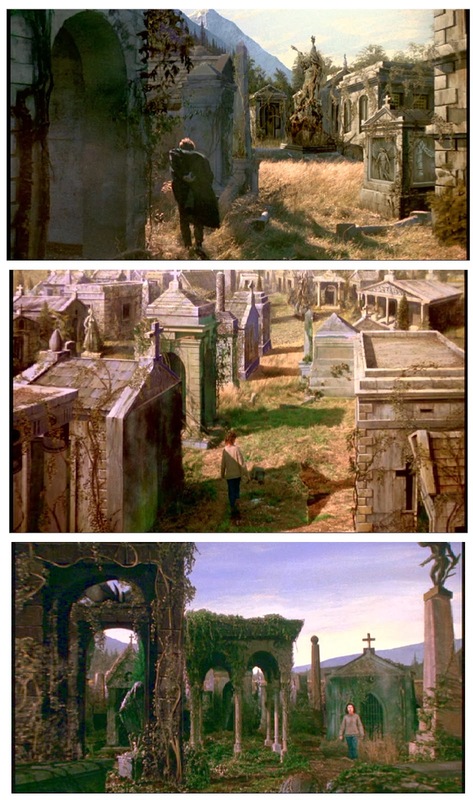 Same film - I've always liked this sequence. Still looks great. Miniatures supervised by Cliff Culley and photographed by his son Neil. Optical composite overseen by Roy Field. Neil Culley shooting high speed model break up on the Pinewood backlot. 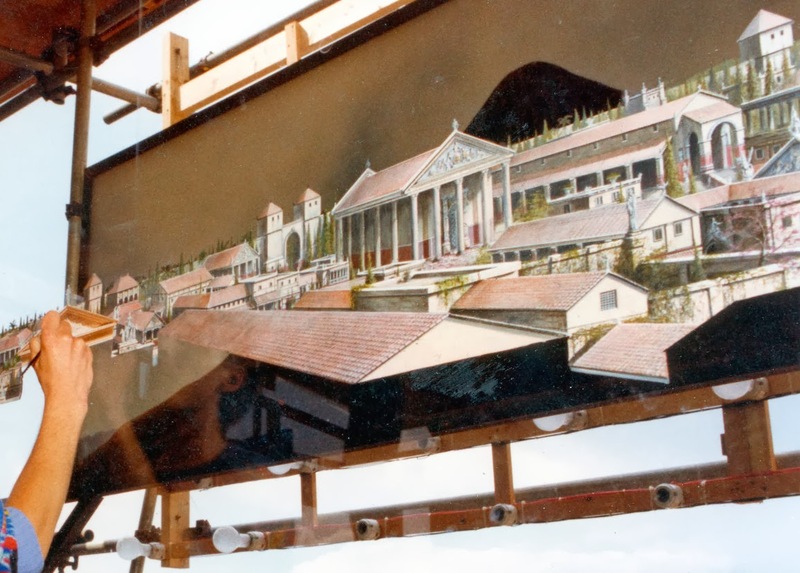 One of the vast scenic backings painted for CLASH OF THE TITANS with Leigh Took shown at right and possibly Cliff Culley at work on backing? 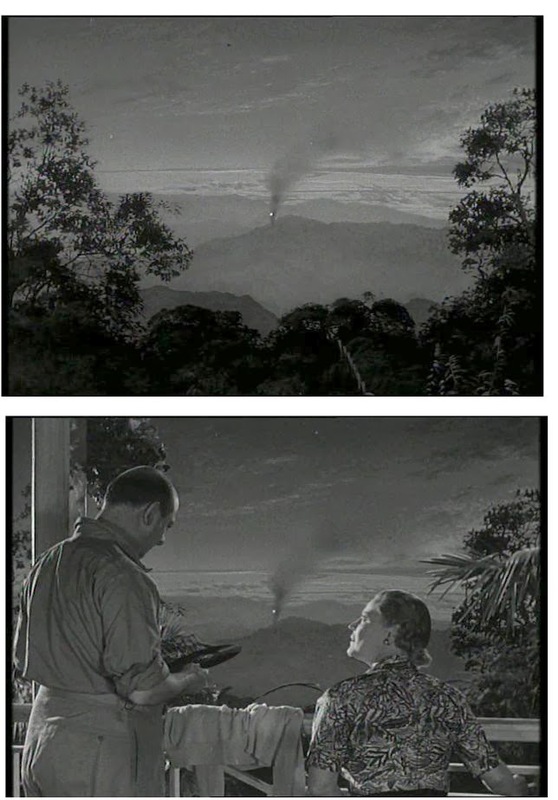 I've always a soft spot for Bob Hope, even in some of his lesser efforts such as CALL ME BWANA (1962) which has several mattes and other trick shots. 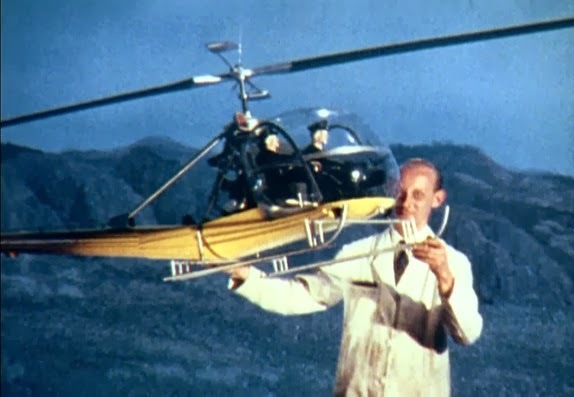 Pinewood's Bert Luxford, a member of John Stears special effects team with a miniature helicopter on the set of FROM RUSSIA WITH LOVE. A solid spy thriller featuring one of my fave actors, Trevor Howard - THE CLOUDED YELLOW (1950) had some good matte effects where you'd not expect them. Possibly the work of Al Whitlock who was still busy in the matte dept at the time, with Peter Melrose, Cliff Culley and Bob Bell. A technically intriguing matte composite from the same film. 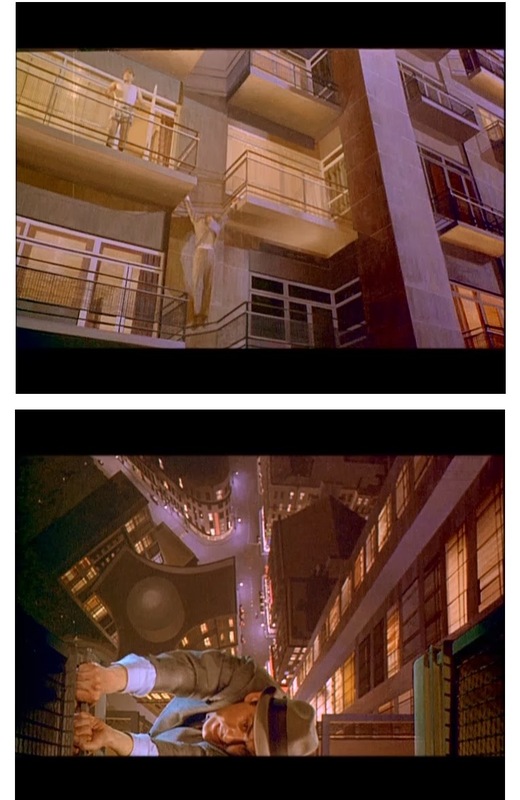 Same film, a substantial, multi element trick shot with everything except Trevor a visual effect of one sort or another. 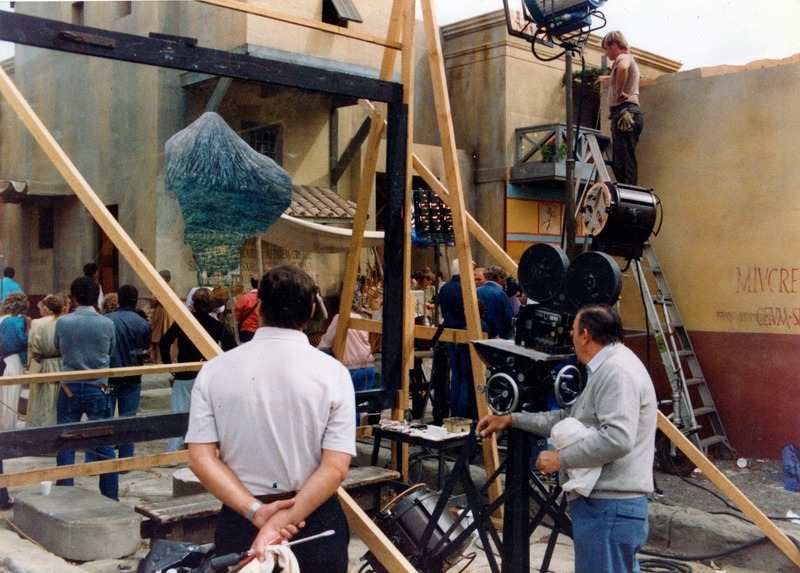 Matte effects supplying a steamer for the 1980's British tv series CRIBB. 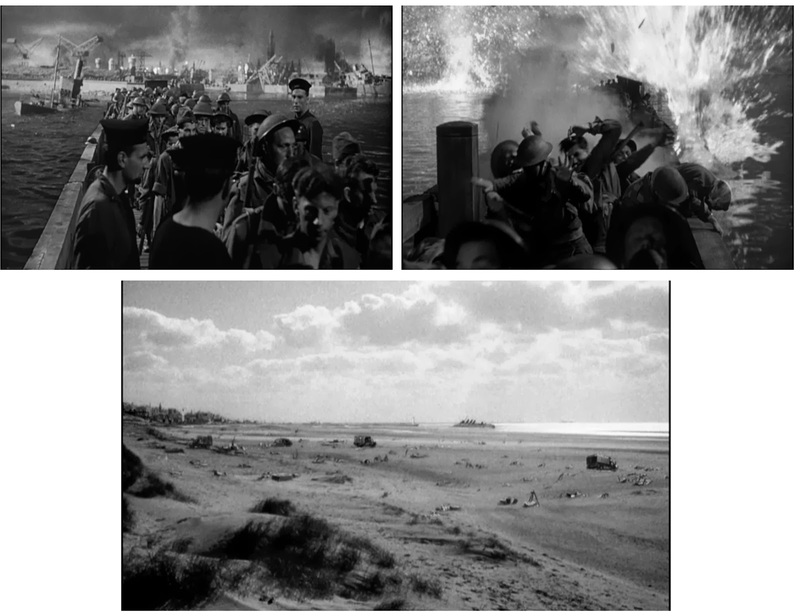 The 1958 recreation of the drama of DUNKIRK had some terrific effects shots, with some ingenious blends of models to live action with alot of blue screen composite work by Roy Field. 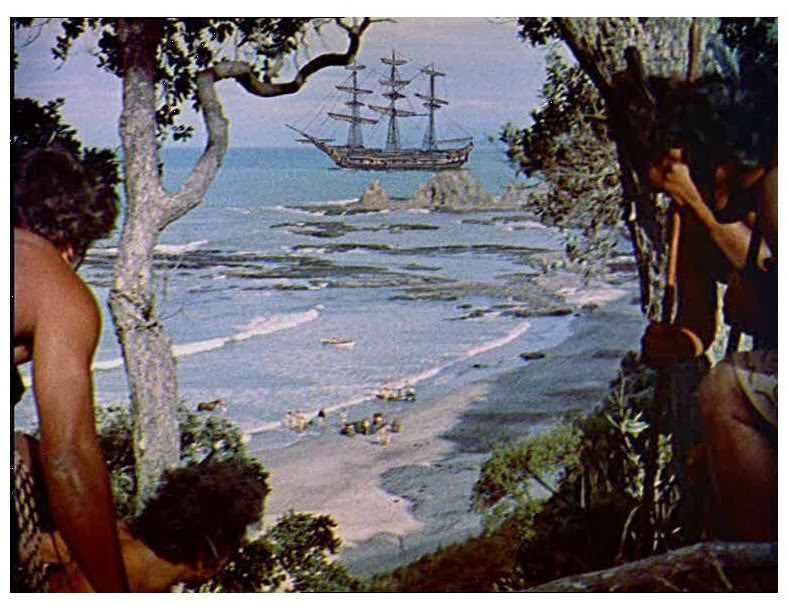 Additionally, the final shot of the beach and shoreline is a matte painting. Oddly, the film is thought to be a MGM-UK film in conjunction with Ealing, though in interviews, Roy Field mentions having worked on the mattes at Pinewood, so I presume the fx work was farmed out. 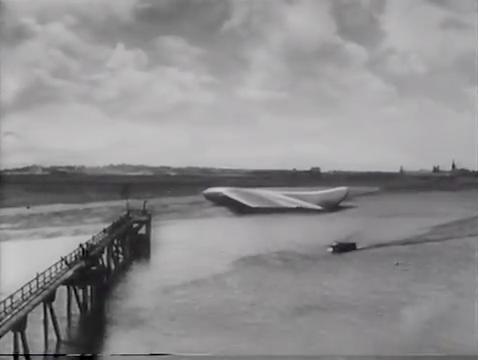 **STOP PRESS** - Brian Johnson, special effects supervisor of ALIEN and EMPIRE STRIKES BACK - and someone with many a great story from his career in the biz just emailed me when he read this post and filled me in on the DUNKIRK matte shot: "The matte painting from Dunkirk was shot on Camber Sands, near Rye. 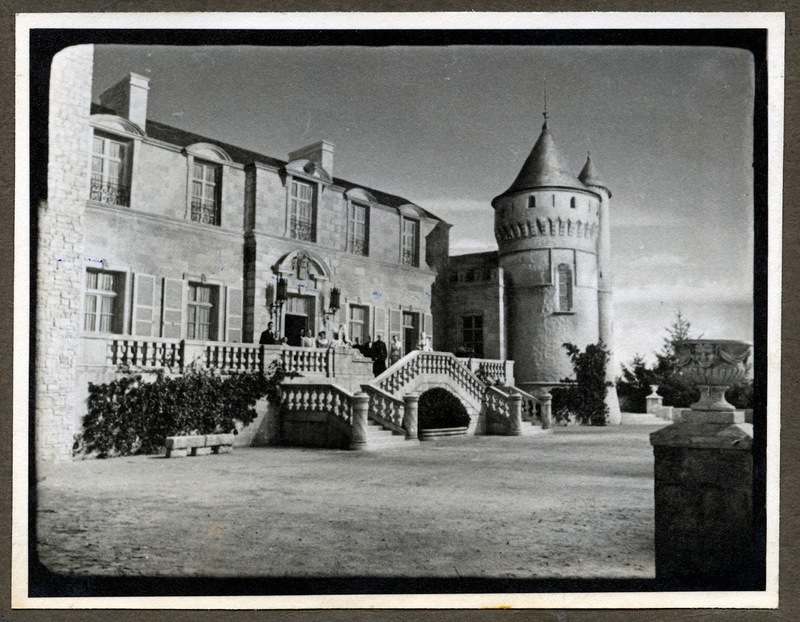 Les Bowie did the painting and marry up at his Anglo-Scottish Films set up at Addelstone, with Ray Caple. Paul Beeson was the Camber Sands location cameraman, Dennis 'Fearless' Fox carried the matte camera, tripod & spider while I, as clapper loader, also staggered under the weight of two huge 6 volt truck batteries for what seemed like miles across Camber Sands. Paul Beeson carried a sand wedge and two golf balls and sliced his way to the spot where we shot the plate! Those were the days." 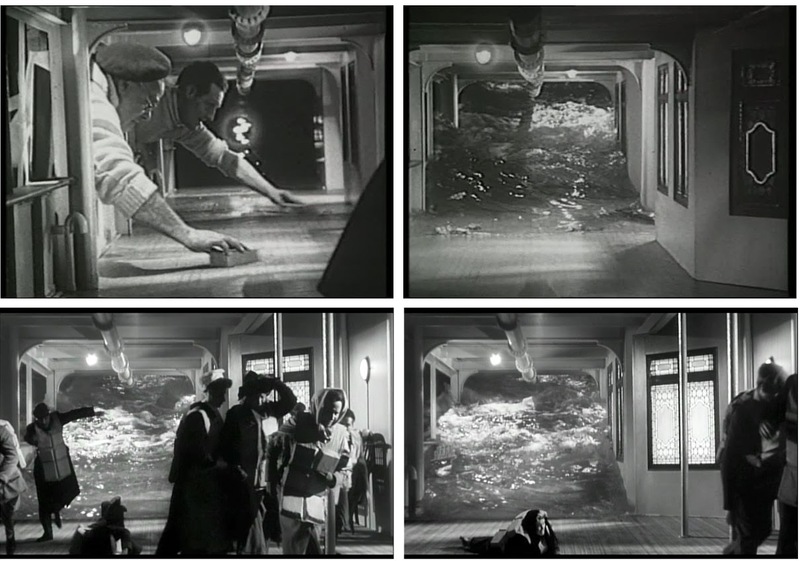 The climax to the 1959 picture FERRY TO HONG KONG is a curious looking trick shot that is tough to figure out. I assume the ship to be a model or cut out, shot against a painted HK and split screened into real water. Whatever it was, it looks odd on screen. Syd Pearson was credited here, with Bill Warrington having left for greener pastures. 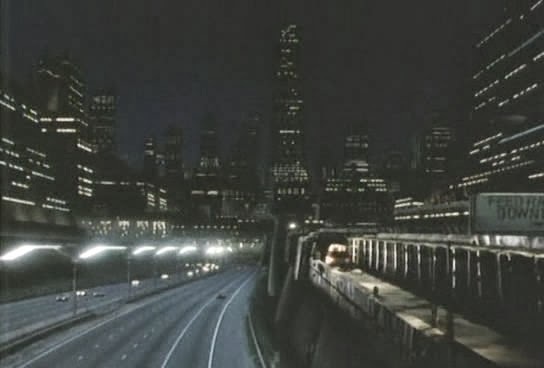 Oddly hued matte shots from Michael Crichton's THE FIRST GREAT TRAIN ROBBERY (1978). 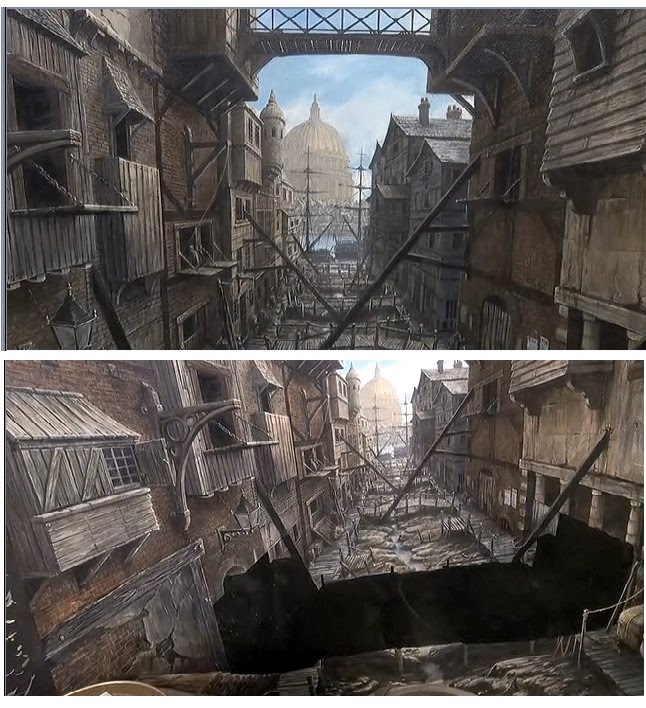 I'm told that the bottom shot is a multi part deal, with matte painted town, live action plate in centre and this all used as a front projection plate to place it all 'behind' the foreground set and character. No credit, but would be Cliff Culley and Charles Staffell. 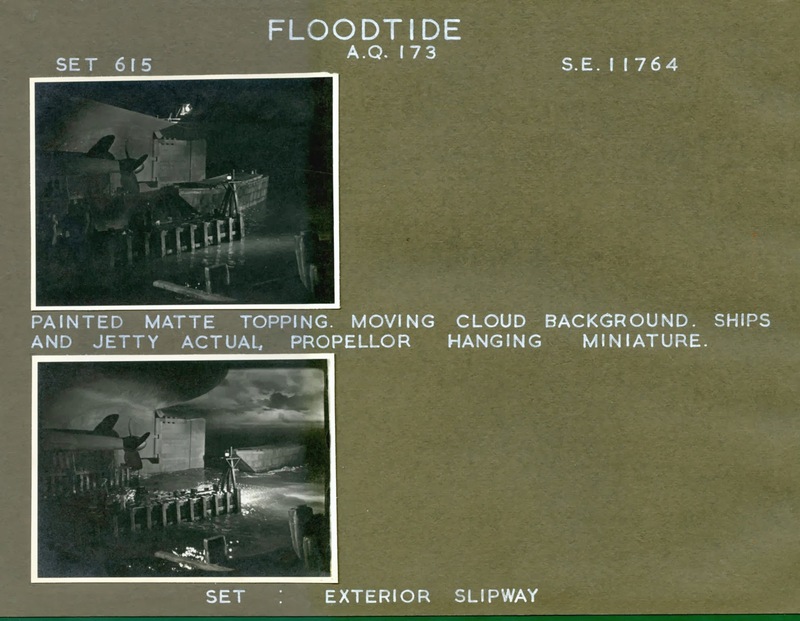 An original Rank special effects proofsheet for the 1949 film FLOODTIDE. 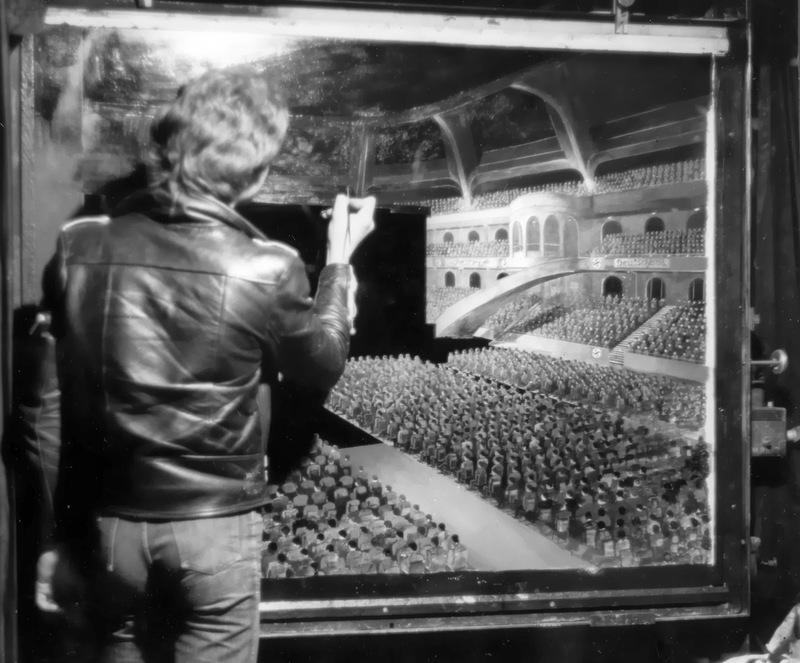 Les Bowie was matte chief here with Bill Warrington handling the perspective miniatures - none of which is at all evident in this clever illusion. A closer view of the set with some effects already in place. 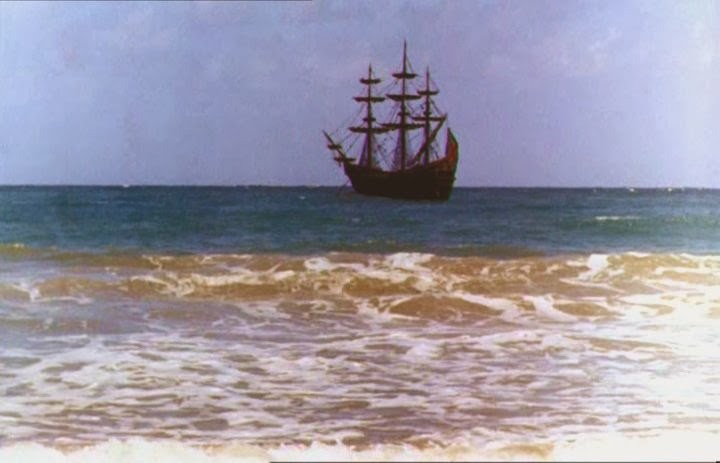 A frame enlargement from the original clip showing the completed illusion. You can keep your damned greenscreen, playstation cinematic excesses folks, it's this clever, hands on sort of trickery that keeps me just fascinated with special effects. 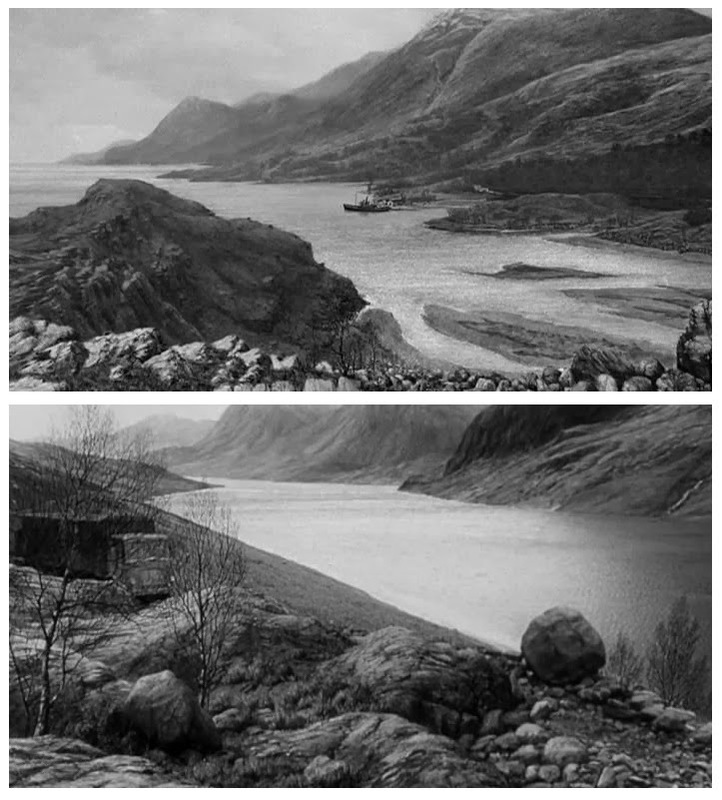 Also from FLOODTIDE a revealing before and after of the cost effective use of back projection. I assume the plate is a miniature. Yet another from the CARRY ON stable, this one called FOLLOW THAT CAMEL (1967) with Phil Silvers trying to be Sid James (as if!). Nice matte art by Cliff Culley. I love painted in ceilings and interior top ups in the medium, and this Culley matte from FROM RUSSIA WITH LOVE (1963) is a winner for me. A completely invisible matte shot by Leigh Took for the very misguided final film of the great Peter Sellers, THE FIENDISH PLOT OF DOCTOR FU MAN CHU (1980). 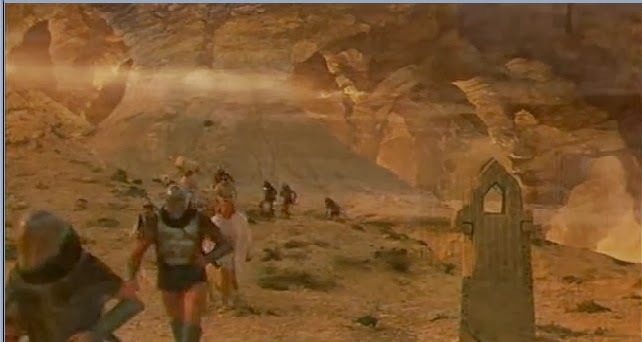 The best bit in the awful film was a line uttered by Peter when some cheap special effect is employed in a scene, whereby Sellers' Fu Man Chu character says "You can't fool me with that cheap cinematic special effect". 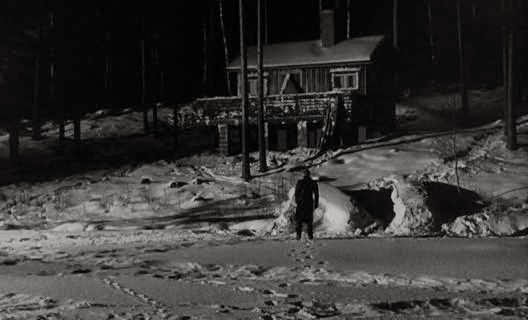 The 1949 Trevor Howard picture THE GOLDEN SALAMANDER matte shot. 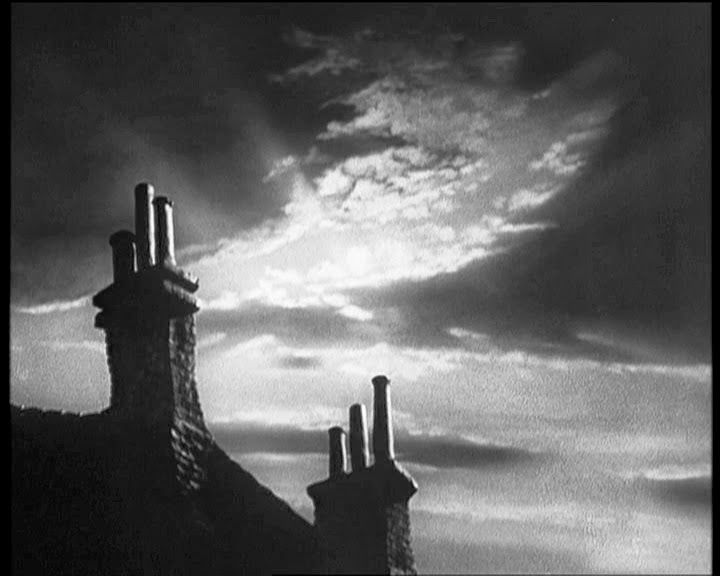 Now, for years I've been lead to believe this wonderful shot from David Lean's excellent GREAT EXPECTATIONS (1946) was a Les Bowie glass shot.... well, not so. 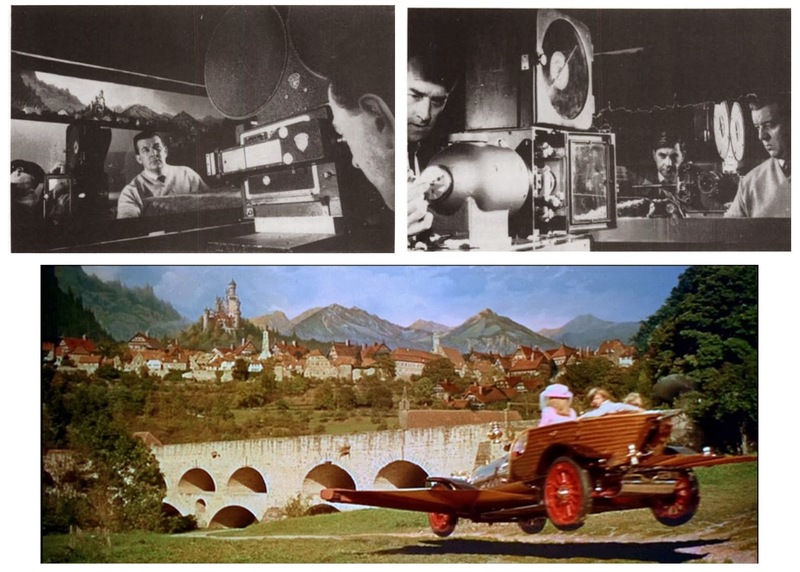 In an article I have in an ancient issue of Journal of British Kinematograph Society, the film's art director, John Bryan, discusses this (and other) trick shots of the day. 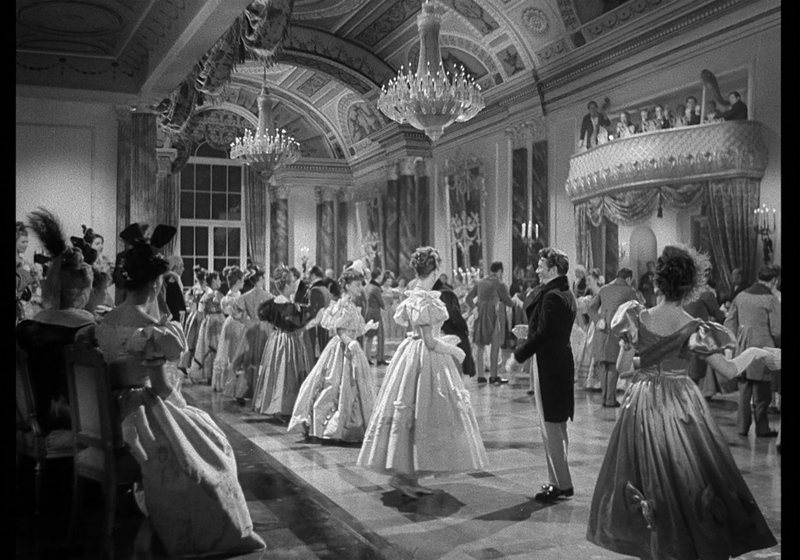 According to Bryan, everything above the heads of the actors is a hanging foreground miniature by Douglas Woolsey, including the chandeliers, which were specially crafted out of perspex and tiny lights installed within by means of 'pin' bulbs. One of my all time favourite trick shots, and a tribute to both the model maker and the effects cameraman that the blend is utterly 100% perfect. Veteran effects man Roy Kellino was also involved as 2nd unit director, and as his background was in model shots he's probably had a hand in this too..
A Les Bowie glass shot, also from GREAT EXPECTATIONS. Nice perspective here. Another Bowie matte from the same film which would be re-used by Les years later for GRIP OF THE STRANGLER. 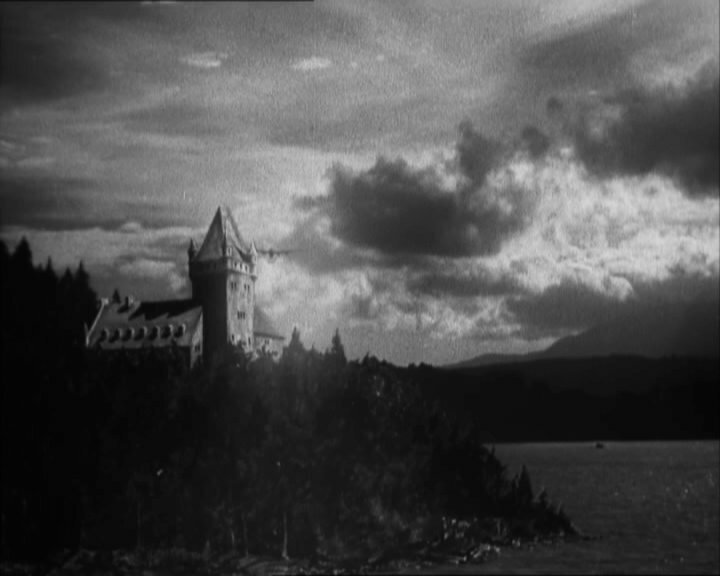 A brooding, atmospheric opening panoramic glass shot by Les Bowie from GREAT EXPECTATIONS. 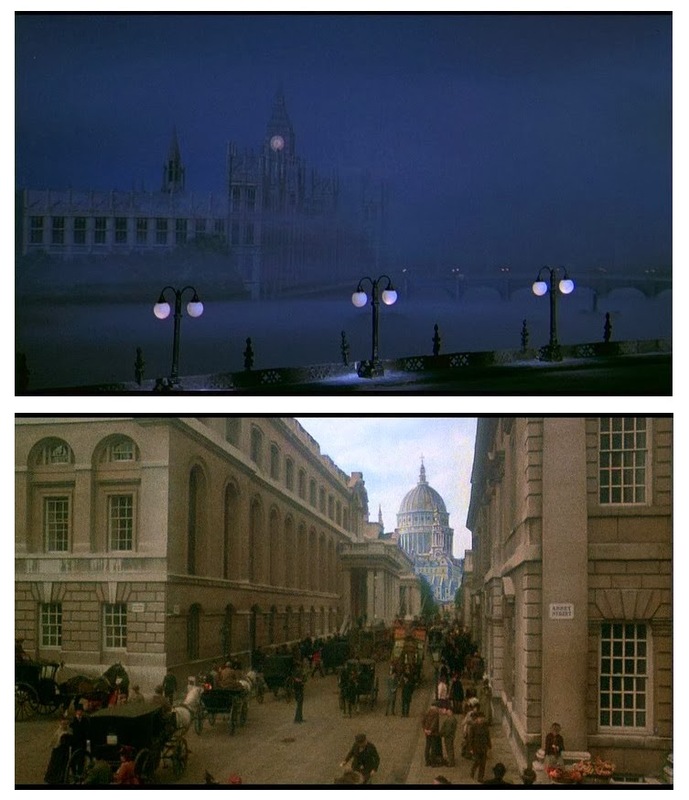 Apparently permission was not granted to shoot the climax of HANDS OF THE RIPPER (1971) inside St Pauls in London, so the production had Cliff Culley replicate what was required via matte art and cut outs. 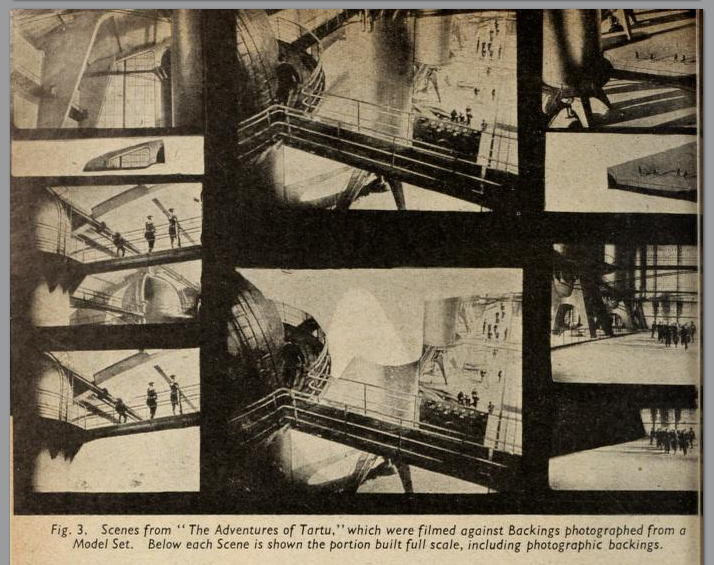 I also read somewhere that maybe front projection might have been used to combine the upstairs action with matte art. The low budget Jack Palance fantasy flick, HAWK-THE SLAYER (1978) employed Leigh Took and Cliff Culley's talents. Leigh's fanciful glass painting up close. Another effects shot from same film. The tough and tense VistaVision thriller HELL DRIVERS (1957) threw in some barely detectable matte shots during the frantic truck chase finale where the artists added a quarry where there was none. Gritty, well made film. The incredibly gory and sadistic HELLRAISER 2-HELLBOUND (1990) was a tour de force for Culley and his helpers. 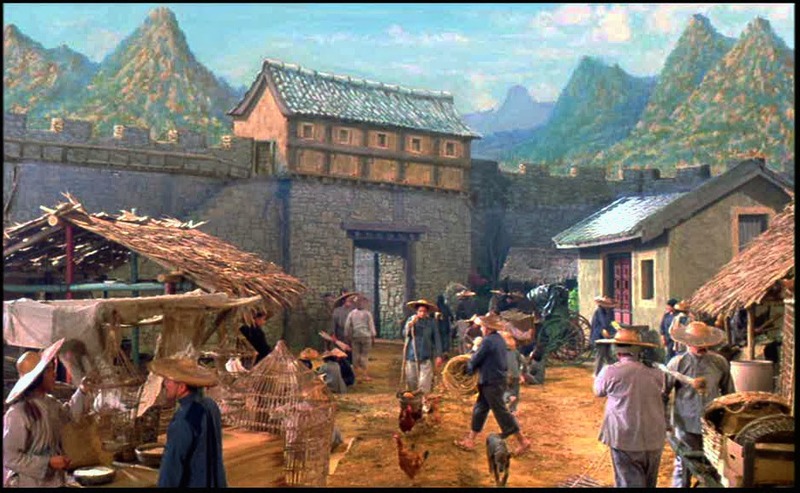 More matte art from same film. Don't ya just dig that satanic carnival? Same film - incredibly well executed effects shot... one of Cliff's best bits of business to my mind. 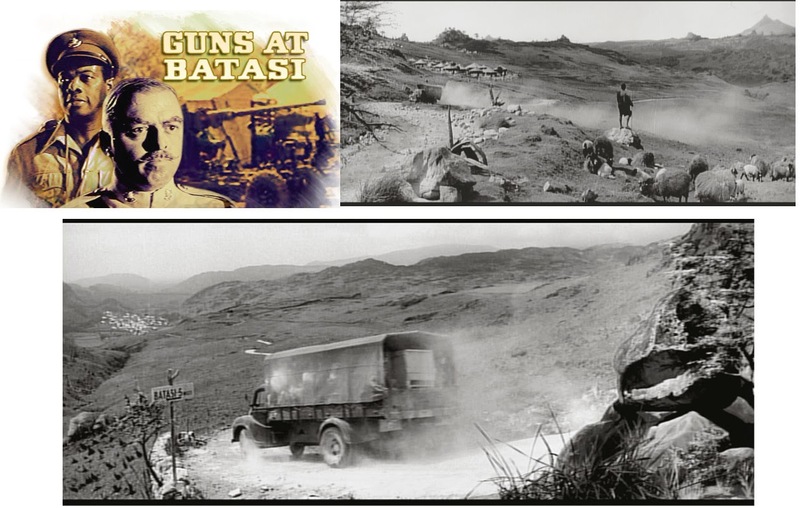 The riveting Richard Attenborough African set (though not filmed there) drama GUNS AT BATASI (1964) opened up with a couple of matte shots to persuade us that we were right there in the heart of Africa, though the film was all shot outside of London in the English midlands. Cliff Culley would no doubt have provided the mattes here with added in African terrain, villages and so forth. Great film! 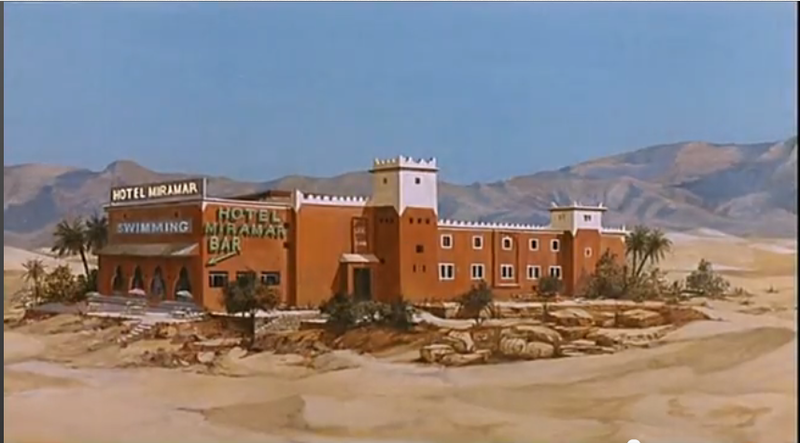 The 1951 Ken Annakin comedy HOTEL SAHARA was an Albert Whitlock assignment. Old classics are forever remade (or these days, 're-booted' to no positive good) and THE HUNCHBACK OF NOTRE DAME is one such remake for tv sometime in the early 90's I think. 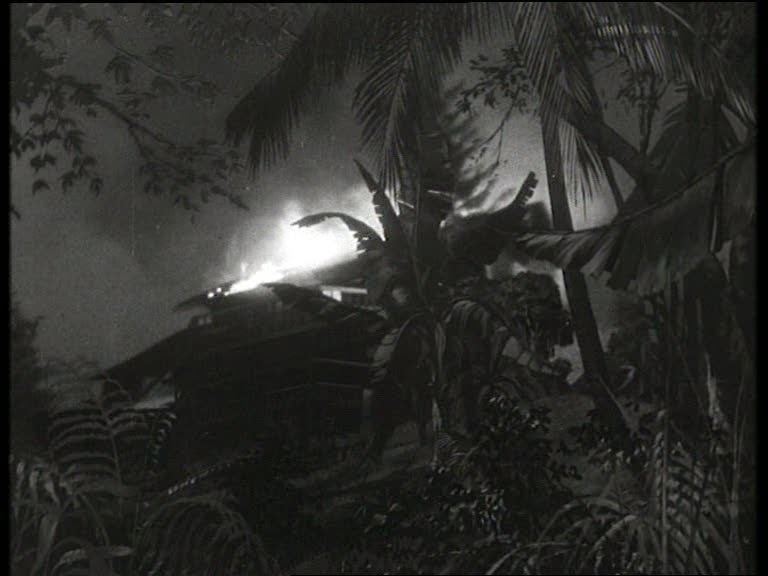 Cliff Culley was credited for matte shots. Also from I'LL MET BY MOONLIGHT is what appears to be a miniature and painted backing. Effects by Bill Warrington. 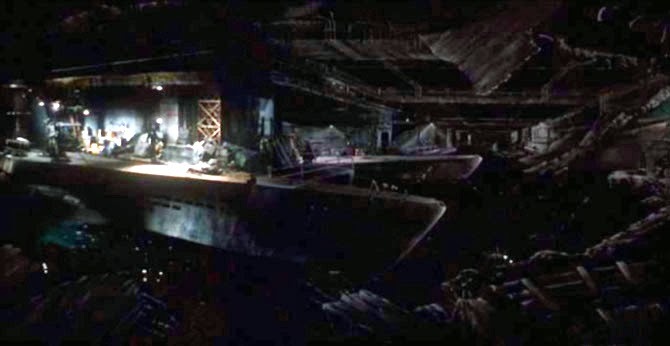 Wolfgang Peterson's DAS BOOT-THE BOAT (1982). Leigh Took worked on matte effects. Comic Norman Wisdom was never known for his subtlety, though his frantic, frenzied material still puts a smile on my face. 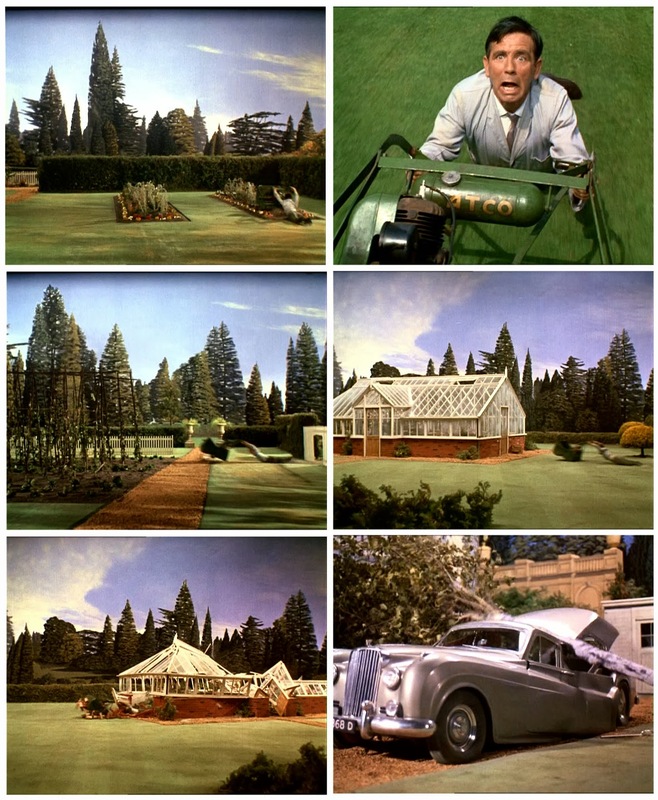 This show is THE EARLY BIRD (1965) with effects men Cliff Culley and Roy Field pulling out all the stops with lots of matte art, models, animation and wacky optical gags. Same film - with poor Norman being dragged by an out of control power mower, whereby all manner of destruction and mayhem results. All done as miniatures and puppet work - and surprisingly well at that - with just the odd process shot of our actor in trouble. I recall seeing this back in the 60's or 70's and nearly pissed myself with laughter. A bizarre optical gag by Roy Field from THE EARLY BIRD. Same film- miniature foreground action against painted backing. 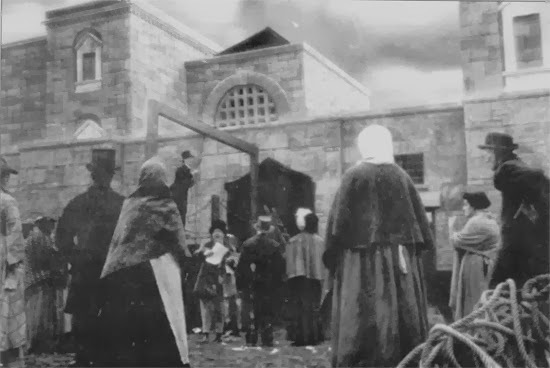 The same film - Norman burns down the milk factory. 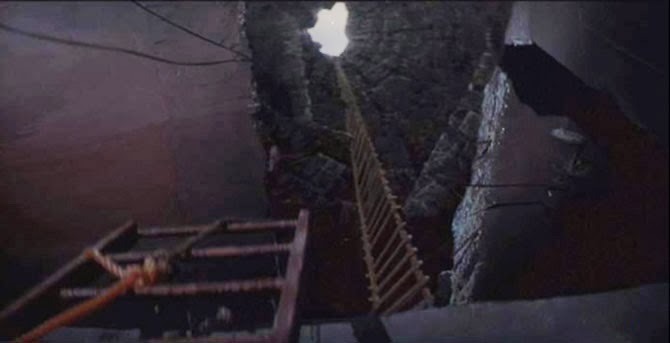 I think the fire ladders at left are miniatures or a separate plane of matte art against the building matte art. Same film, same mayhem, same effects team. 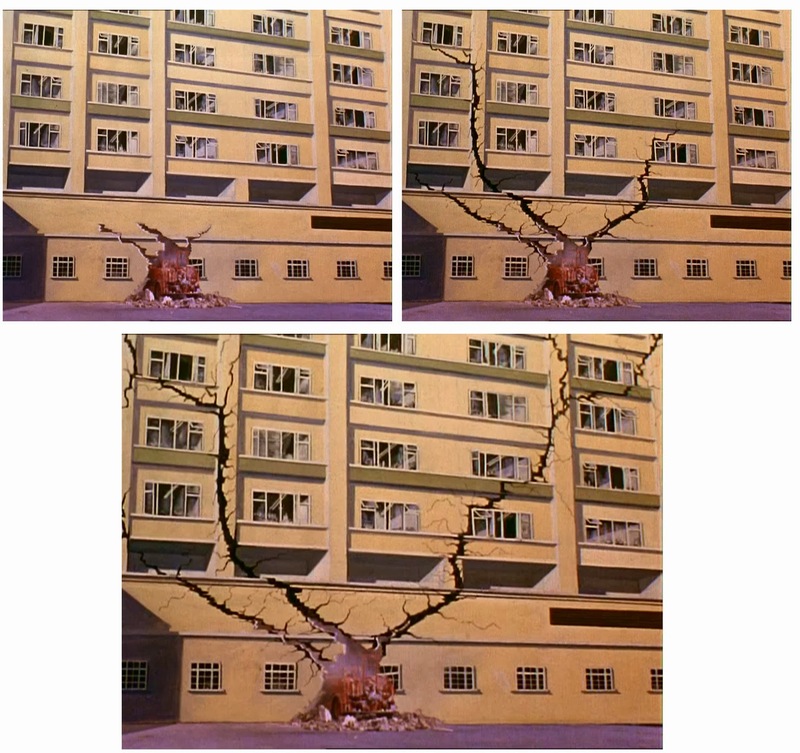 Just when you thought Norm couldn't do any more damage... the building is a Cliff Culley painting, with animation overlay, possibly on separate glasses or as an optical (I'd go with the former myself). 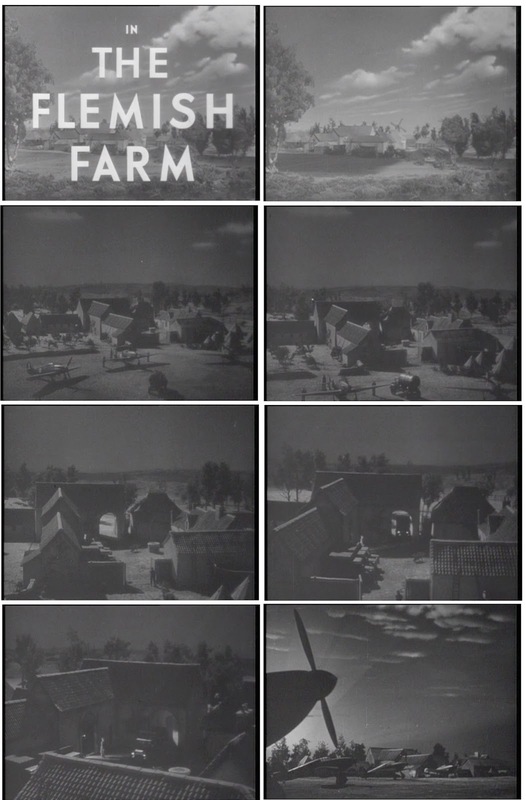 An interesting and mobile track in shot (complete with moving vehicles) that opens the film THE FLEMISH FARM (1943). This sort of model work was common in UK cinema and usually well executed. Effects credited to Derrick Williams and made at Denham Studios. 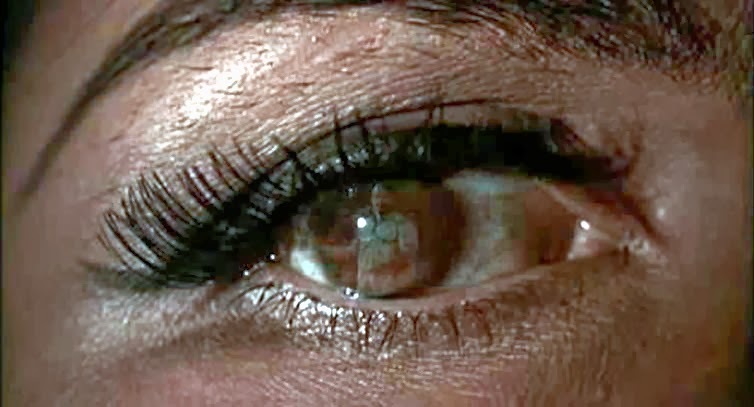 That iconic assassin in the eyeball reflection optical from GOLDFINGER (1964) was a Cliff Culley optical gag. 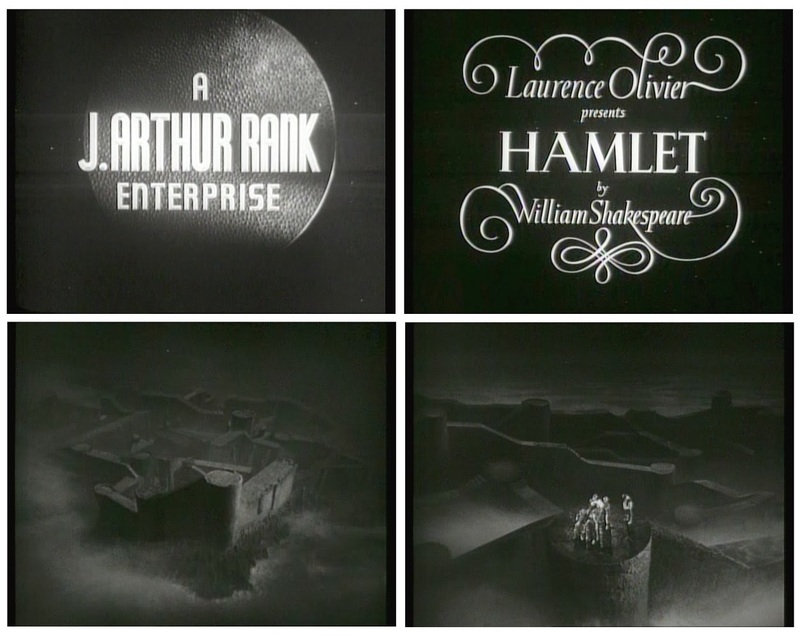 Laurence Olivier's 1948 production of HAMLET had a variety of trick shots in it - models, glass shots, process and optical combinations of all of the above. 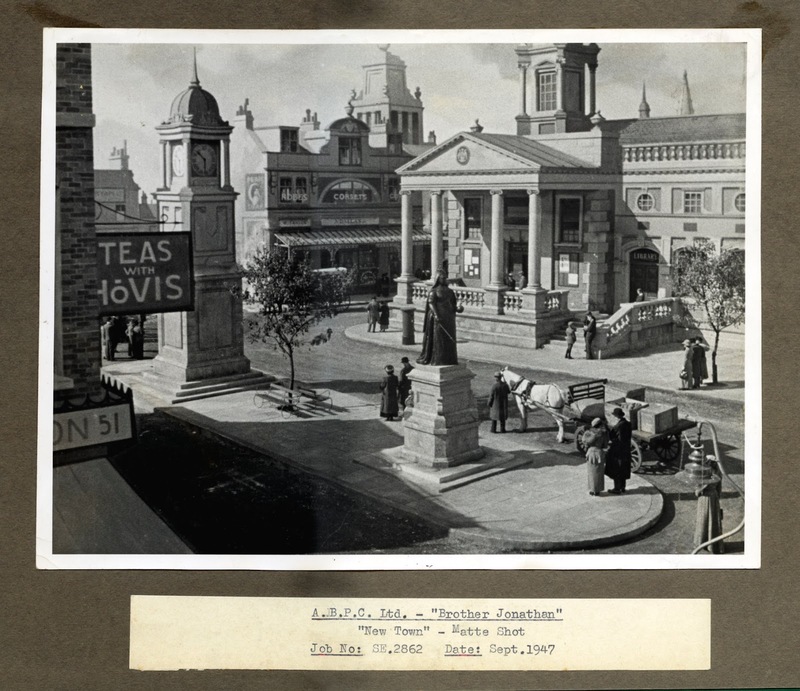 Visual effects were credited to Paul Sherriff, Henry Harris and Jack Whitehead, with George Blackwell and Bill Warrington on miniatures, Francis Carver on special processes and Sid Howell on back projection. 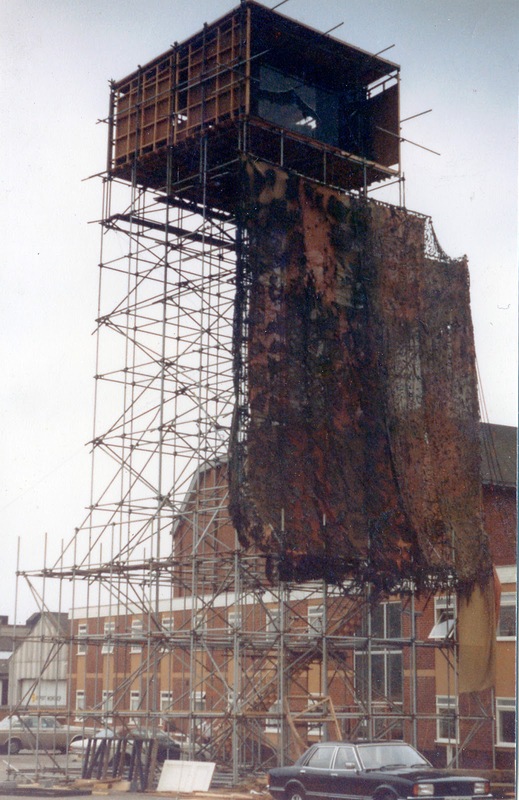 The indescribable post apocalyptic saga HARDWARE (1990) utilised the skills of future Bond effects supervisor Steve Begg who was a matte artist in his early days, working with Cliff Culley at Cliff's Westbury Design & Optical on several projects. Now, this is a great little movie, THE ADVENTURES OF TARTU (1943) -also known in the US simply as TARTU. A rip snorter of a wartime espionage adventure with elements from all those war years Warner type that Errol Flynn was so good in - shows we all love. The last half hour is loaded with terrific special effects shots as our hero, Robert Donat, infiltrates a factory where those nasty Naxi bastards are manufacturing nerve gas on an epic scale. (Yes - there really are WMD's here Mr Bush... you sure screwed the pooch on that one, huh George...... though, as usual I digress!) 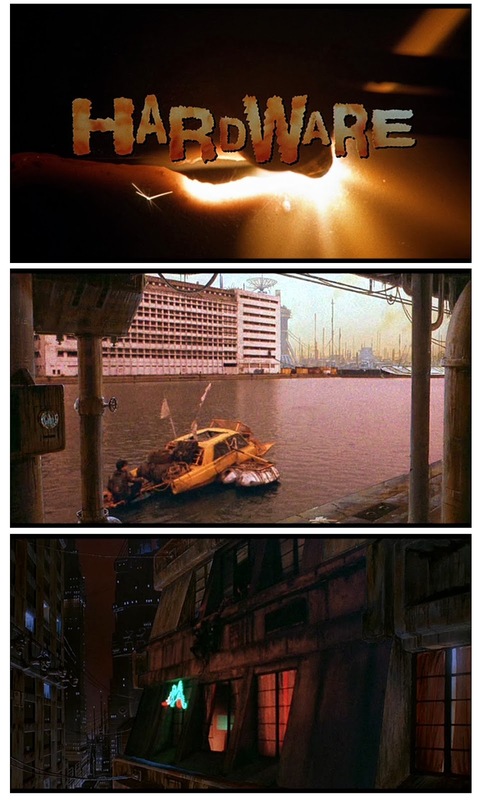 Tons of outstanding effects shots -miniatures,foreground models, matte art, really inventive process projection - and often all of those tricks used in a single shot! Wild chase sequence through the chemical plant with camera pans across a partial set onto a trick shot set as a process shot within a process shot! Very clever work and supremely well executed all round. 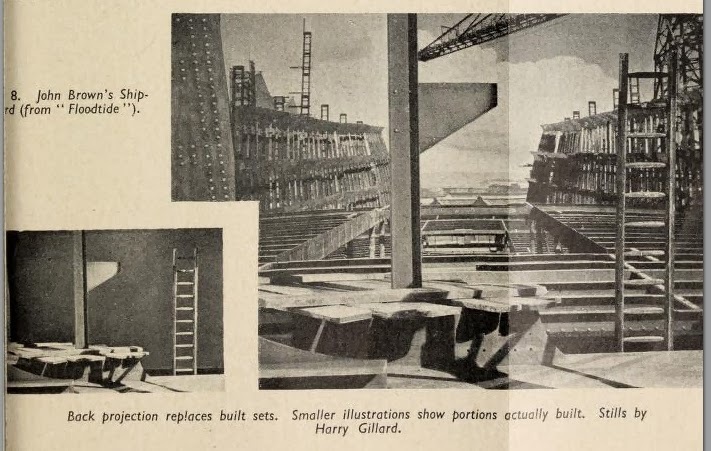 Curiously an MGM film and supposedly filmed at MGM-UK studios it would appear from an old article I have hear that the effects work was likely farmed out to Rank (presumably the Denham branch) as Pinewood's Henry Harris received sole credit. Before and after of just one of the dozens of trick shots. Same film with an idea of just how much fakery went into it. More of the same. The old tricks are usually the best tricks. 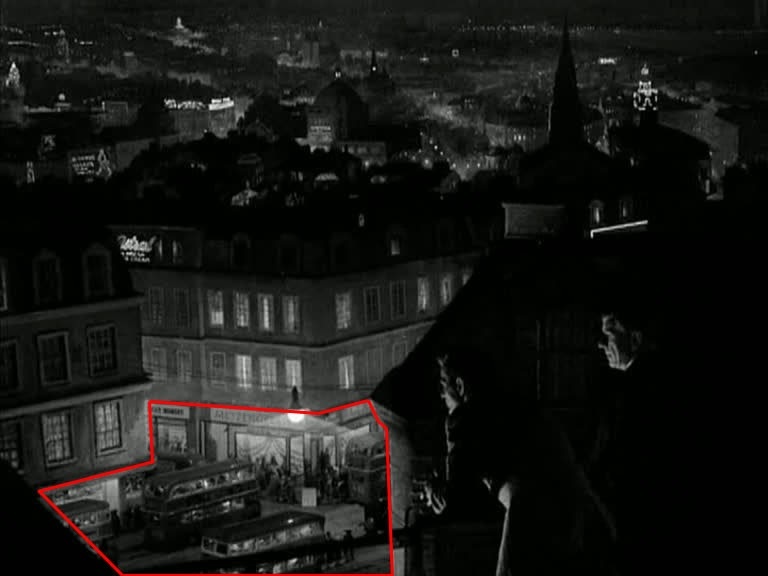 Just a tiny sliver of actual set with the actor, and the rest is movie magic. 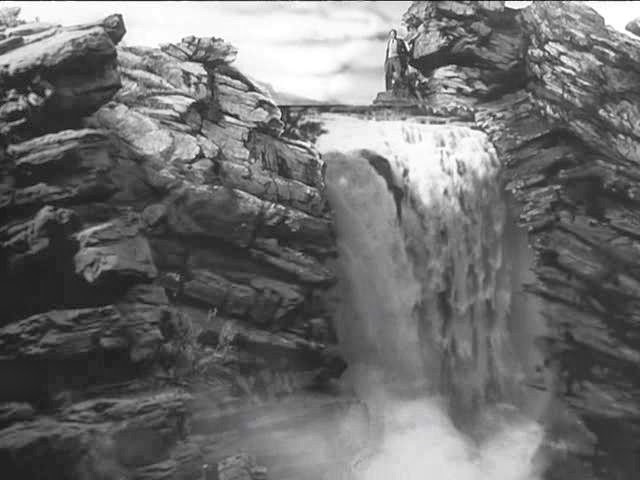 The climax is wall to wall photographic effects. 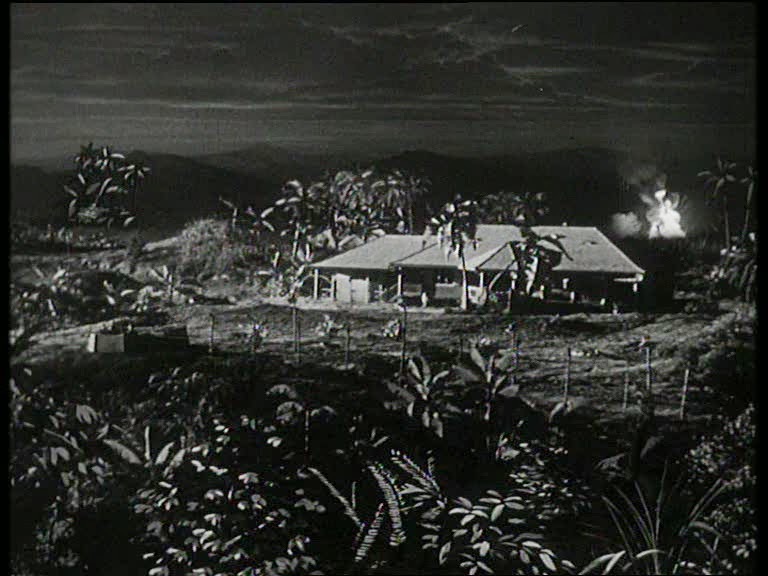 Same film - background action is already a composite shot and rear projected in different angles to allow camera moves and pans as chase through the plant occurs. 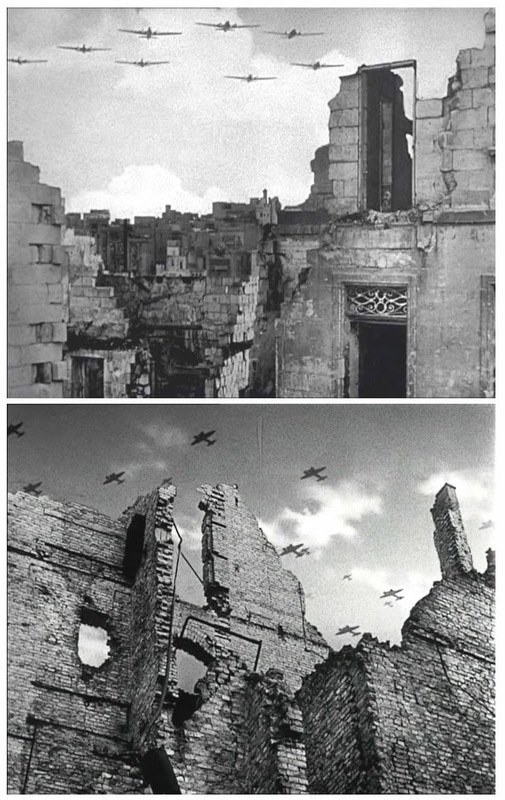 According to art director John Bryan who worked on the film: "A particularly interesting example of model sets occurred in this war time film on which I was the art director. 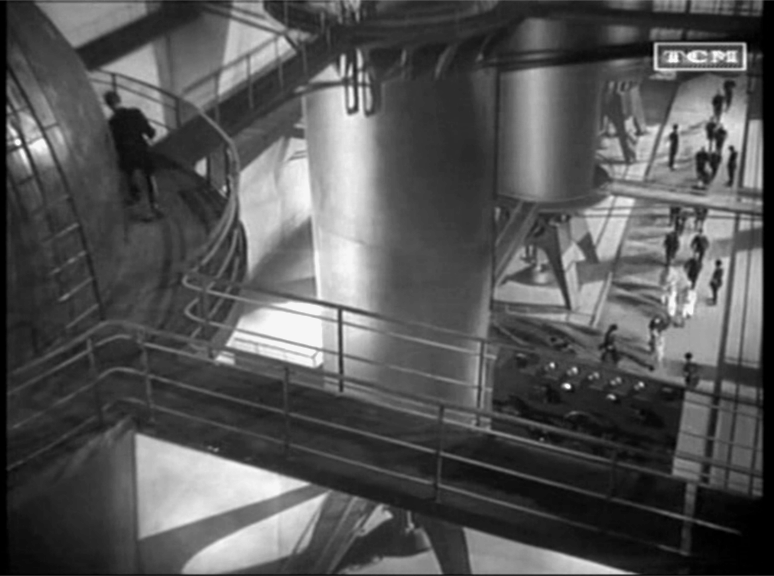 The sequence was set in a poison gas factory. 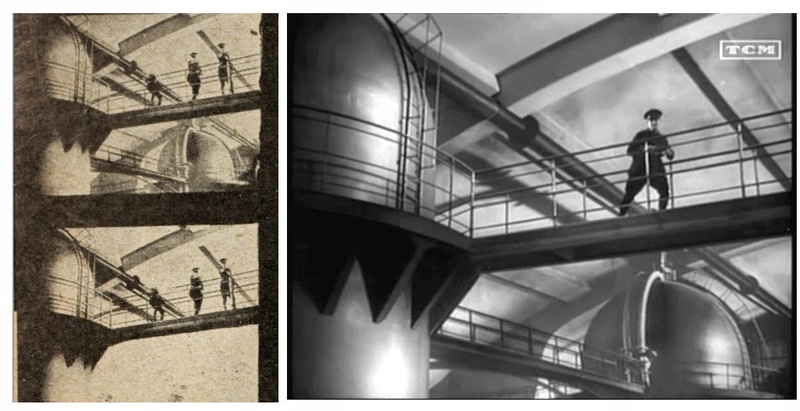 For the scenes required, a complete model of the plant was built, measuring some 18 feet high and 30 feet long. 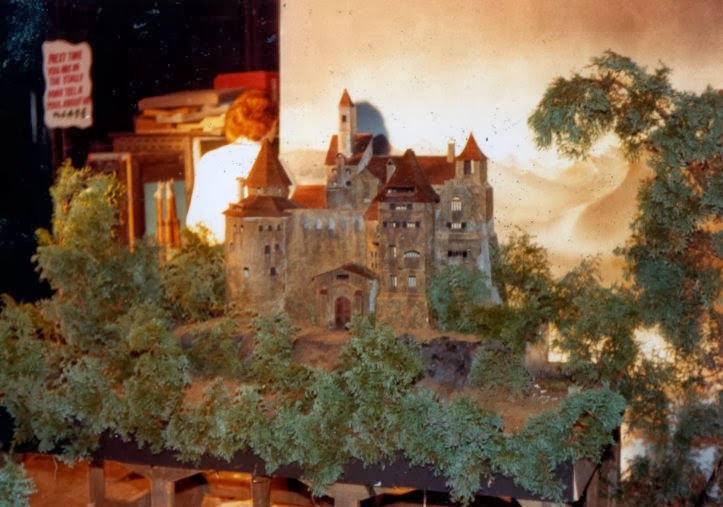 From this model all of the back projection plates, photographic backings and matte shots were prepared. 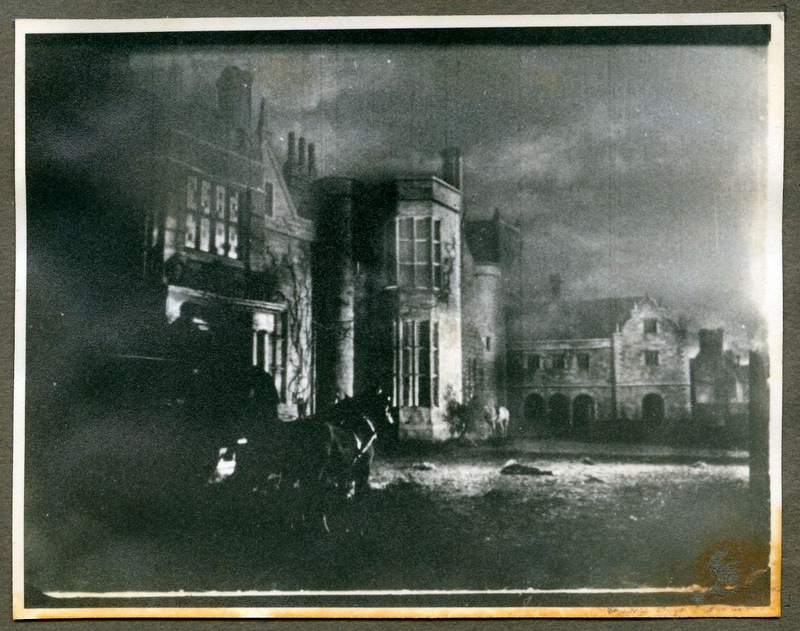 Most of the scenes were then shot in the studio using these effects. Certain scenes however called for a very high camera viewpoint. For these, we were able to use the Wembley Stadium, where we placed the camera in the roof and filmed through the photographic backings prepared from the model. 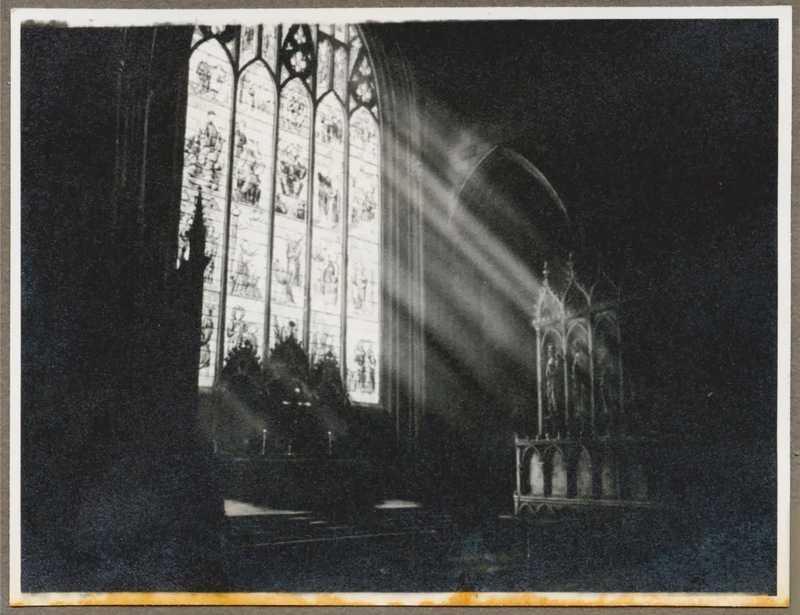 Some of these shots called for an unusual combination of various processes, and all of them embodied a very small portion of the full sized set and photographic backings or matte shots were used for the remainder of the view." 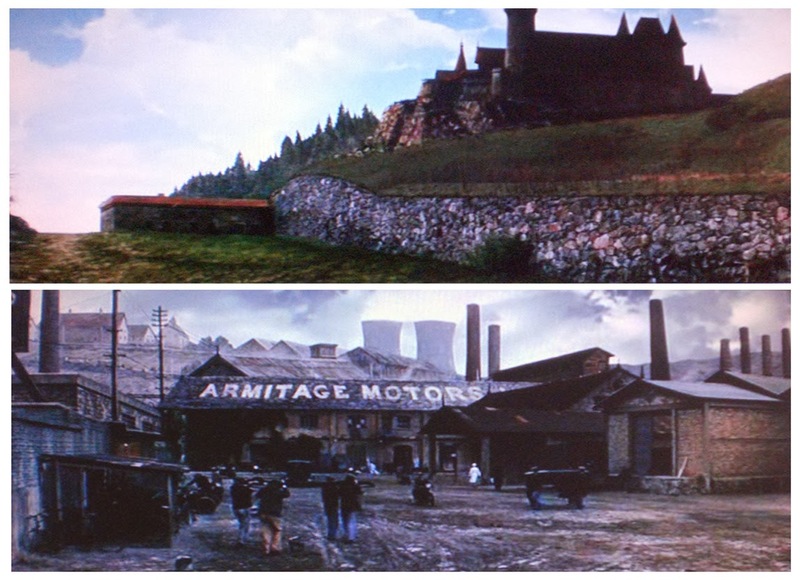 Same film... Nazi factory no more! Miniature mayhem in a good cause. 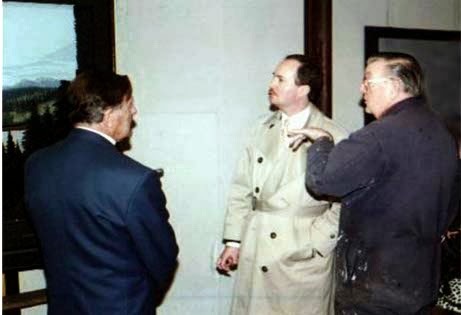 An invisible glass shot from the Bond film GOLDENEYE (1996) supervised by Derek Meddings. 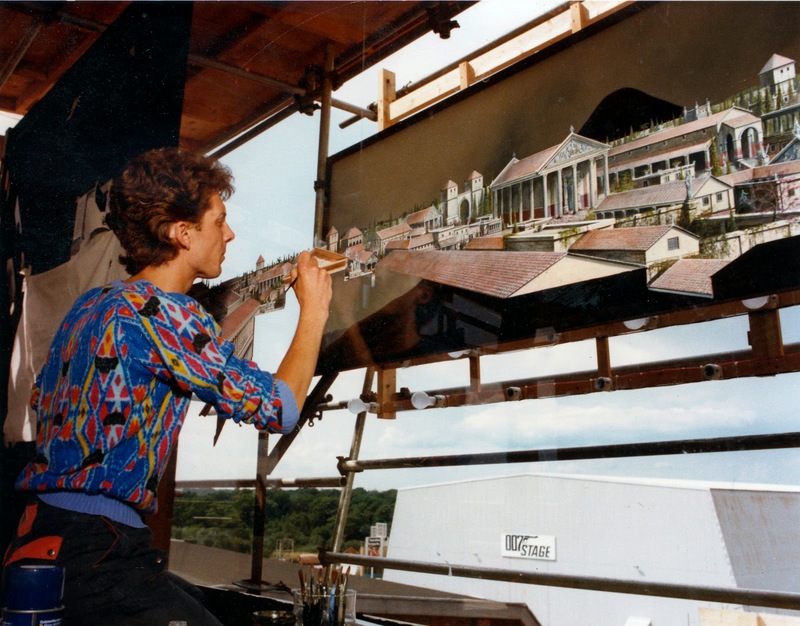 Meddings with the large foreground glass painting, possibly the work of scenic artist Brian Bishop. 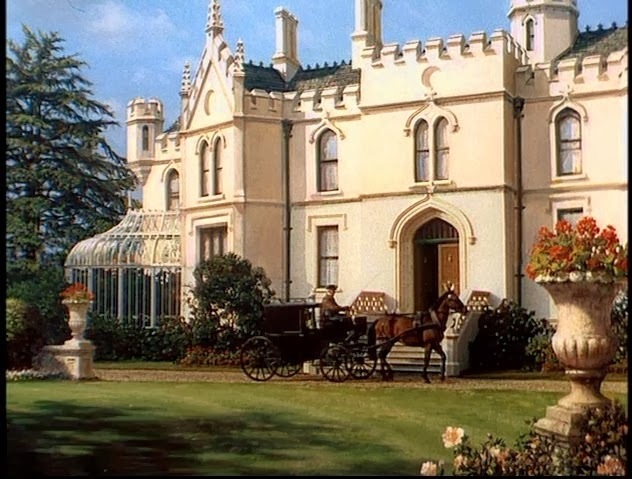 A lovely matte shot from THE IMPORTANCE OF BEING ERNEST (1952) where only the lowest part of the bottom windows and the door are real with the rest all added by the matte painter, who may well have been Albert Whitlock. Note, even the foreground flowers and urn are painted. 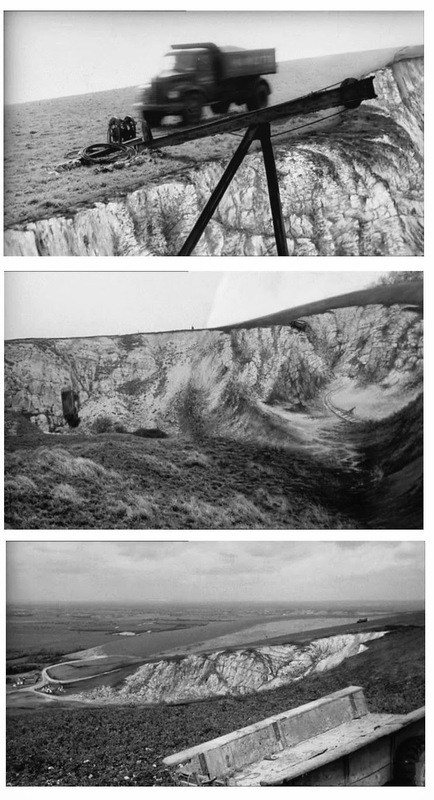 A pair of Cliff Culley mattes from the same film. 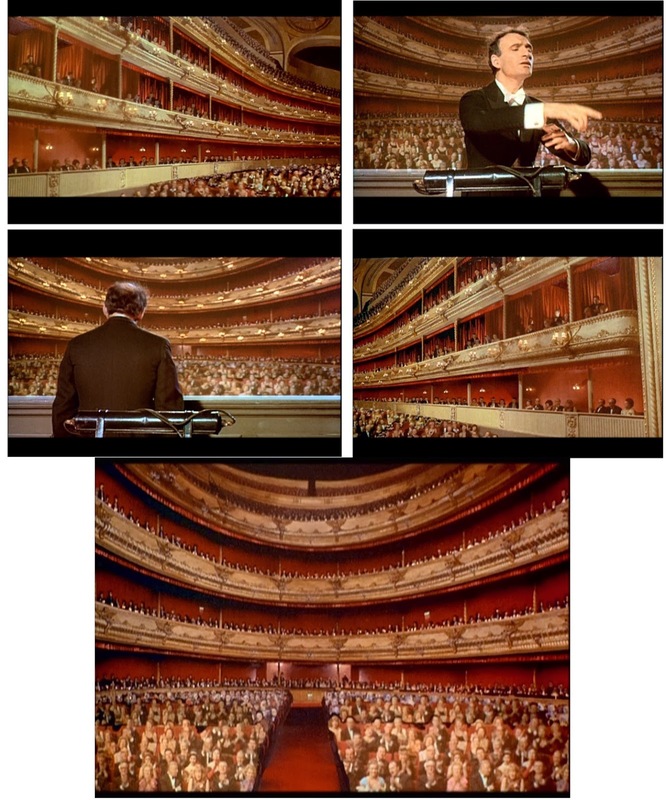 The opera house matte sequence, from THE INTELLIGENCE MEN. 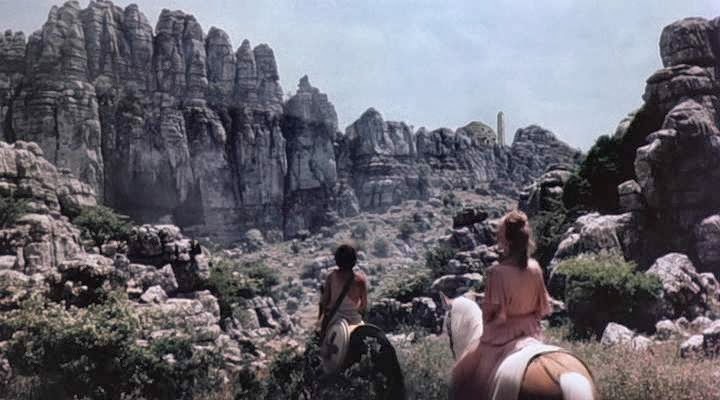 The Charlton Heston epic KHARTOUM (1965) was a really good show as I recall. Grand in scale, this 65mm production was supplemented with a number of terrific Cliff Culley mattes to excellent effect. 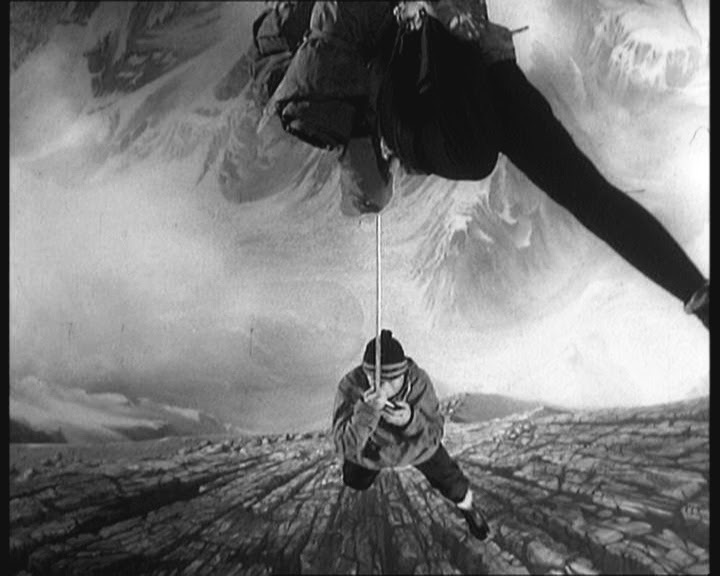 Roy Field was matte process cinematographer. Also from KHARTOUM, a really impressive matte shot. KHARTOUM sprawling painted vista of the Sudan. Some of Culley's best work ever. 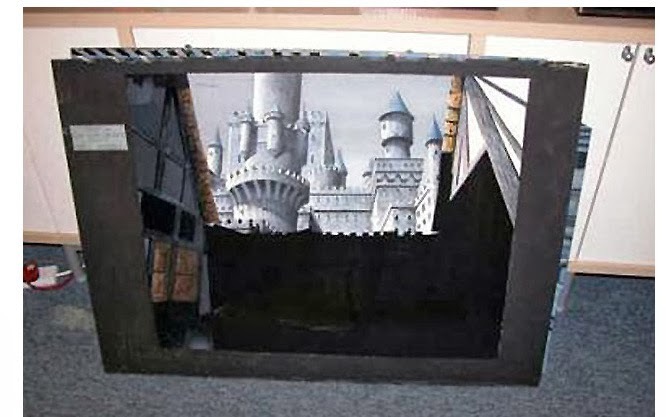 A Cliff Culley matte prepared for Disney's A KID IN KING ARTHUR'S COURT (1990) which unfortunately didn't work out and was ultimately not used, with Harrison Ellenshaw providing a different painting altogether which better suited the director's vision. 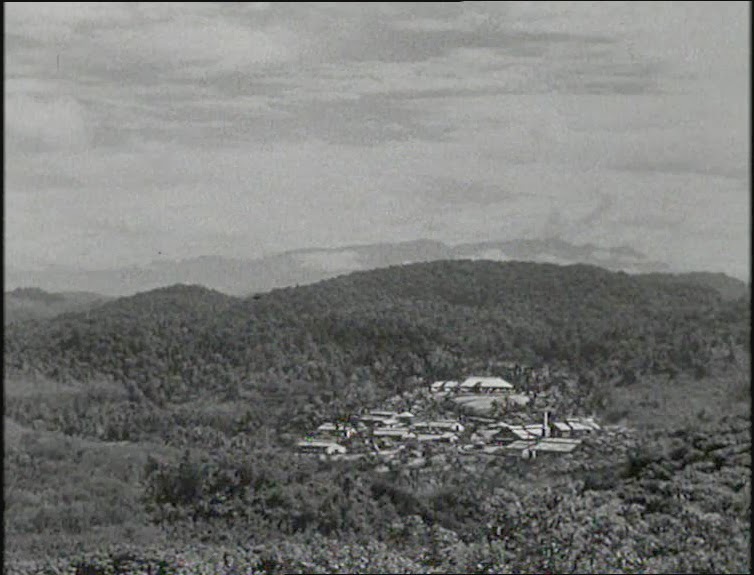 I'm unsure whether or not this shot, from KING RAT (1965) is a Pinewood matte or produced elsewhere... but here it is. Speaking of remakes, this title has seen a few incarnations: KING SOLOMON'S MINES with this version made in the 90's. Cliff Culley and Leigh Took were assigned the effects. 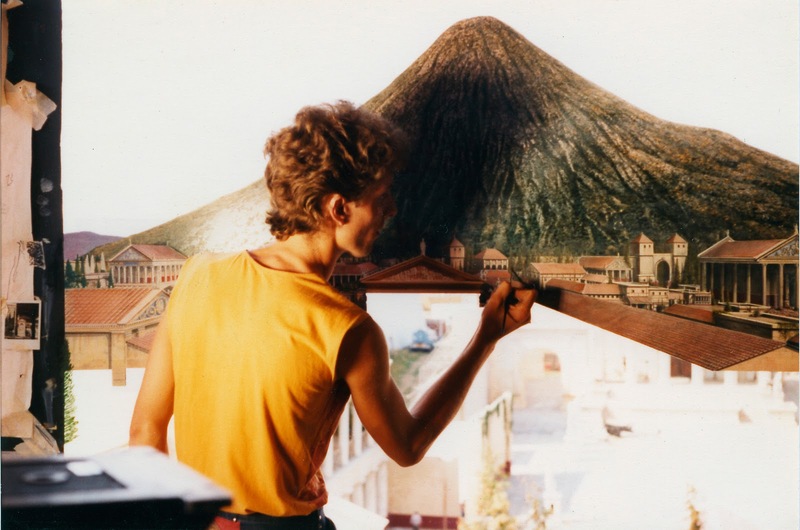 While we're on remakes, THE LAST DAYS OF POMPEII was rehashed for television around 1990, with Leigh Took pictured here working on one of the many expansive views of the fabled city. 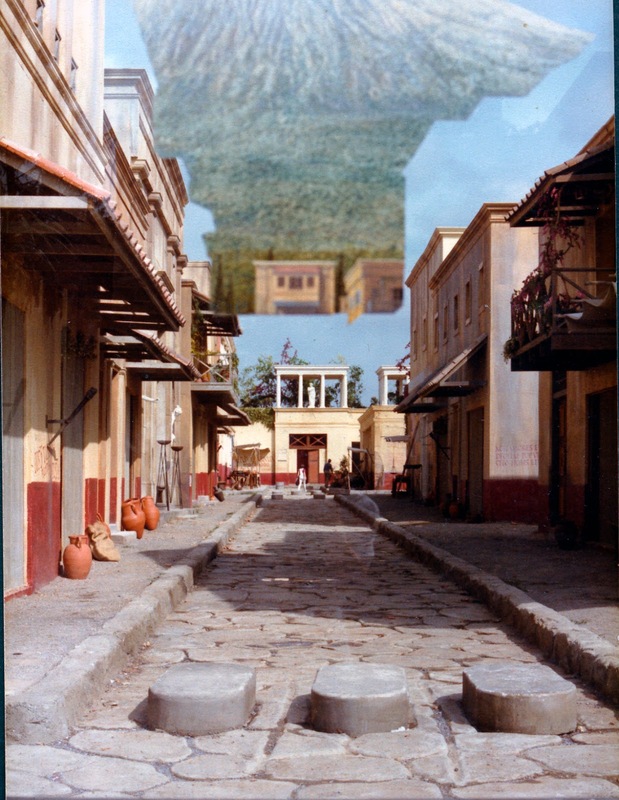 The Pinewood backlot with Leigh's painting filmed in camera as a latent image glass shot. 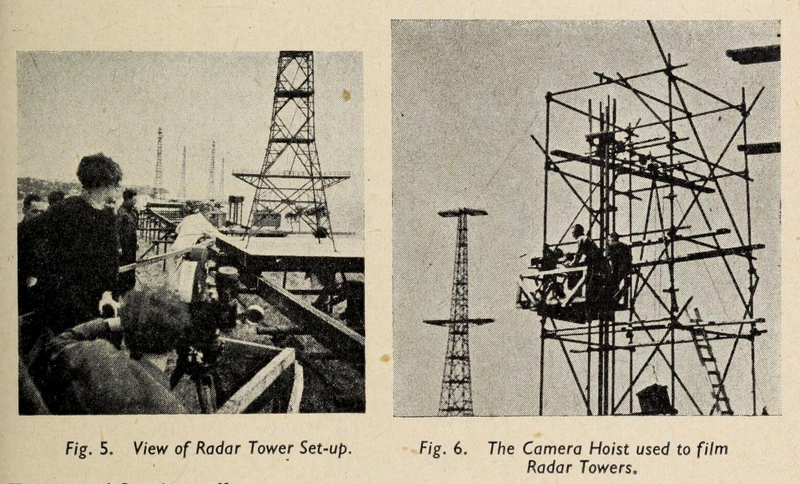 Being an in camera glass shot, this huge tower was constructed on the lot (note the little shack at the top with the large glass set up) - upon which humble matte artist would clamber up a few times a day for weeks on end. 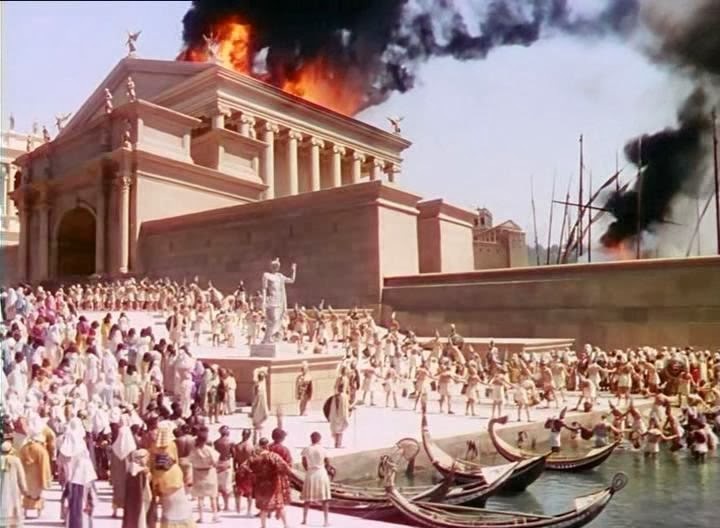 Apparently the temperature played havoc, with cold weather at times and scorching arc lights at other times..
LAST DAYS OF POMPEII glass for an in camera original neg composite shot. 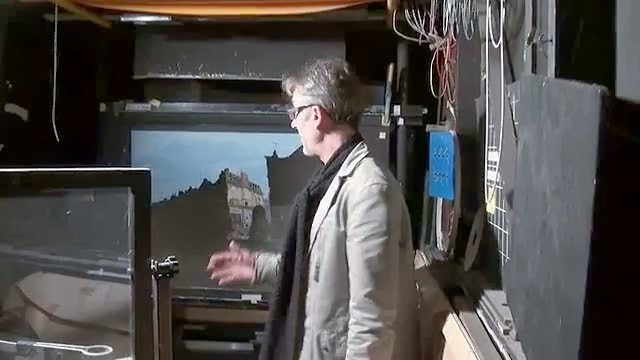 Same show, with effects supervisor Cliff Culley peering through the viewfinder lining up a foreground glass painting. The shot, seen via a set photographer's still camera with blend seemingly out of register. The foreground glass and set in proper alignment. 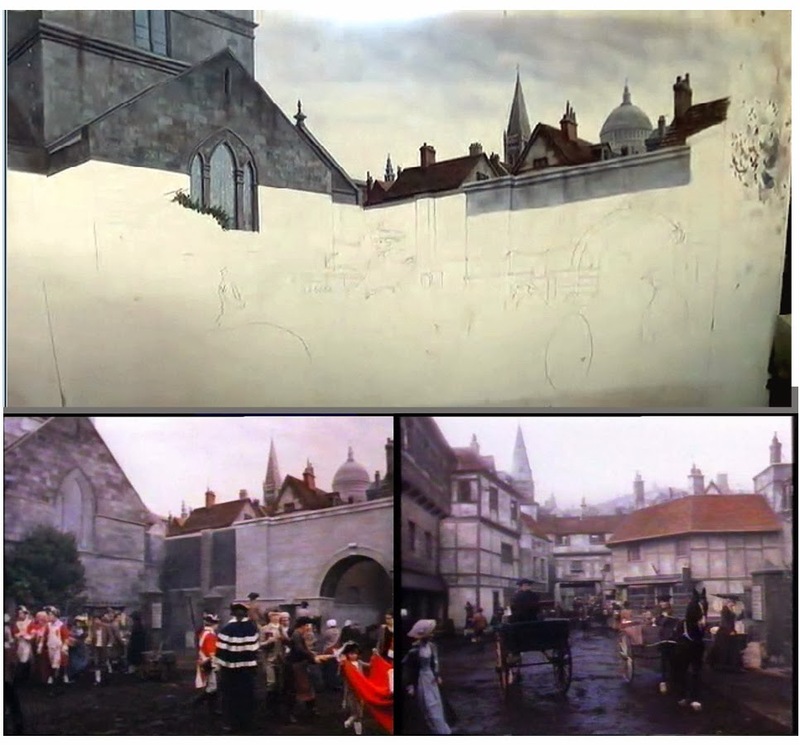 Not sure who painted this shot of the Tower of London for the film LADY JANE (1986). 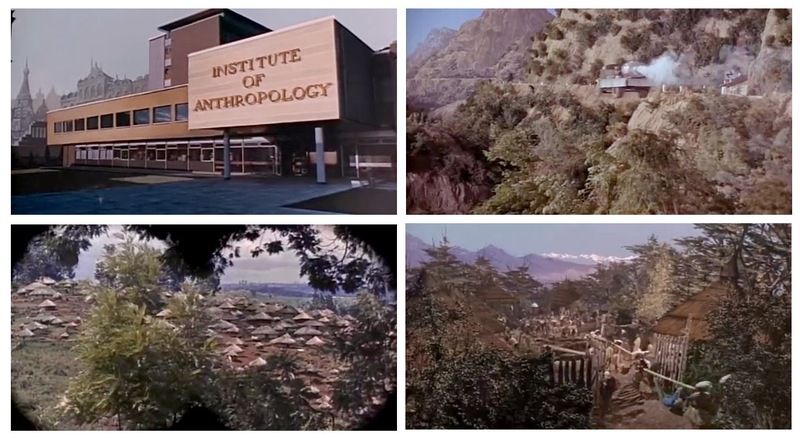 A pair of mattes from THE LONG HAUL (1957) with scenic alterations and additions. Close view of the final composite shot. 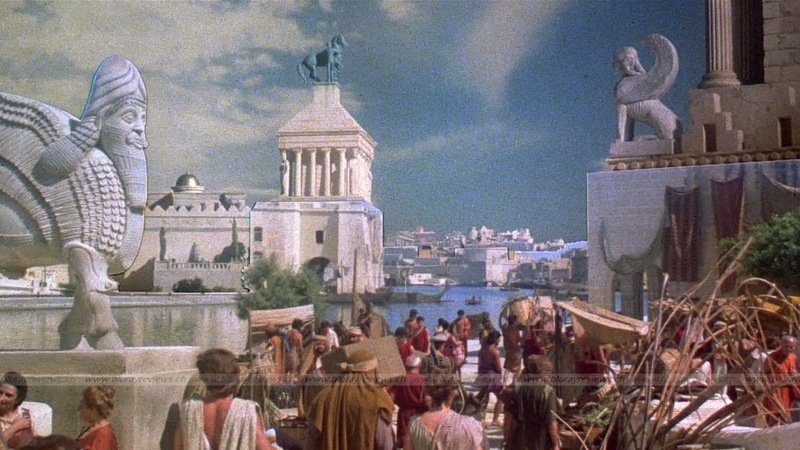 THE MALTA STORY (1953) - Albert Whitlock supplied matte art, Bill Warrington miniatures and Bert Marshall was visual effects cameraman. JULIUS CAESAR remade, possibly for tv in the 1970's. 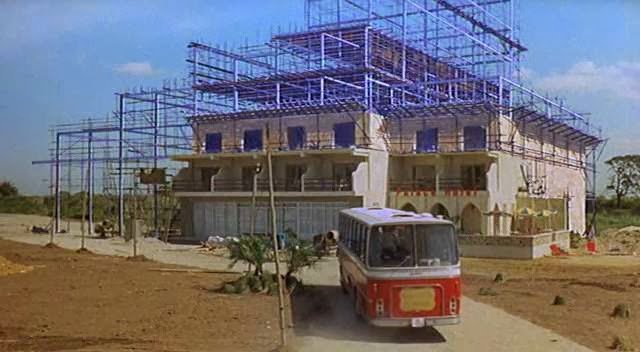 I think it was intended to be Pakistan or somewhere - a nice matte shot from the Eric Morcambe and Ernie Wise comedy THE MAGNIFICENT TWO (1967). Les Bowie received screen credit for effects, so whether Culley did the shot, I'm unsure. I suspect Cliff did, as Les was largely into physical effects by then with his independent operation. 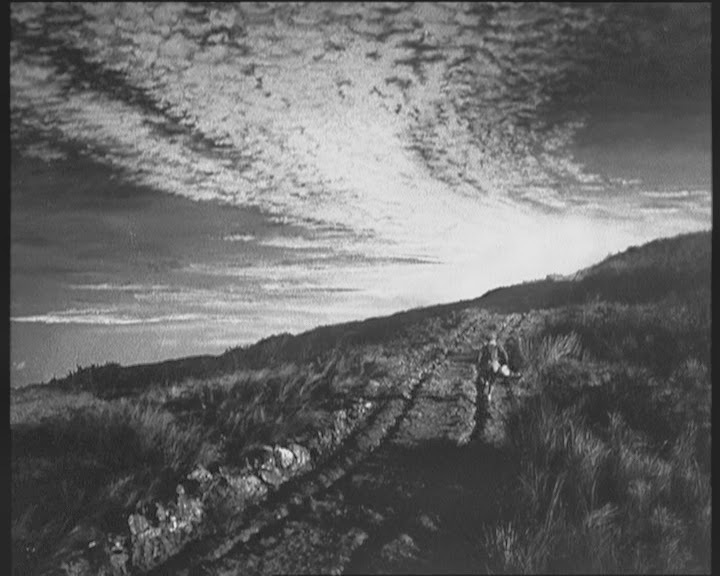 A second stunning matte from the same film - also attributed to Bowie. Whitlock, Melrose and Suttie were also active painting mattes at the time as well..
Two scope mattes from the Peter Cook (no relation) epic comedy MONTE CARLO OR BUST - aka THOSE DARING YOUNG MEN IN THEIR JAUNTY JALOPIES (1969). 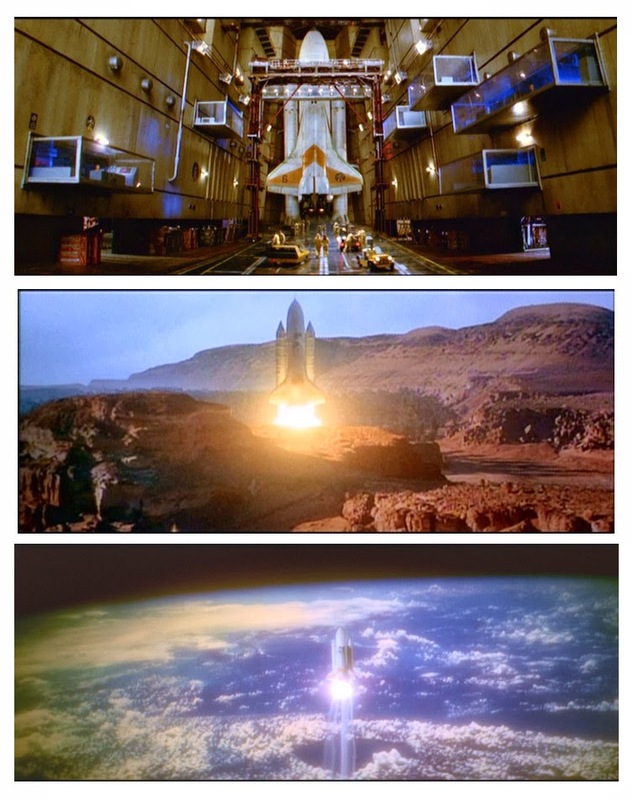 Two matte composites from the 1979 Bond picture MOONRAKER - a film loaded with effects shots, most notably some extraordinary model work from the great Derek Meddings. Lot's of complex optical work too by long time Pinewood veteran Robin Browne, with much of the substantial space material being multiple exposure 'held takes' on the original negative, with as many as 48 exposures (and as many rewinds and notching) to get pristine results without matte lines. No idea who painted the mattes. I know that Meddings had a long association with Ray Caple dating back to the Hammer days, so maybe Ray did these independently of Pinewood at his Bray matte studio. Not sure. 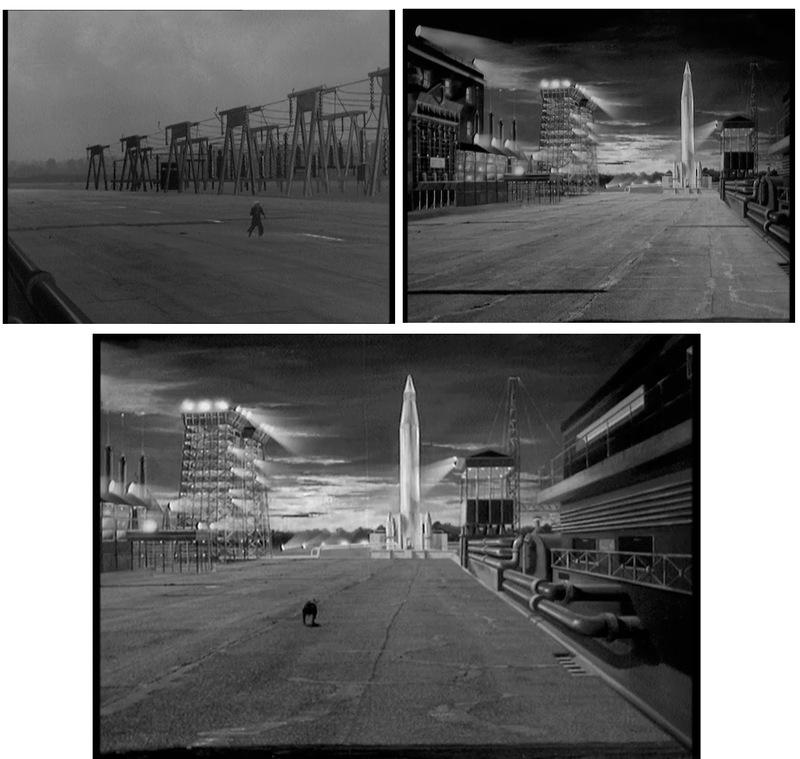 An utterly convincing composite from MOONRAKER - possibly an in camera foreground miniature of the shuttle launchpad and possibly even the truck as well, I'm unsure... but it's just the sort of thing Meddings would have done, and it's right on the money. 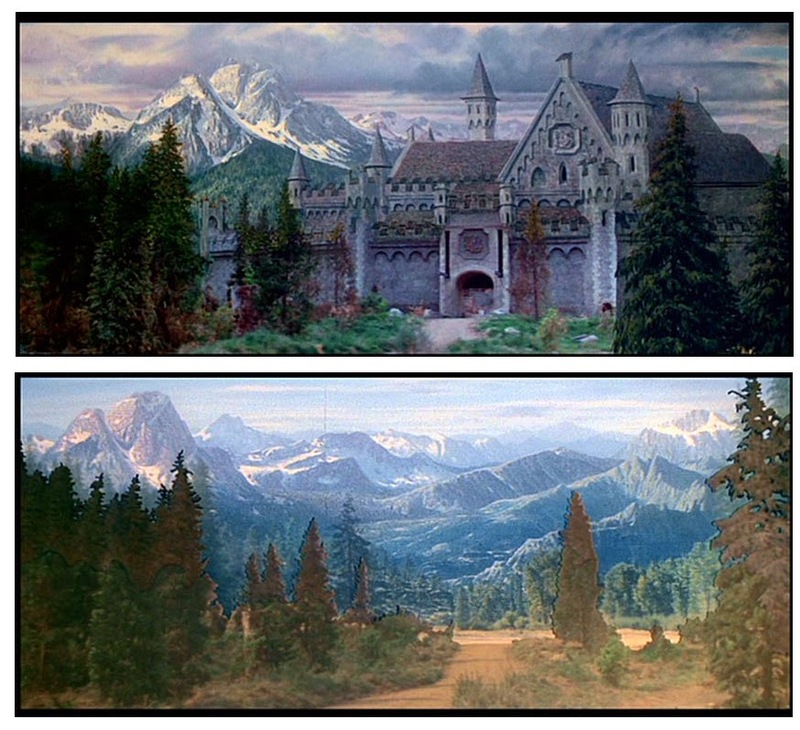 Also from MOONRAKER is this split screen shot with separate river and waterfall elements matted together with soft blends to dramatic effect. 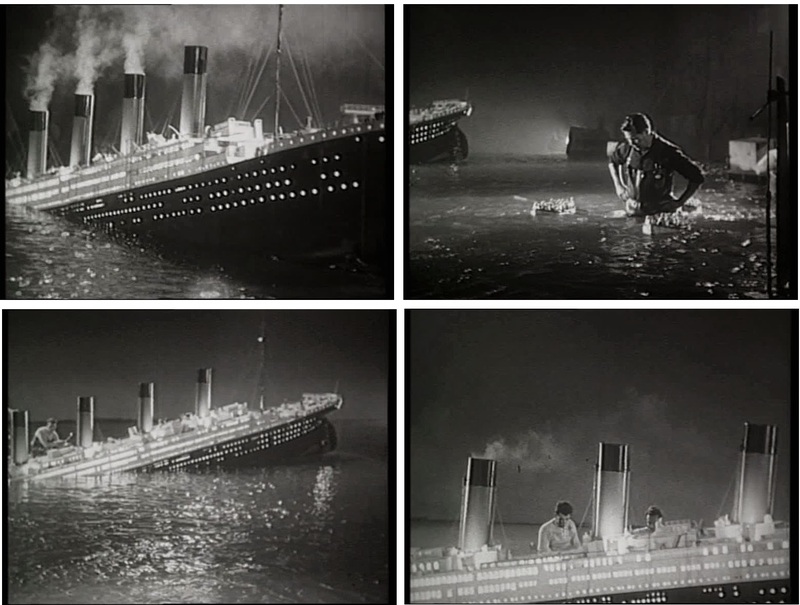 Rank's excellent telling of the Titanic tragedy A NIGHT TO REMEMBER (1958) was a top drawer film all the way. 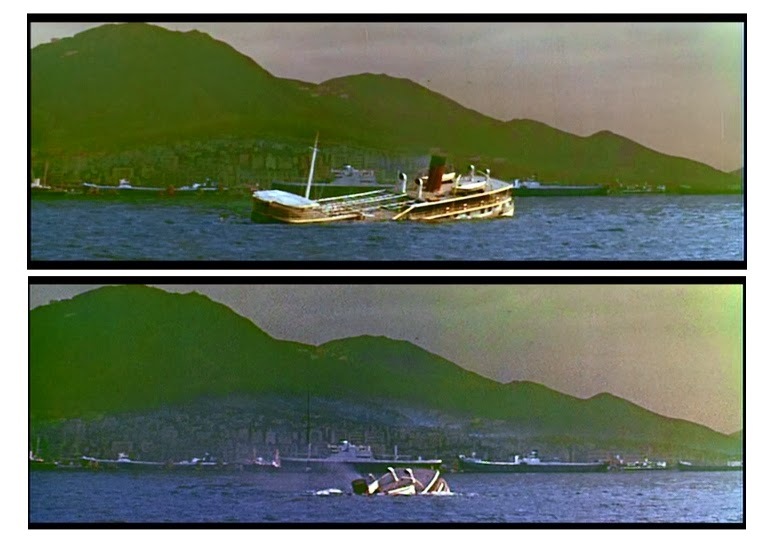 Bill Warrington handled the effects, which were mainly limited to large miniatures and process shots. 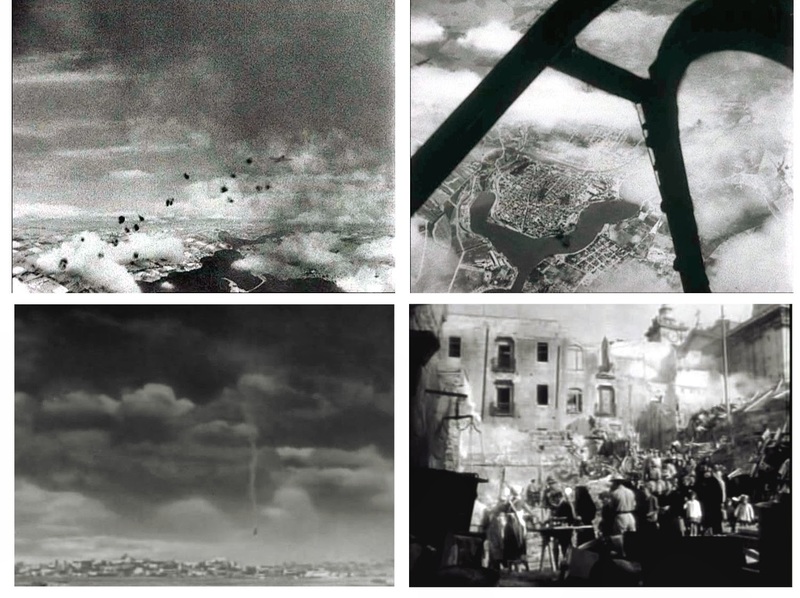 Several fx shots were in fact lifted from the 1943 German film of the incident - apparently made as Nazi propaganda or some such thing - though the footage is very good. Process projection of model iceberg and with prop guys dropping fake ice chunks. 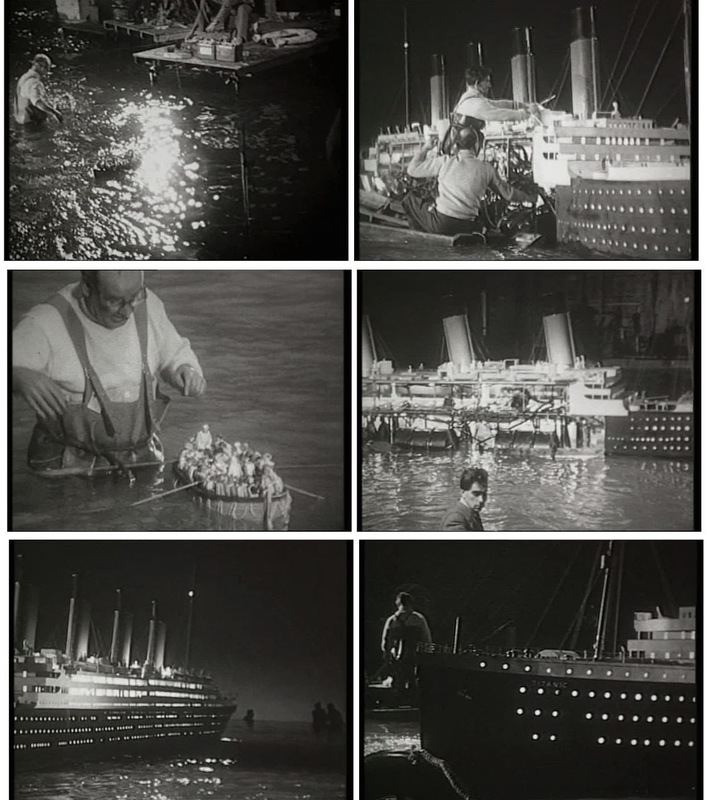 Some wonderful behind the scenes shots of Warrington and his boys setting up the large Titanic model at Pinewood. "I canny hold her together Captain...she's breakin' up." I liked this bit - and it's all simple model set and good process projection by Charles Staffell. The film is so well acted and paced you never notice the process screen adjoining the real set. Great movie. Now if this were the recent Costa Concordia disaster, the Captain would already be ashore, sipping a latte and assuring himself what a big fucken 'man' he was. The rather good Christopher Plummer-James Mason picture MURDER BY DECREE (1979) about Sherlock Holmes and Jack the Ripper had these Cliff Culley-Leigh Took shots. 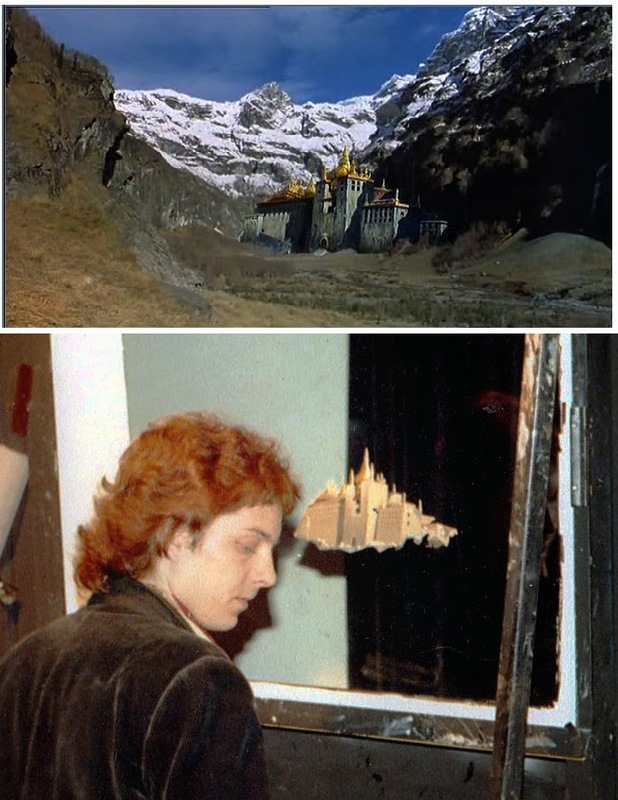 The top one is a painted cutout with a miniature foreground, while the other is a glass shot. Incidentally, Plummer and Mason make the best Holmes and Watson in years. 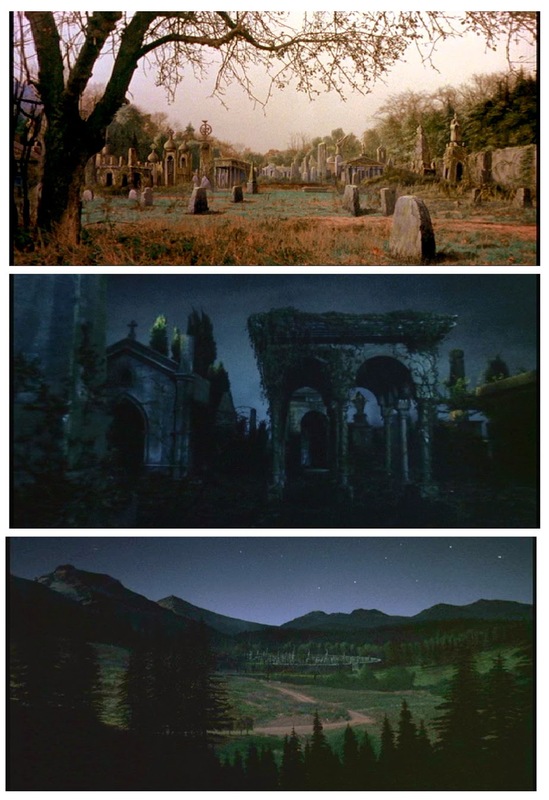 The not terribly good Clive Barker gorefest NIGHTBREED (1990) was a tour de force for matte artist Cliff Culley. Many matte shots and as many other effects such as the hell for leather fx laden finale. All solid stuff in an unmemorable film. Cliff brought his old Rank matte buddy Bob Bell out of retirement to assist on the many glass shots, and had a young apprentice named Terry Adlam on the team as well. Great matte work from NIGHTBREED. Oh, and that's fellow director David Cronenberg there in the top frame as a favour to that very, very strange Clive Barker.... I mean, have you ever seen this guy in interviews or seen his wacked out short films? Jeez! 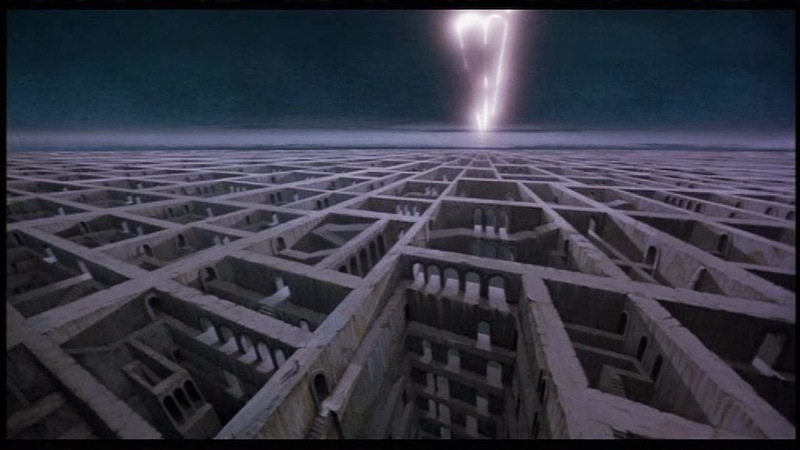 I always love these deep perspective matte paintings. 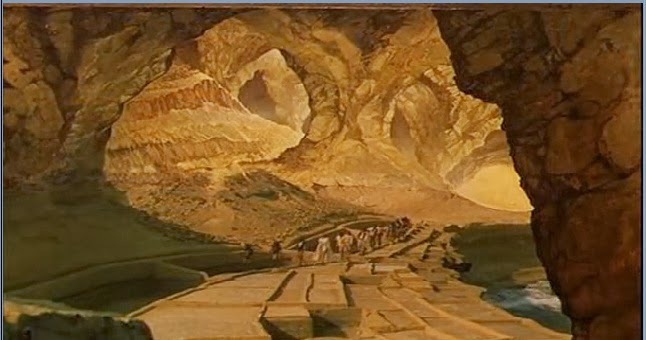 NORTHWEST FRONTIER: A Cliff Culley painting combined by travelling matte with the performers on a set representing a very busted railway bridge and some untrustworthy villainry afoot. Same film... with a surprisingly good Bond in fact, George Lazenby, who could have gone on to knock out a few more if he hadn't behaved like such a prig with the producers. One of the best Bond films. OHMSS. Cliff was longtime friends with director Peter Hunt, who was a veteran film editor. Says Cliff: "In my opinion, the technician who really made the Bonds what they were was Peter Hunt, the editor. It was he who, when he realised that what he had in DR NO was a straight out thriller that wasn't really working, had enough foresight to suggest a re-cut of the picture and the inclusion of some one-liners, and sure enough he soon had people laughing with Bond as opposed to him. I think Peter was a saviour to those films." One of those matte effects nobody ever notices - also from OHMSS - where Culley has superimposed the neon sign 'casino' into the rippling waters of the swimming pool with the letters breaking up once the setting has been established. 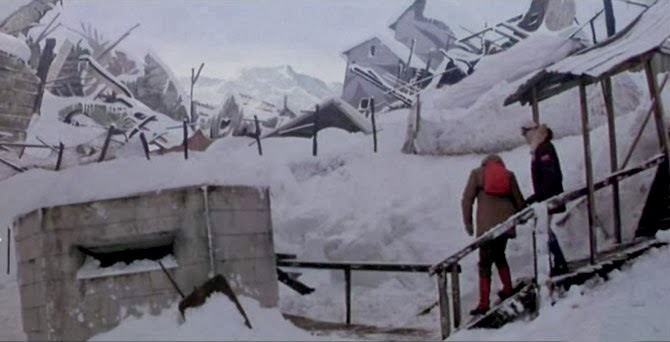 Also from OHMSS is the terrific avalanche, whereby after the scary and real 2nd unit footage we get this great bit where Lazenby and Rigg out ski the snow flow. All done with tabletop models and optically inserted characters. Effects cameraman was Robin Browne. Cliff discussed the scene in an interview: "It was a very small set up. The trees weren't that much more than a foot and a half tall, and the snow was just bags of salt." The entire model was set up on a small stage at Pinewood that would eventually become Culley's base of operations when he set up his own effects company years later, Westbury Design & Optical. 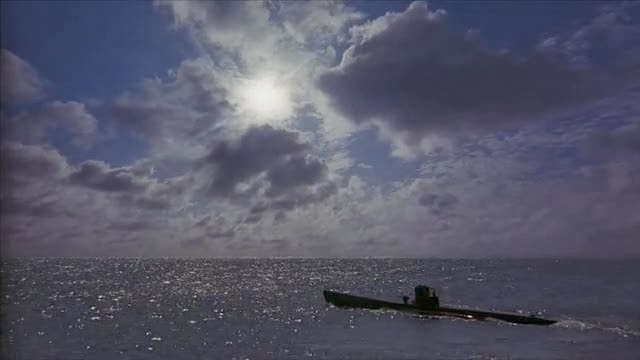 I'll bet no one ever noticed Culley's contributions to the other Bond picture THE MAN WITH THE GOLDEN GUN (1975) where Cliff had to create skies, cotton clouds and sunlight that would burst through at specific points in the story. 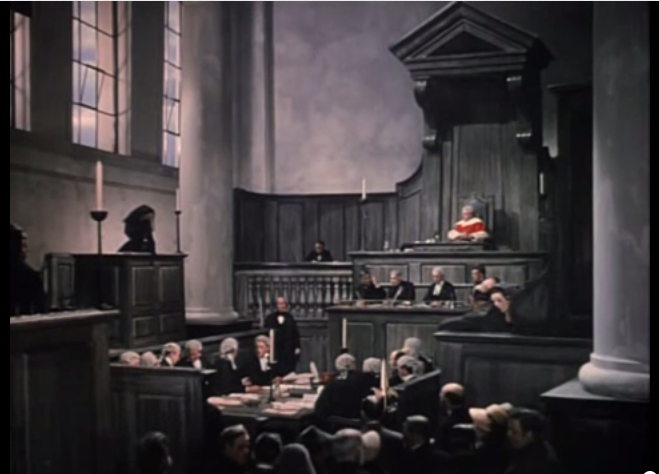 It's certain that Cliff picked up the cotton wool cloud gag from his beginnings at Rank, as it was used extensively on shows like OLIVER TWIST, with later exponents such as Al Whitlock making a craft out of it too..
One more of the old Rank effects proofsheets - this from David Lean's OLIVER TWIST (1948). These old documents provide invaluable technical info on the studio's approach and use of trick work. I am indebted to Leigh Took and Dennis Lowe for giving me these wonderful pieces of history. 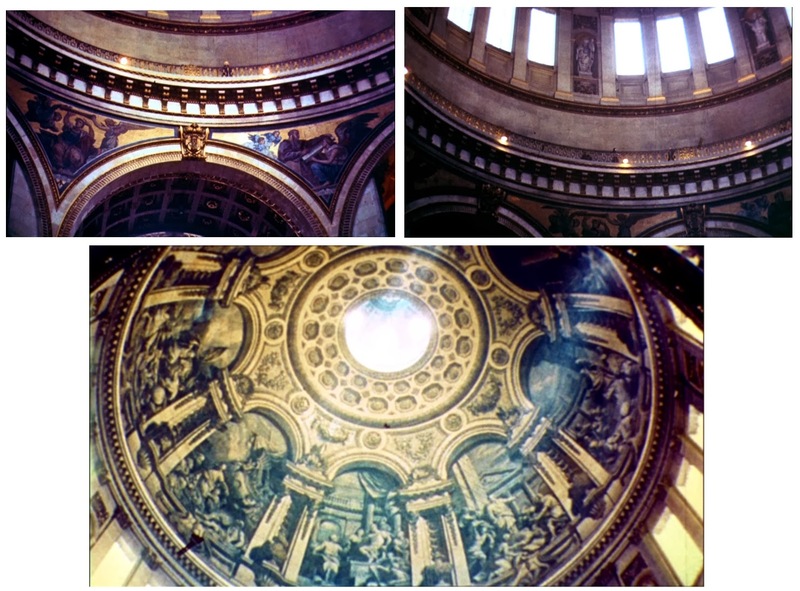 The St Paul's multi-element matte comp as seen in close up. According to Cliff Culley, Les Bowie executed this shot. 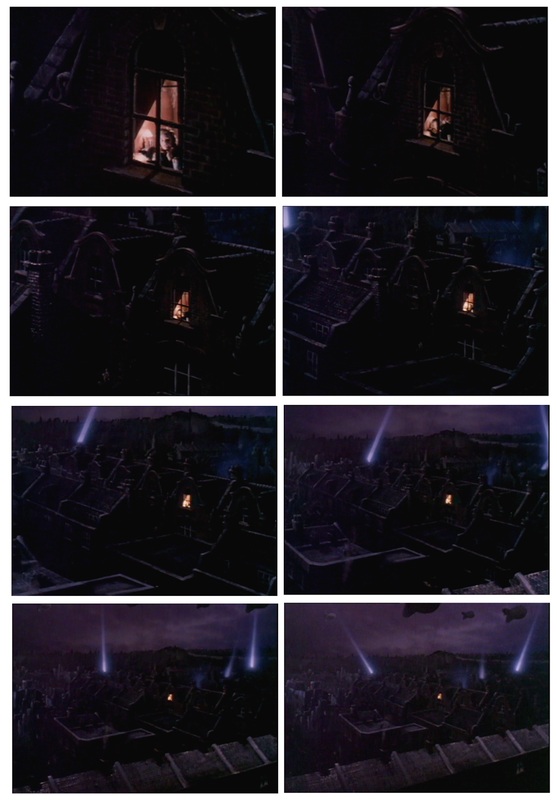 Several amazing cloudscapes open the film OLIVER TWIST, and for the most part they are visual effects. 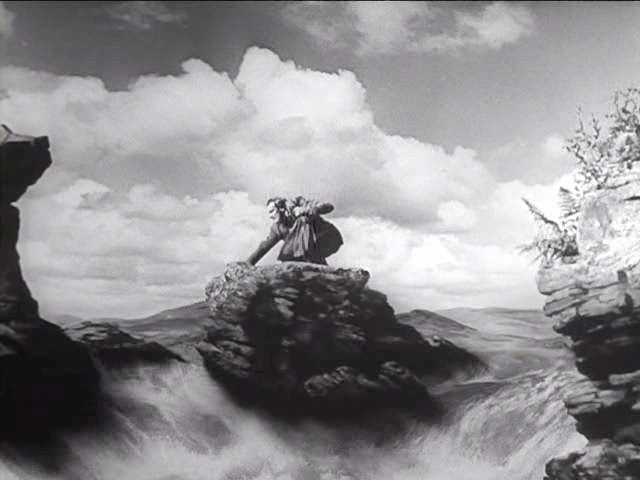 This shot is an important story setting piece and art director John Bryan discussed the various effects shots in the film in a 1948 journal: "The opening scene from the film shows a girl climbing and stumbling over a rough hillside, and the director, David Lean, wanted to accentuate her pain by having a thunder storm. Across the sky can be seen the rising storm clouds and the girl is buffeted by the wind and soaked. It was decided that it was useless trying to find an actual location, and even if we did find one it would have meant a camera unit staying there until a storm occurred, and then the clouds would probably have gone in the wrong direction. 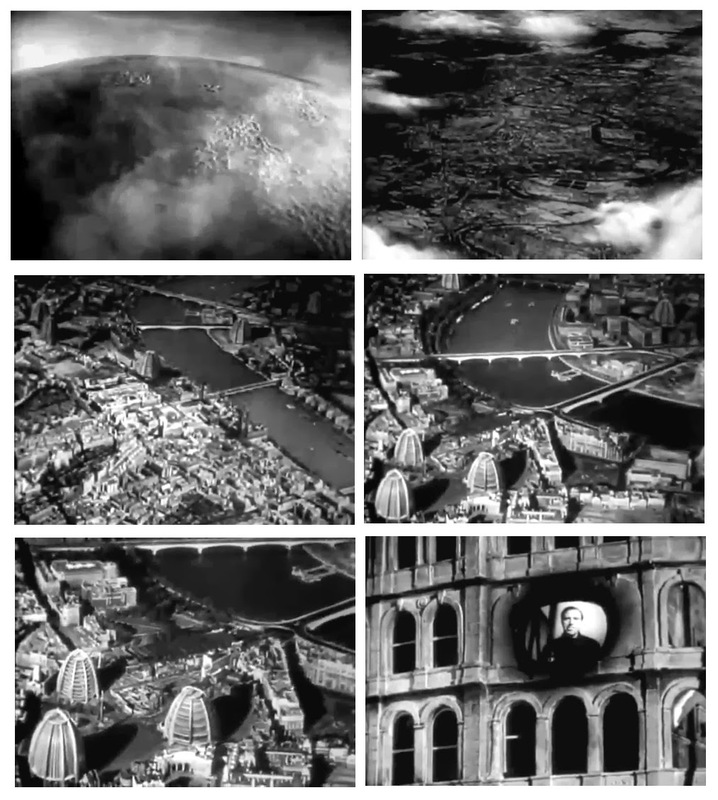 I produced a series of sketches covering the whole sequence, and from these we set about producing the desired effects. 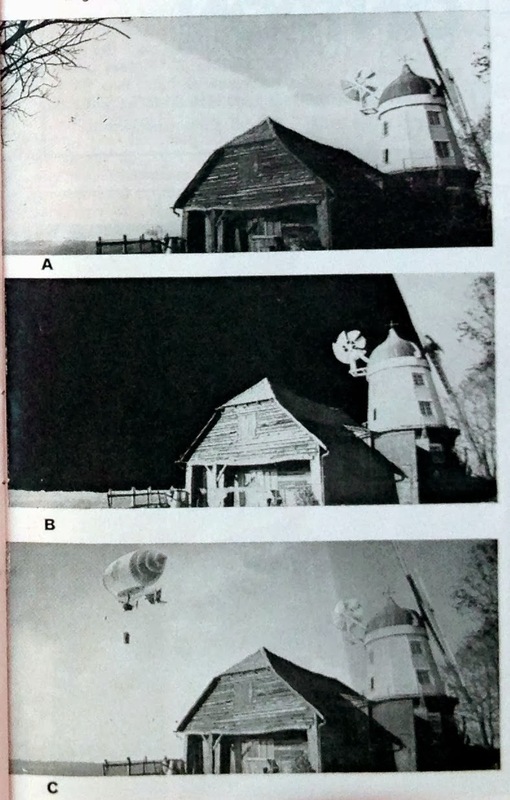 After a great deal of experimentation, the Pinewood special effects department found that they could produce the effect of the storm clouds by the use of cotton wool applied in the desired shapes upon sheets of glass. These glasses, which were in a series, were then motivated by mechanical means in the required direction. 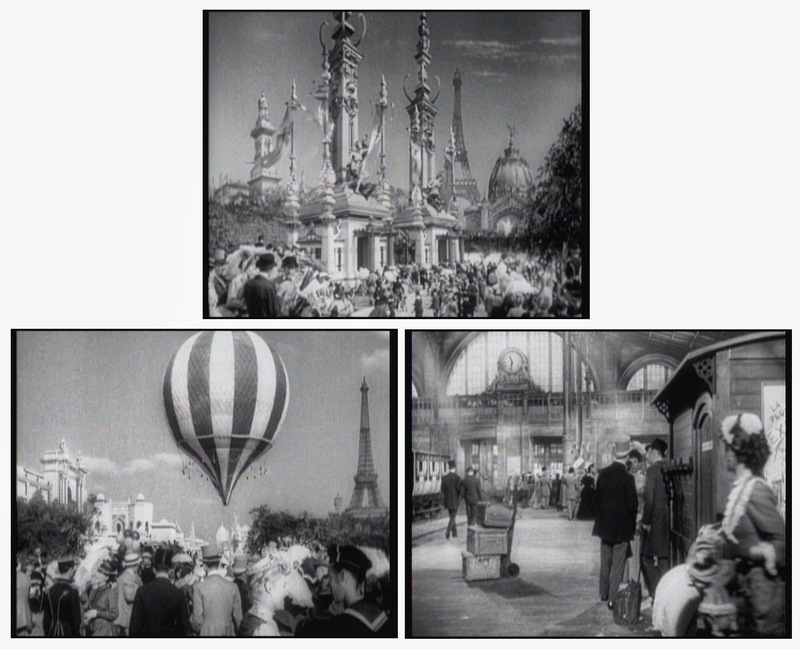 The resultant film of these manufactured clouds was then used for back projection plates and also matte shots. 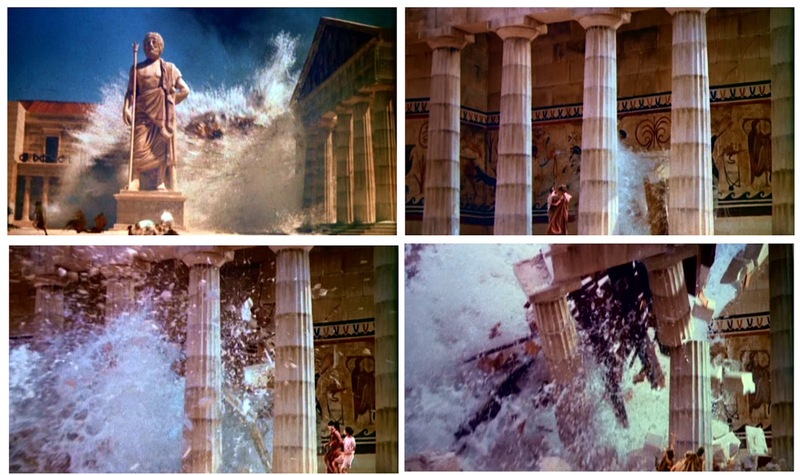 The rain effects in this sequence were produced the same way." You'd never suspect it... cotton wool clouds pasted onto several glass sheets and moved mechanically. 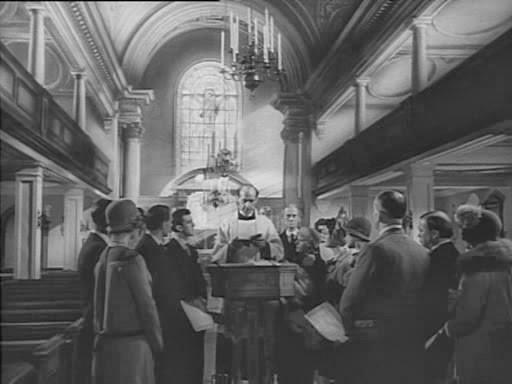 Joan Suttie and Stanley Grant were credited with the effects in OLIVER TWIST. 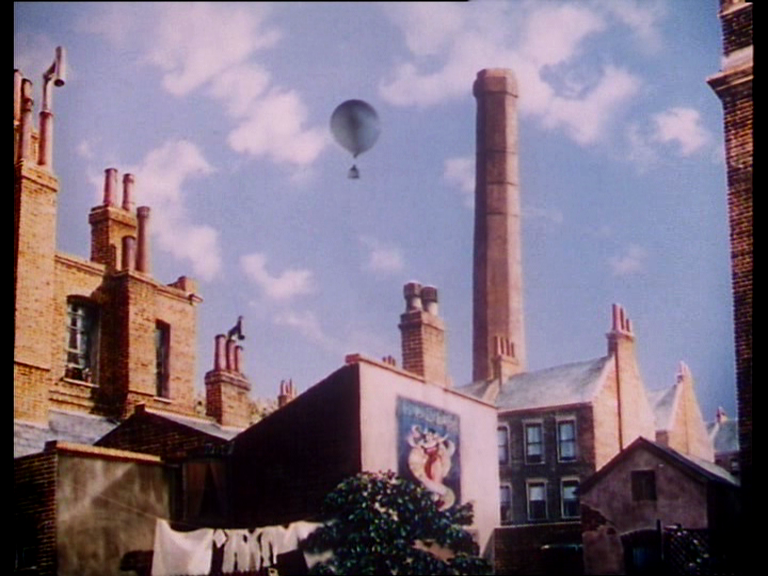 More from OLIVER TWIST - painted foreground rooftop and multi-plane cotton clouds. Bowie's complete glass shot as seen in the film. A beautifully executed painting and an utterly invisible trick shot. 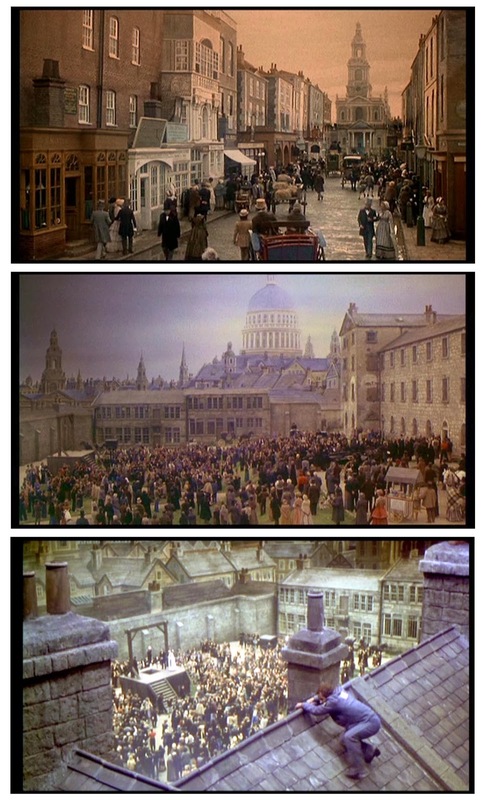 Of course, being the timeless classic that it is, OLIVER TWIST was remade a few times over the years, with these frames from a nineties version with Leigh Took supplying the mattes and effects. The terrific true life story THE ONE THAT GOT AWAY (1957) with the excellent Hardy Kruger - who was never better - as the German flier who would not be a captive POW in Britain. 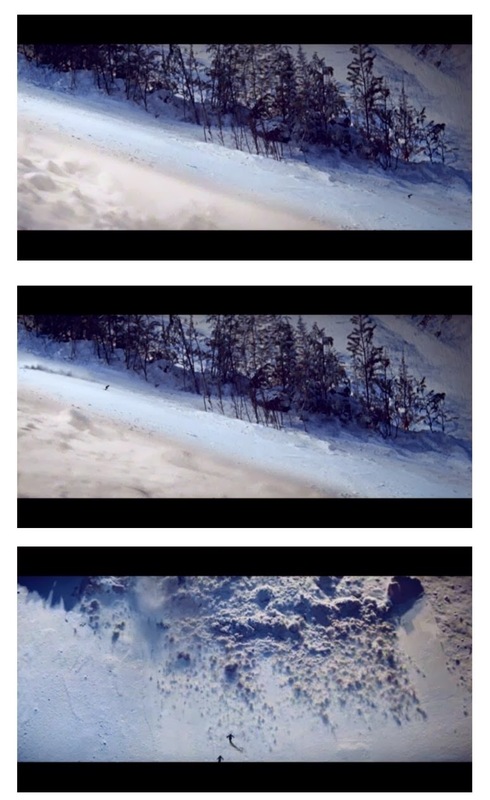 Outstanding film with just a few minor effects such as this miniature plane crash and the shot below. 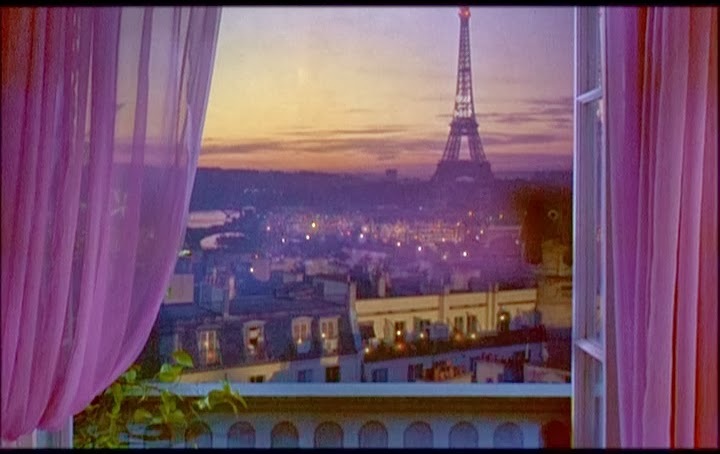 Cliff Culley's matte effects from THE ONE THAT GOT AWAY. 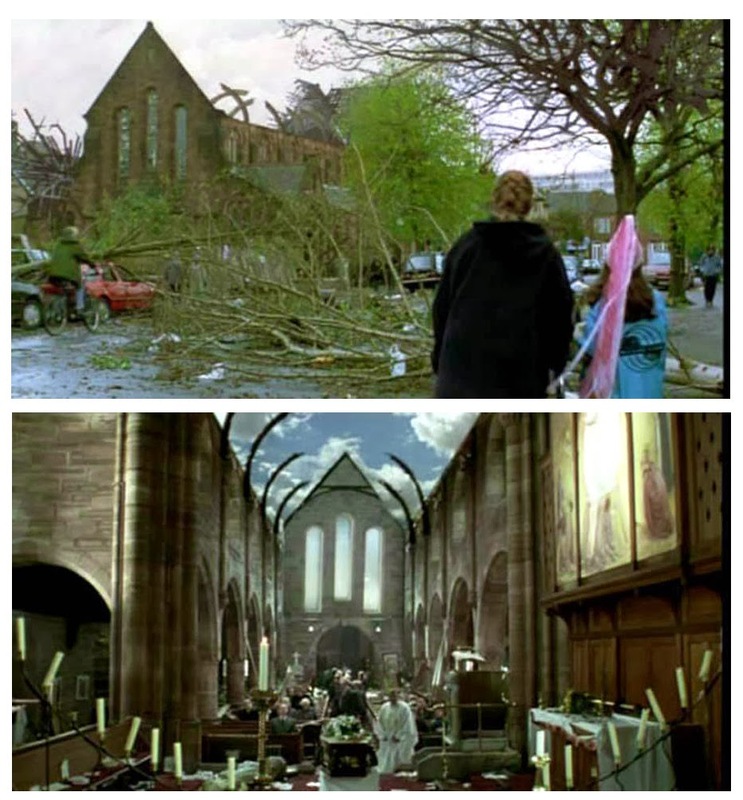 Two of several mattes Culley produced for a British television film in the nineties called ORPHANS. I don't know anything about this one at all, nor who did the painting - though I feel it's Cliff, as the handwriting matches the matte below, which is Cliff's work. It appears to be called 'S.S' according to the tag on the glass but it's all a mystery. 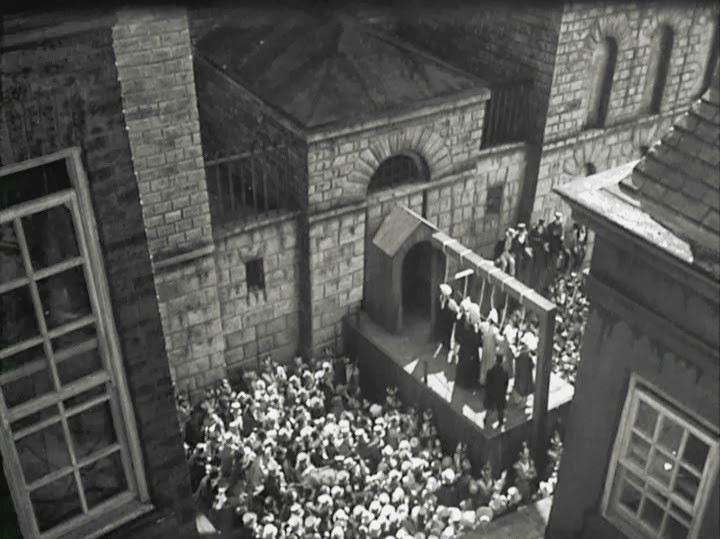 Anyone know this shot from any British or European film? I love this one. 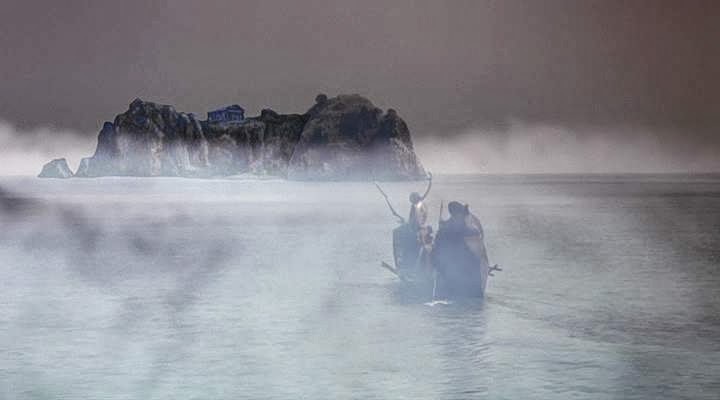 Always love those extreme perspective mattes, and this Cliff Culley glass from a long tv miniseries called PETER THE GREAT (no relation to your blogger) made in the mid 1990's. 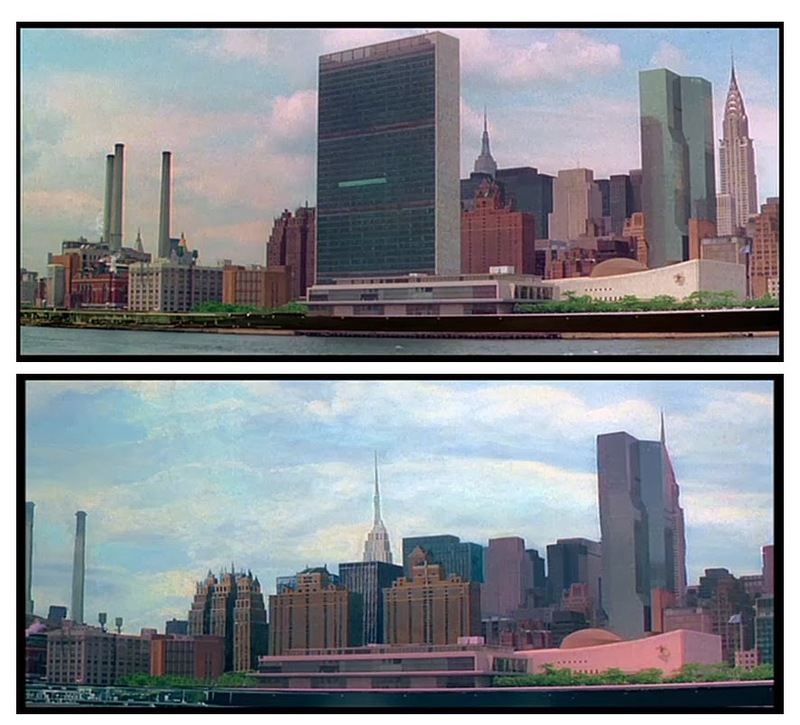 Quite a bit of matte work and some truly dire optical work appeared in the 1976 film THE PINK PANTHER STRIKES AGAIN. 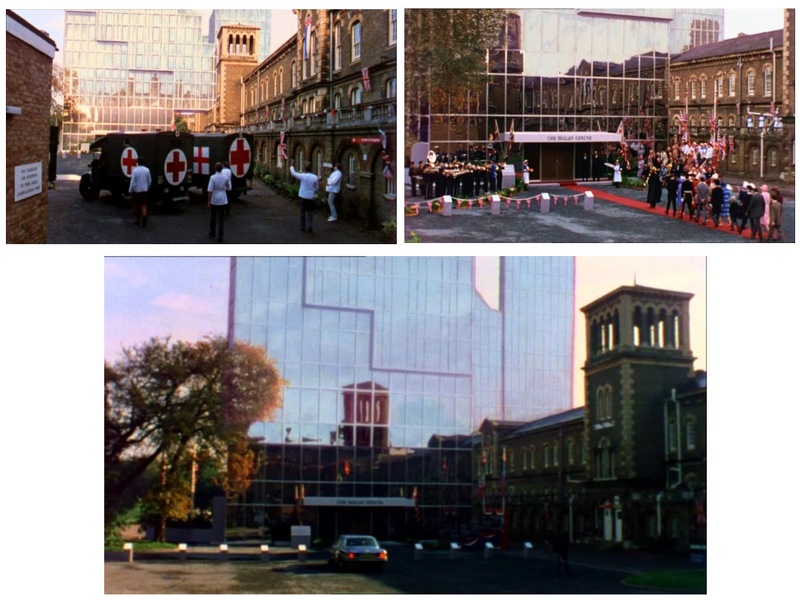 It's all too clear this fx project was a bit of a mish mash, as I heard from Matthew Yuricich that he was called in at the eleventh hour to redo some matte shots as the producers weren't happy with what had been done at Pinewood. Not sure what exactly, but my guess is this shot above. Same film - the plot involves a ray that turns buildings invisible as I recall from 30 years ago... the paintings themselves aren't bad, though the perspective at top is way off - but the composite photography is utterly dreadful - with thick marker pen matte lines, unsteady elements and for the laser beam optical printed stuff, a whole shitload of bleed through and obvious garbage mattes popping up all over the place (same thing occurred on YOU ONLY LIVE TWICE!) If you think the matte lines are bad here, try watching it in CinemaScope on a 60 foot theatre screen as I did, back in the day. Also PINK PANTHER STRIKES AGAIN - with a vanishing United Nations building. Future stop motion animator Steven Archer helped Culley on the effects shots in this film I believe. 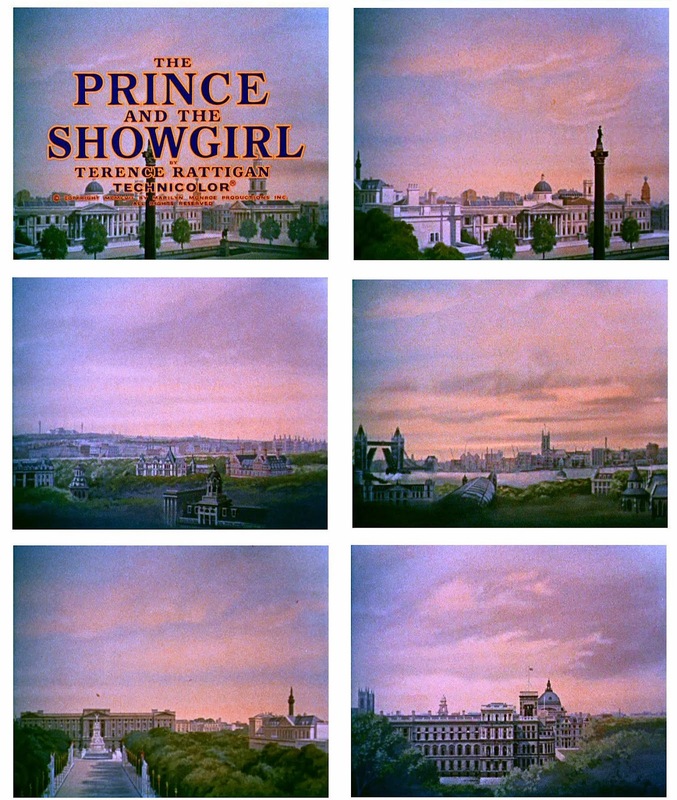 Laurence Olivier's PRINCE AND THE SHOWGIRL (1957) was loaded with mattes, miniatures and the most unfathomably bizarre back projection scene I've ever witnessed! 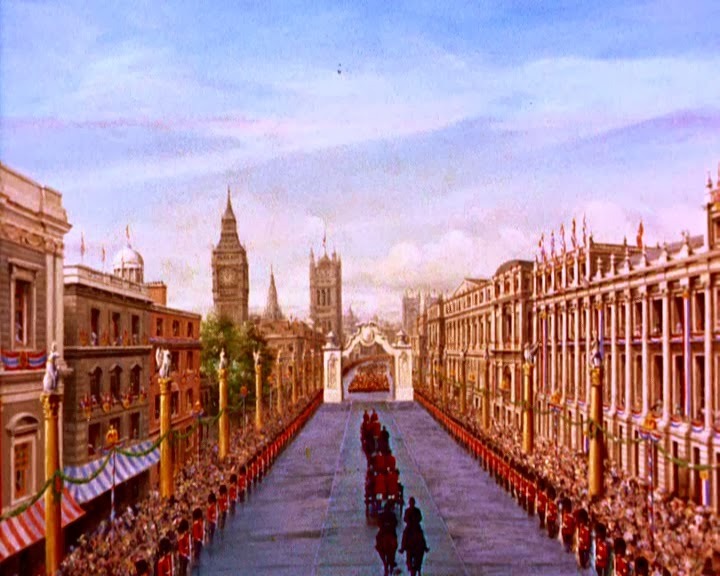 This opening shot is a pretty impressive 360 degree pan around of Victorian London - evidently a vast painted cyclorama which must have taken a few gallons of paint to achieve. It looks good on screen though. 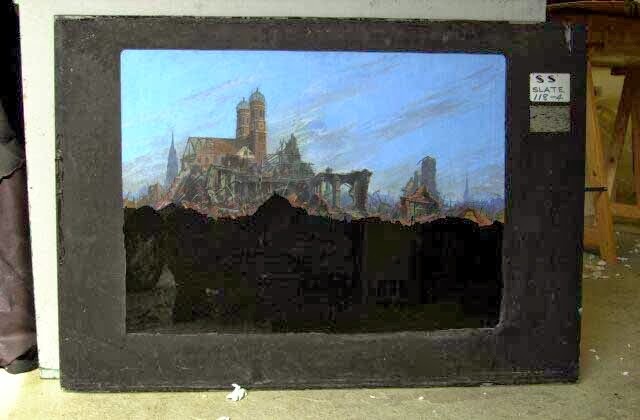 Same film - painted backing of London, miniature foreground with a camera 'crane down' move into window. Bill Warrington headed the effects, with Charles Staffell on process shots and I presume Cliff Culley and others on the many and highly variable painted mattes. Many, many mattes in this show - and of quite variable quality, suggesting more than one hand at work on the art. The odd colour hues are a mystery, with some mattes ruined by bizarre tones and wrong colours altogether. Whether that's a problem with the DVD mastering or a part of the real 35mm release prints, I don't know. Anyway, the above shot has a lot of matte enhancement going on - with the whole thing a massive effect. 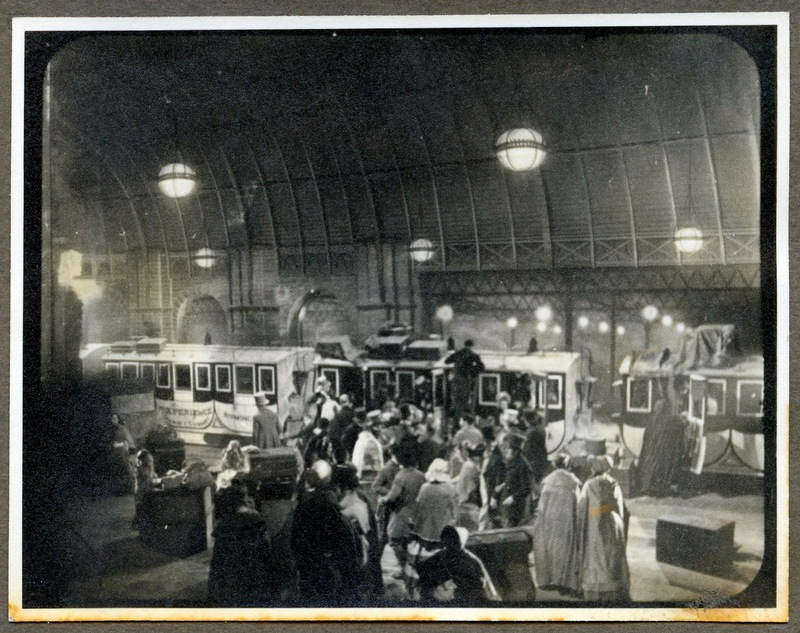 The carriages and a small bunch of onlookers are real, with the rest a glass shot. More from THE PRINCESS AND THE SHOWGIRL with strangely pastel hues and tone for some reason. Same show - more matte art, and very nice art at that this time, suggesting a different hand altogether. 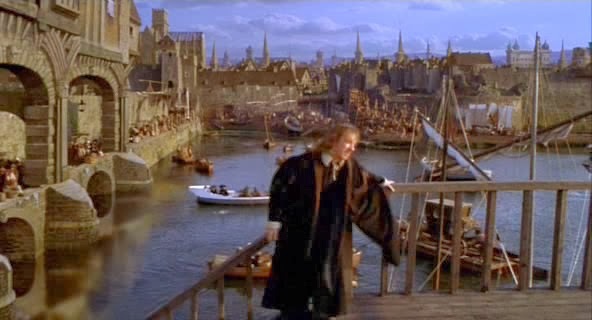 Same film - a substantial matte shot. 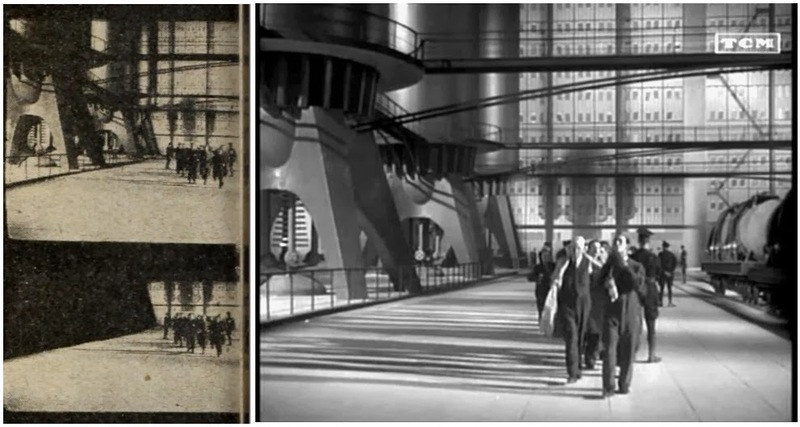 Same film - a nice little segway from stained glass to real life. Cliff Culley and Roy Field shot. Very nice matte, beautifully executed and expertly blended just above the heads of the actors. Last matte in the same film. 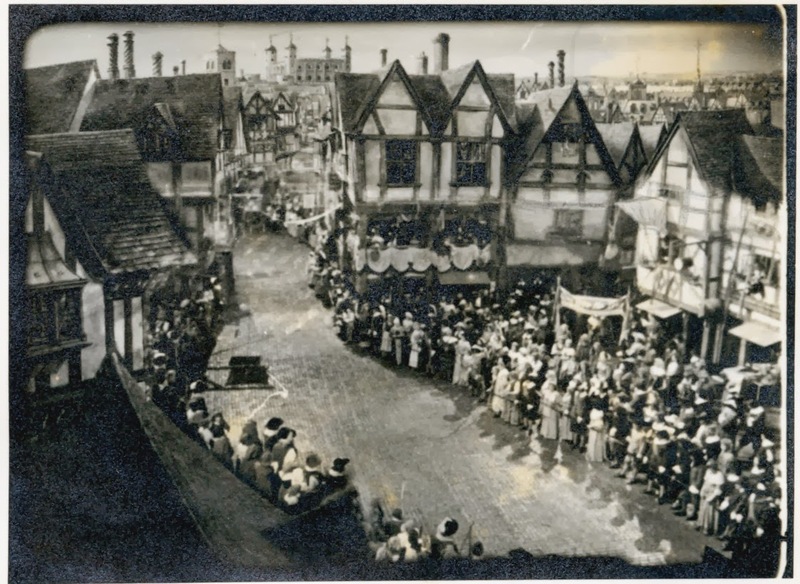 I have to mention the utterly bizarre process shot I alluded to earlier... there's a scene in the palace where I think it's Larry Olivier who stands near a window watching the passing procession for memory. Well, the process plate used in that back projection out the window is a panning shot (!) leaving the viewer to wonder if in fact the whole bloody palace is on wheels and moving along with the parade! Jesus! Don't know how that got past the editor. 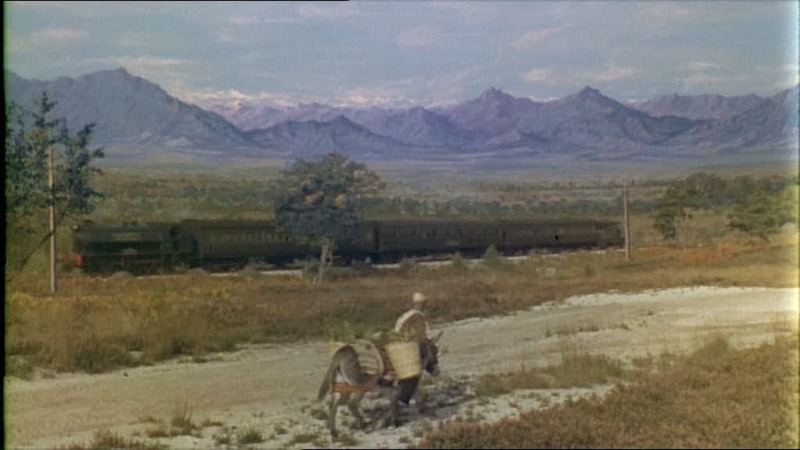 The 1954 war drama THE PURPLE PLAIN had some subtle matte and model effects. 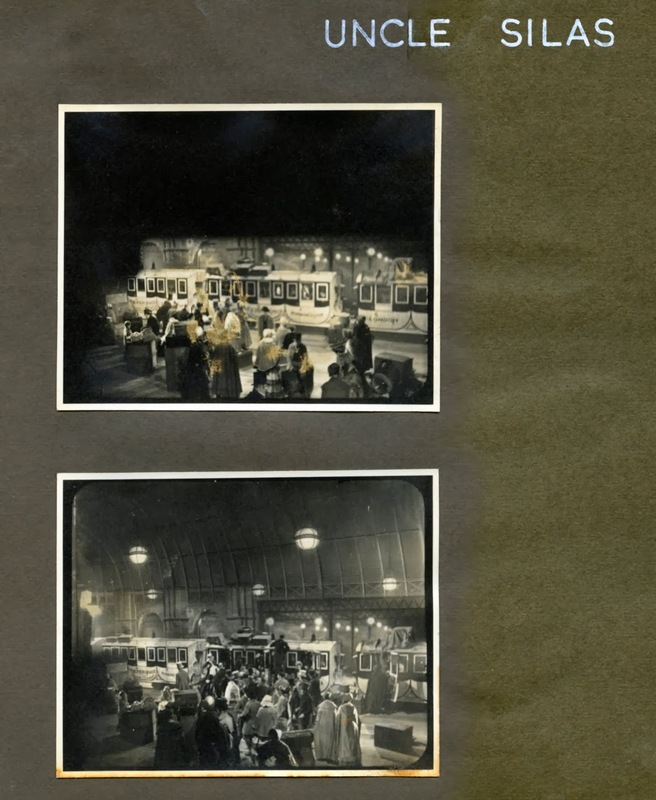 A before and after Albert Whitlock matte from QUARTET (1948). I like Al's perspective work here. Disney made a number of kids films in Britain through the mid seventies, none of which were terribly good (and I'm a Disney fan). 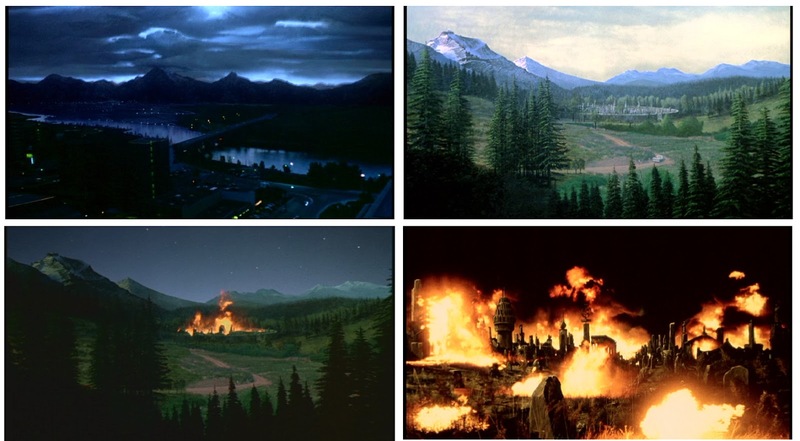 ONE OF OUR DINOSAURS IS MISSING (1975) was one such show, with a variety of effects, some of which were sadly below par as the above frame demonstrates - not sure why. Cliff Culley was in charge as usual. 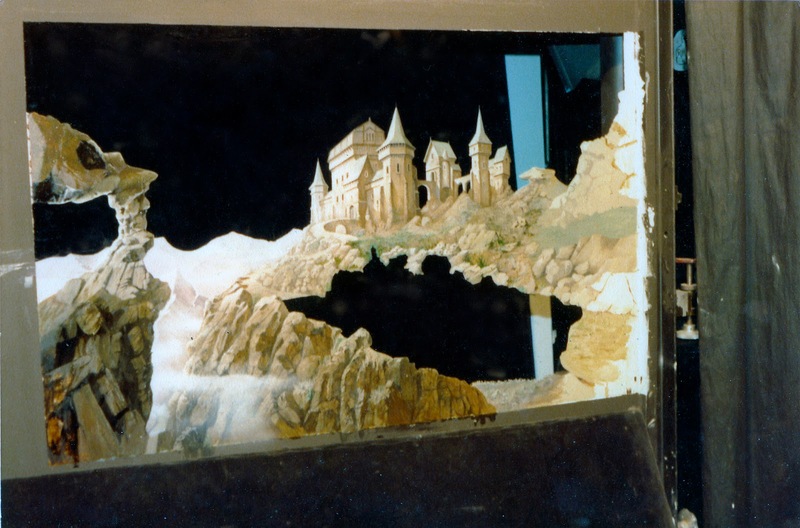 I like this one from the same Disney show - a full Cliff Culley matte painting. 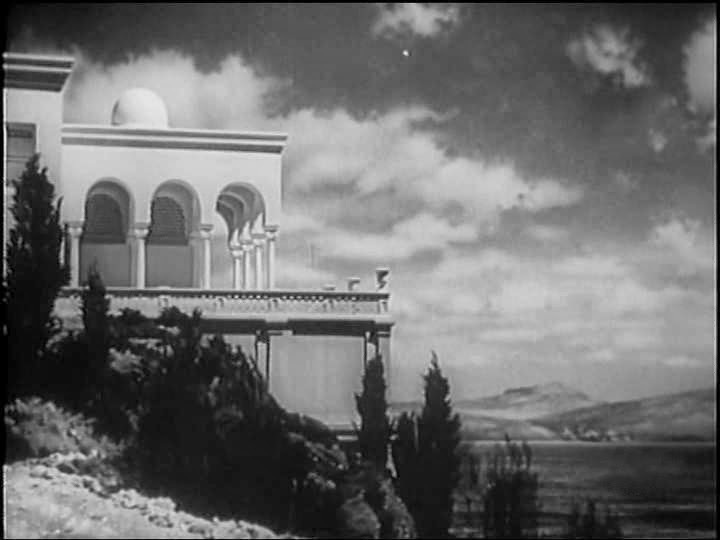 Albert Whitlock painted (and was screen credited) the mattes and foreground glasses for THE PLANTER'S WIFE - aka OUTPOST IN MALAYA (1952). The plantation matte above has significant 'jiggle' when viewed. Whitlock's exotic Malayan landscape, possibly a multi-plane glass painting with foliage on nearest glass. Same film - An interesting effects shot where Al Whitlock has painted all of the foreground foliage on glass, and I'm sure the nid ground foliage on a second glass by the looks of it, with the house probably a Bill Warrington model set up in front of another Whitlock painted backing. It all works well, and sums up the multi-plane glass approach that Rank often utilised so well. Last shot from THE PLANTER'S WIFE - with foreground glass painted trees and miniature house on fire. The use of foreground glass art saves the effect from losing depth of field when shooting models. Mark Sullivan told me that Warner Bros used to use this method alot back in the Golden Era. Another wonderful true life story from Rank - the story of Douglas Bader - a bilateral amputee who was an ace flier during WWII. Some great effects work here too, with future Bond effects chief John Stears given his first chance in the trick biz by making models of this very biplane shown above. Bill Warrington was effects supervisor, Bryan Langley handled the travelling matte composites, Bert Marshall photographed the many excellent model dogfights etc and Cliff Culley provided the matte art. 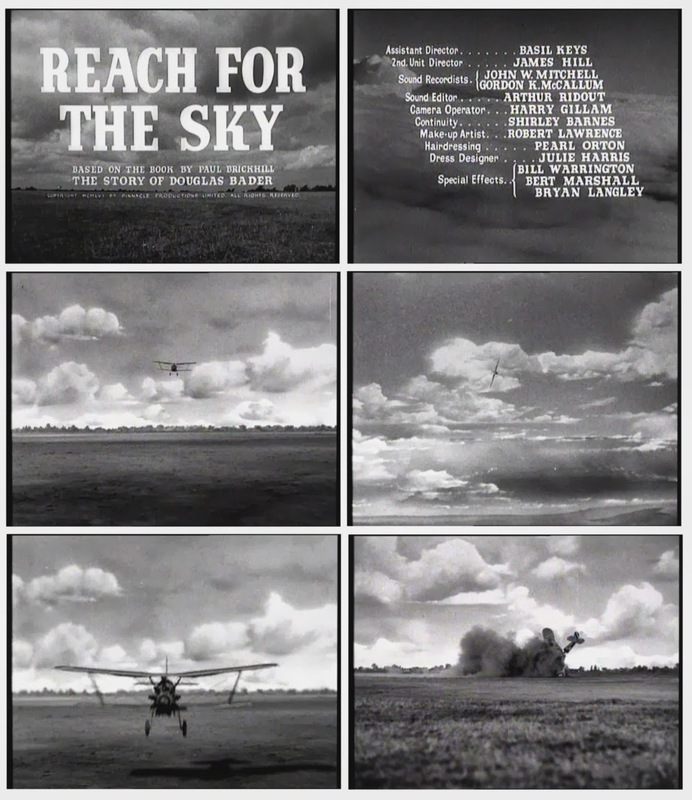 I've always been fascinated with miniature dogfights on film, and REACH FOR THE SKY (1956) has some really nice work. REACH FOR THE SKY - Cliff Culley's matte of Colditz castle, and a beautiful aerial squadron effects shot. This one's a really interesting little film - THE NET - a sort of mixture of sci-fi and military espionage with some spectacular action sequences. Bill Warrington was fx chief and took care of the miniature spacecraft/airforce vehicle, Bryan Langley was optical effects cameraman, Bert Marshall shot the models and Albert Whitlock painted the mattes. Of note here, are the excellent sound effects utilised in the film. THE NET - aka PROJECT M7 (1953). An Albert Whitlock matte shot. 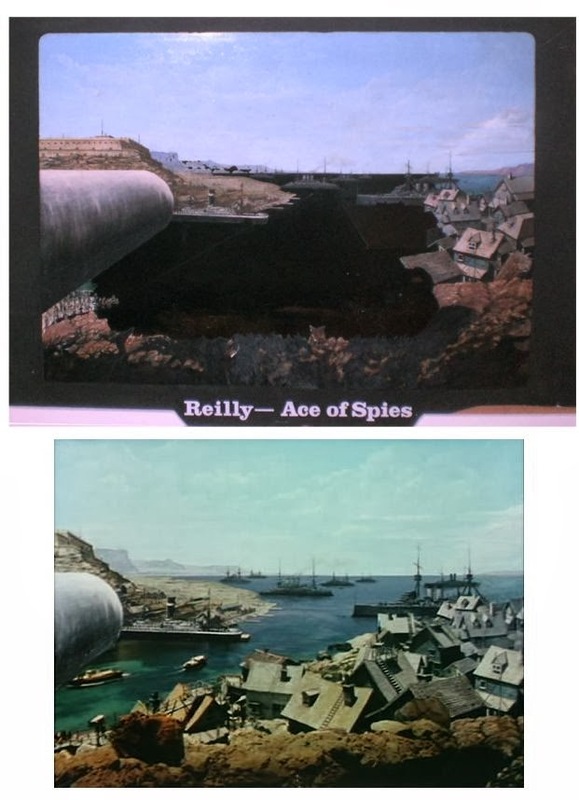 The popular early 80's television series REILLY, ACE OF SPIES had some invisible mattes and effects. Leigh Took painted this view of a busy harbour and military hardware. 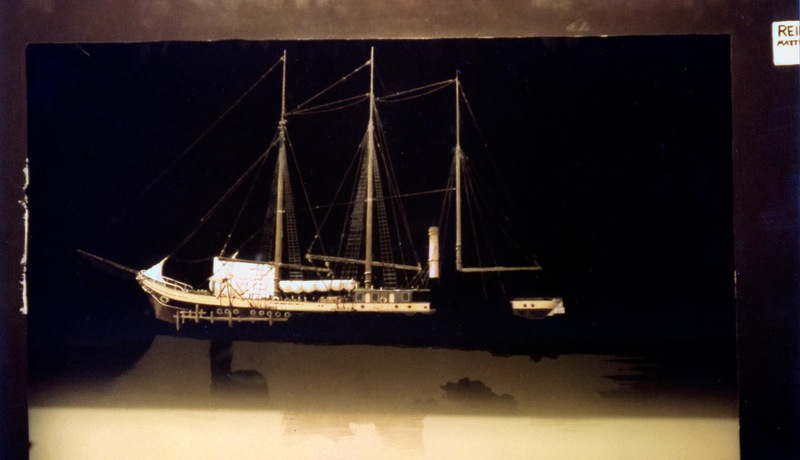 Also from REILLY, ACE OF SPIES is this glass matte of a schooner, painted by matte artist Leigh Took. 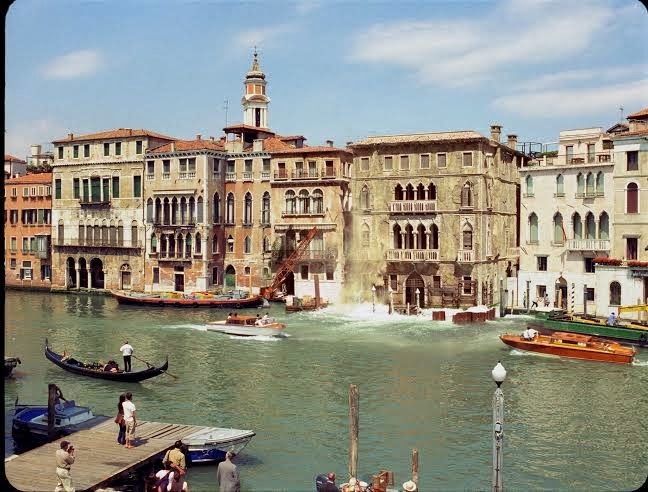 For the 1954 incarnation of ROMEO AND JULIET, Albert Whitlock was assigned as matte painter. 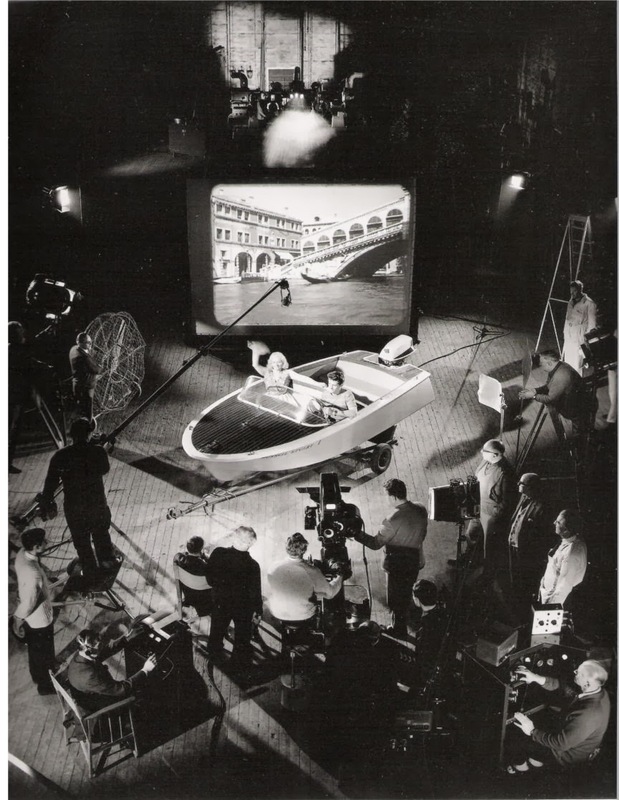 The exciting SINK THE BISMARK (1960) was one of the best model ship shows ever, with veteran American model specialist Howard Lydecker coming across to Pinewood to supervise the effects. Many Rank effects people were also on the crew, with John Stears as model builder, Martin Shorthall and Robin Browne as camera assistants under Skeets Kelly. Bill Warrington, who had already left the studio by then came back as an effects supervisor. Cliff Culley also worked on the film. 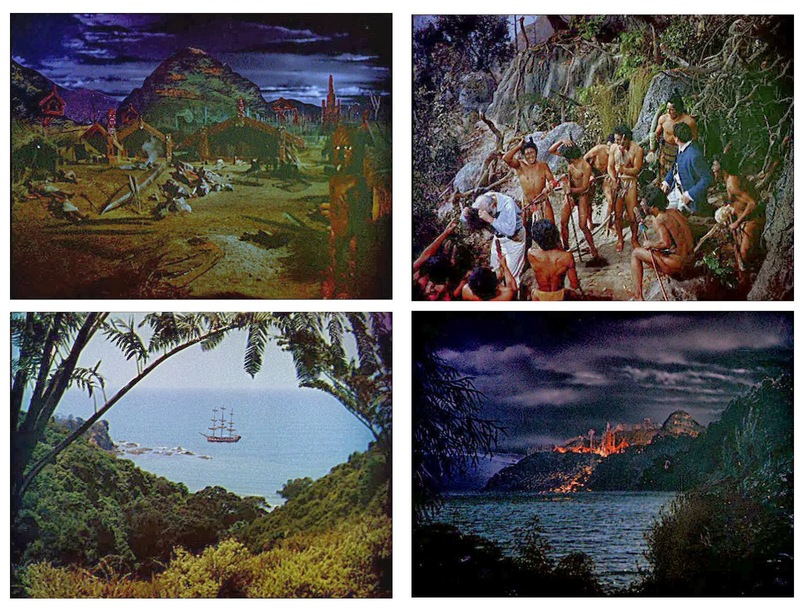 Set here in New Zealand, THE SEEKERS - aka LAND OF FURY (1954) was naturally a big hit here. My mother used to tell me stories about the filming with Jack Hawkins and Glynnis Johns, as a fair chunk was really shot here, surprisingly. 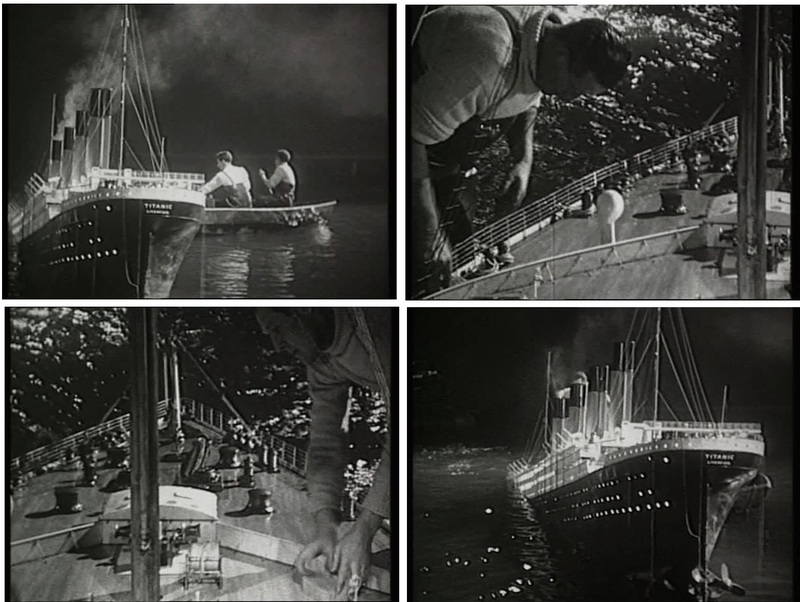 Lot's of effects work, with Albert Whitlock's many matte paintings taking the lions share of trick work. 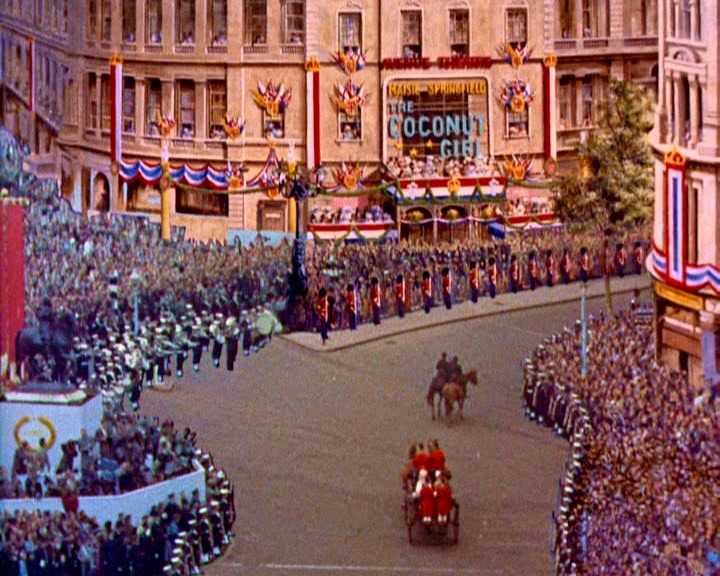 Whitlock once stated that this was his first colour film. Whitlock matte art of sailing ship. Albert never got a screen credit on this one, with just Warrington and Guidobaldi getting their names up on screen. Whitlock was busy on this show and was probably assisted by Cliff Culley or Peter Melrose. Former Disney matte artist and old time Pinewood effects crew member, Alan Maley (centre), shown here in the effects department with assistants while shooting a matte painting for the Bond film THE SPY WHO LOVED ME (1977). 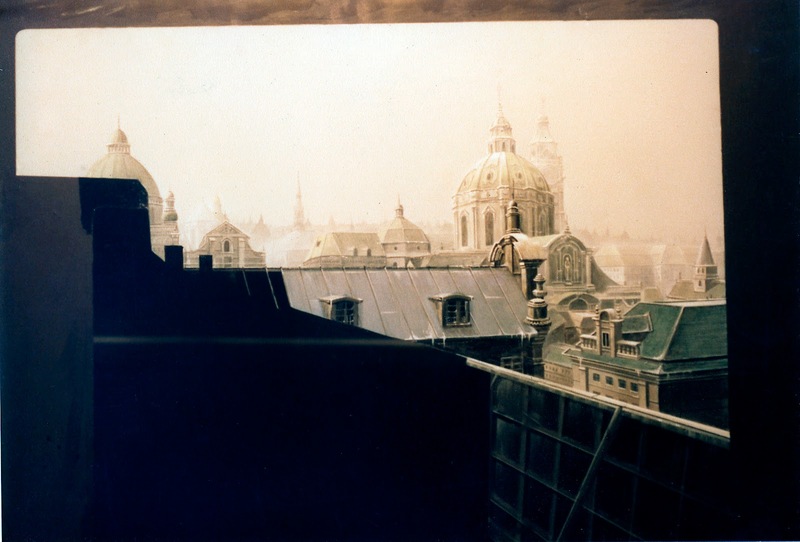 The opening sequence from SPY WHO LOVED ME with this classic Moscow imagery has always lent me to suspect either a matte painting, or maybe a heavily retouched photo blow up. The foreground roadway, lights and river with ice look as though some artistic additions have occurred, though I might be wrong. One of Alan Maley's barely detectable mattes from the same Bond film. Everything is painted here except for a bit of sand with Roger Moore walking toward camera. All of the people are faked and are given the illusion of reality by means of a slot gag with a revolving wheel behind the art, which is slightly evident through the scraped away patches of paint where the painted people's hands are, suggesting clapping. It's all an old time gag which has been used for decades, especially at MGM under Warren Newcombe to great effect. Alan Maley's painting for above scene. SPY WHO LOVED ME - arguably the best Bond film of the lot, with a credible villain, taught action, great effects and some cool stunts and theme song. 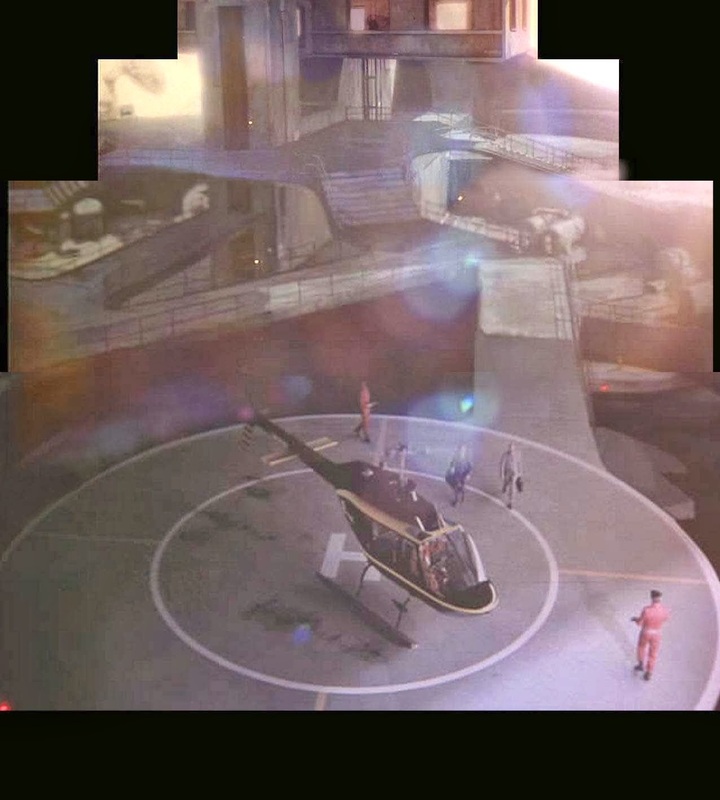 This scene is the piece de resistance of the whole shebang, with this incredible pull out from a close up of the helicopter, revealing the vast structure and then pushing in on Stromberg standing atop at a window, watching the action. 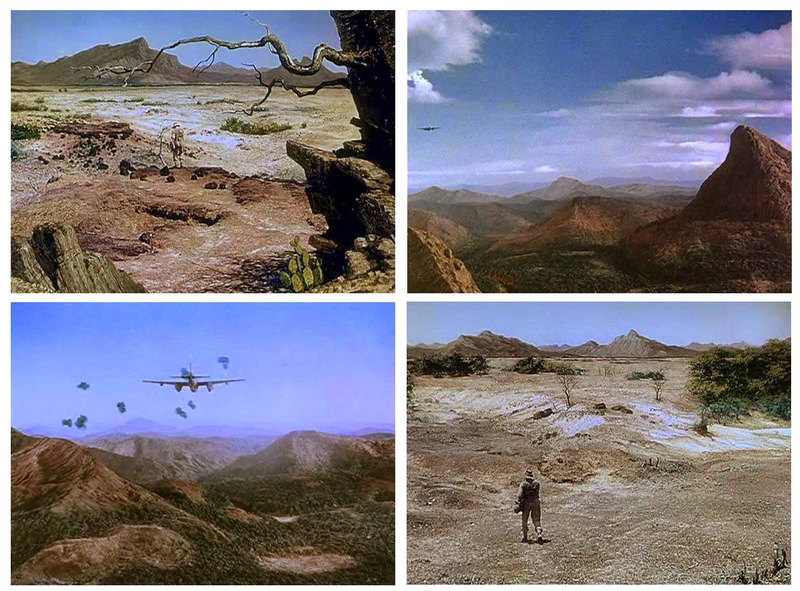 The only live action is the helicopter and those guys - the rest an amazing bit of matte art (possibly multi-plane) by Maley. Apparently Alan used front projection to composite it and the added lens flares just sell the shot so brilliantly. Incredible shot for the time. Close look at the first part of the shot. More from the same shot. Same shot as camera moves in toward Stromberg. End of the camera move. 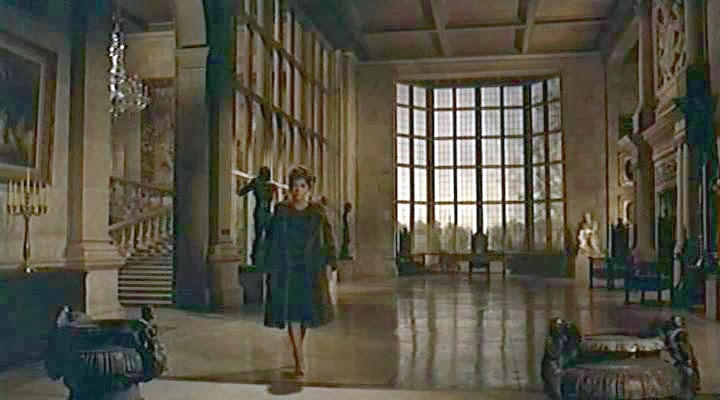 Famous Bond production designer Ken Adam was blown away by how well this shot turned out, as was director Lewis Gilbert. Another of Alan Maley's effects shots, with Bond at the pyramids in Cairo. Split screen shot with the pyramids being miniatures (for special light show purposes) and a cardboard cutout of Roger Moore at right. 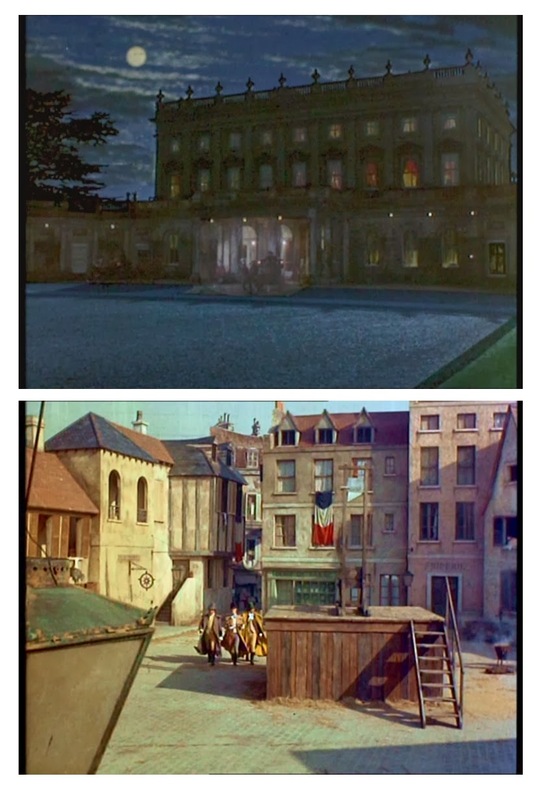 Note the glass painted hold out matte in place in front of the model pyramids to match the location plate..
Leigh Took's matte art as used for the mid nineties film THE TALE OF SWEENEY TODD. 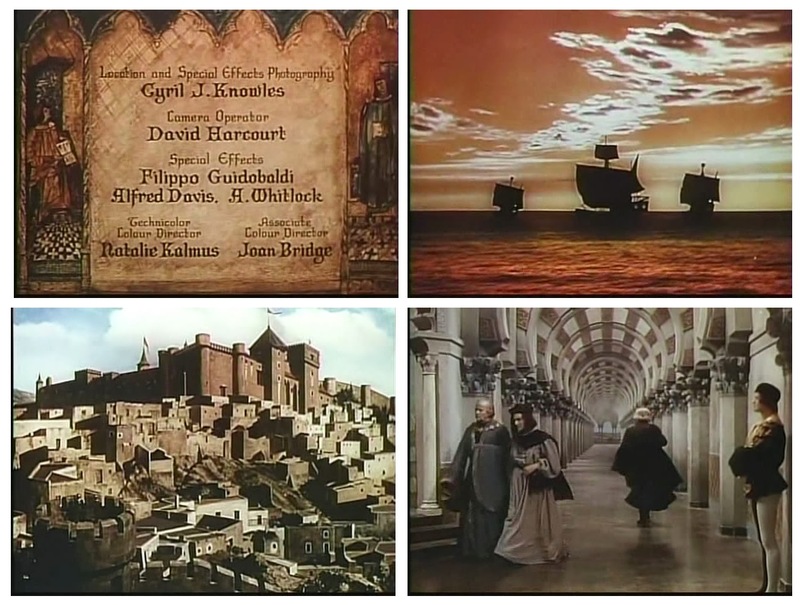 Although the film itself was solid entertainment, The revised Dirk Bogarde version of THE TALE OF TWO CITIES (1958) was let down by unimaginative art direction and very artificial, outright wonky matte work that just does not work, as evidenced above. This view of The Bastille looks as though it was quite literally transposed from a particular piece of classical art I've seen, but can't recall the painter. Looks identical to moi. 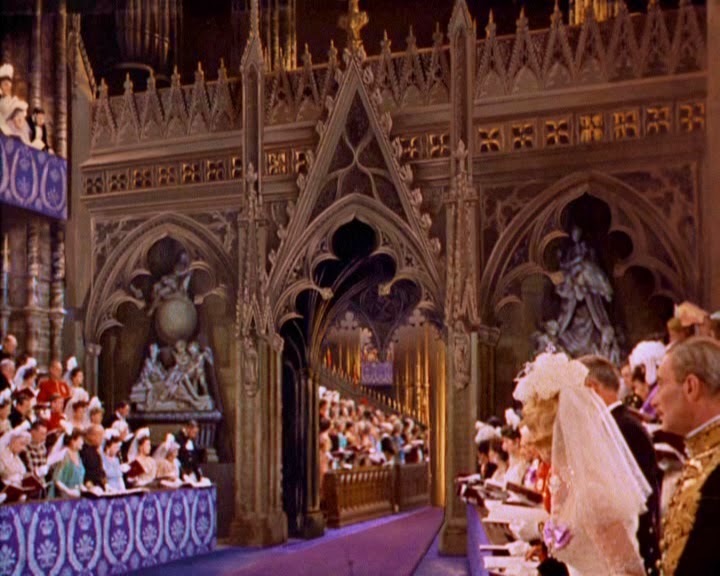 The old MGM version had some of the most sublime matte work I've ever seen... pure magic. 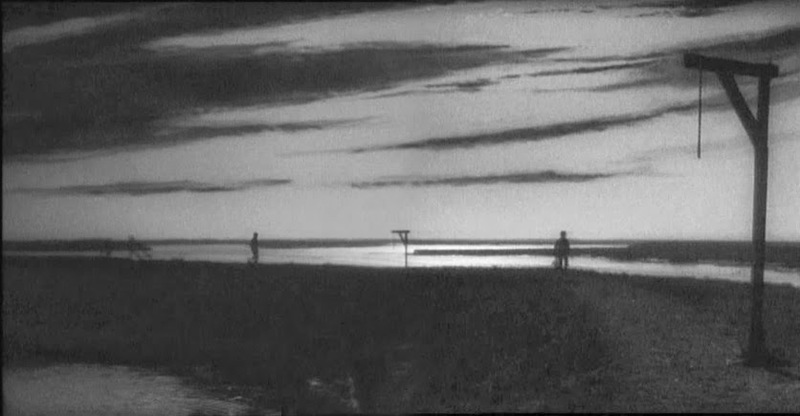 Terence Fisher's SO LONG AT THE FAIR (1950) had some intriguing matte work. Both Les Bowie and Albert Whitlock painted glass shots on this film. Also from SO LONG AT THE FAIR - a good thriller by the way and worth a look. The rather amusing Norman Wisdom vehicle THE SQUARE PEG (1958). 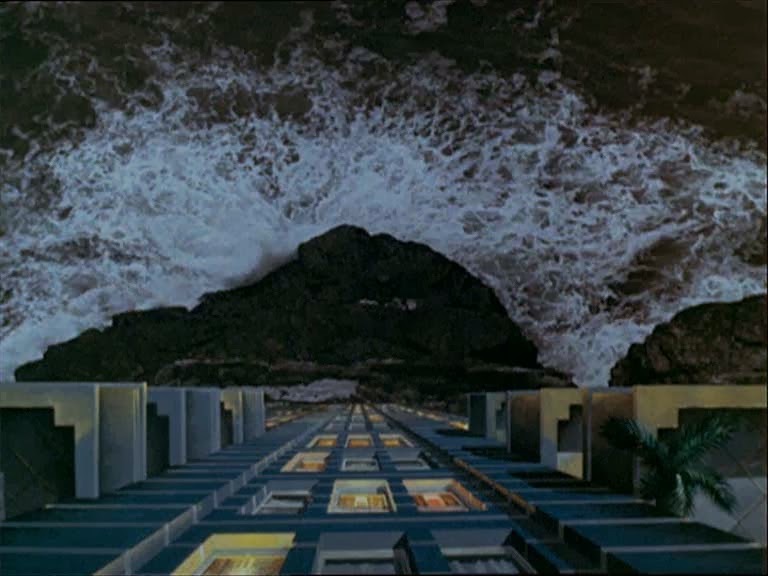 Cliff Culley matte shot. 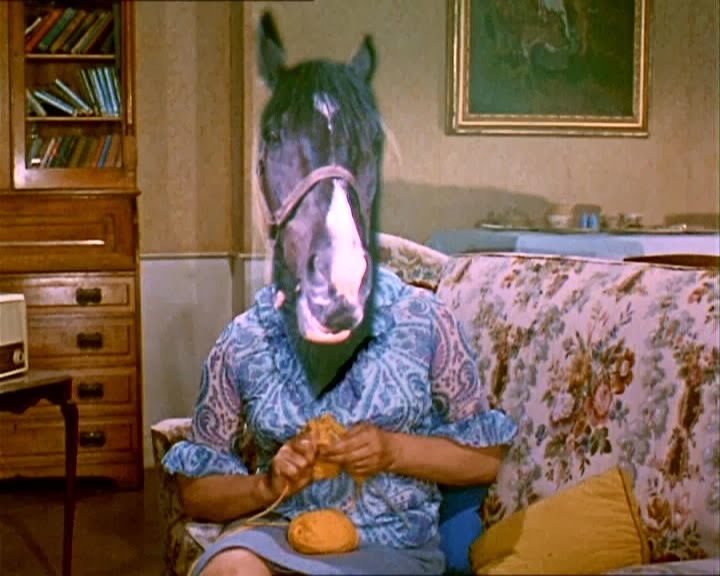 Norman's back at it, in the 1963 comedy A STITCH IN TIME where mattes are very well done. Here are some mattes from the 1952 film THE CARD - aka - THE PROMOTER which I think had Albert Whitlock's hand in the process. 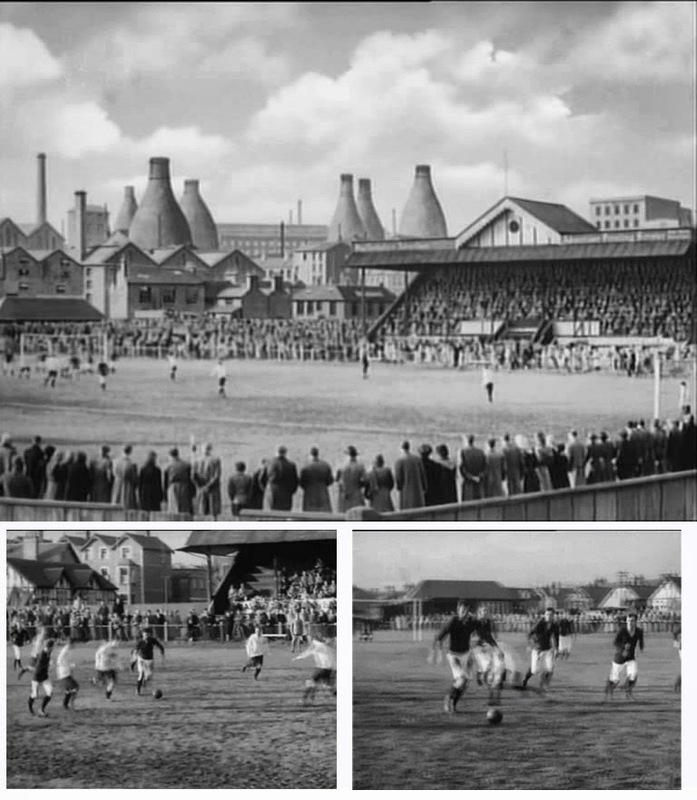 Also from THE CARD is this interesting matte of a coal fired power station, which in some closer cuts of the football match the location clearly doesn't have any such power station in evidence - though nobody would notice. 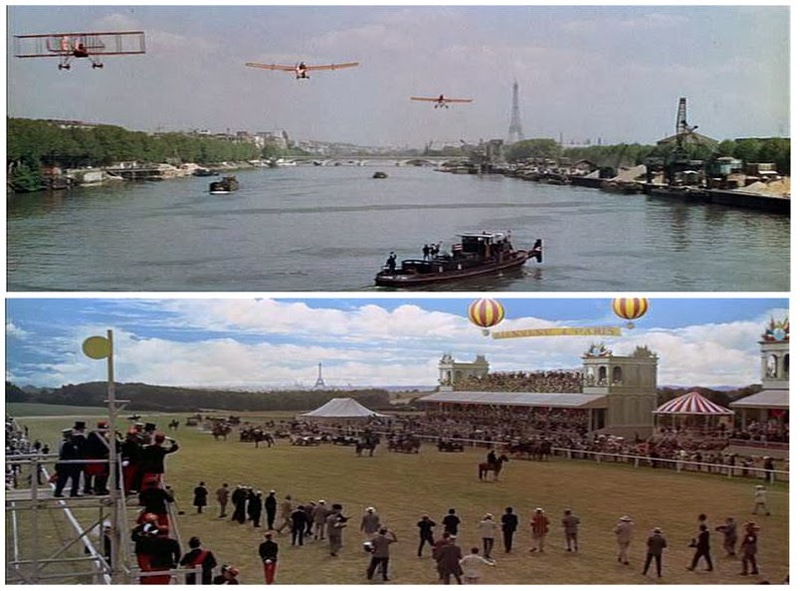 A couple of mattes from THOSE MAGNIFICENT MEN IN THEIR FLYING MACHINES (1965). Great and ever so catchy theme song which keeps repeated itself in the mind for weeks afterward! 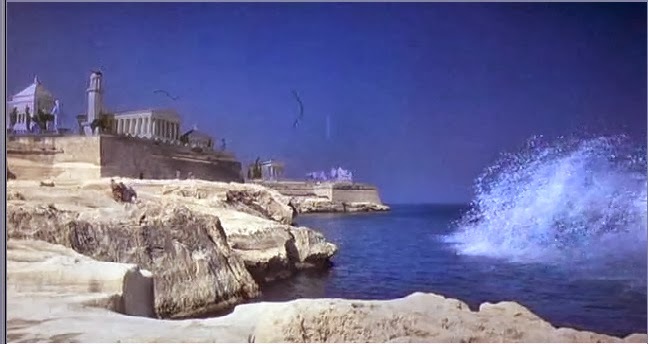 Although I'm not 100% sure, I think this shot from THUNDERBALL (1965) is a Cliff Culley matte top up. Also from TRIO is another Whitlock matte - an extensive tilt down of the church exterior. 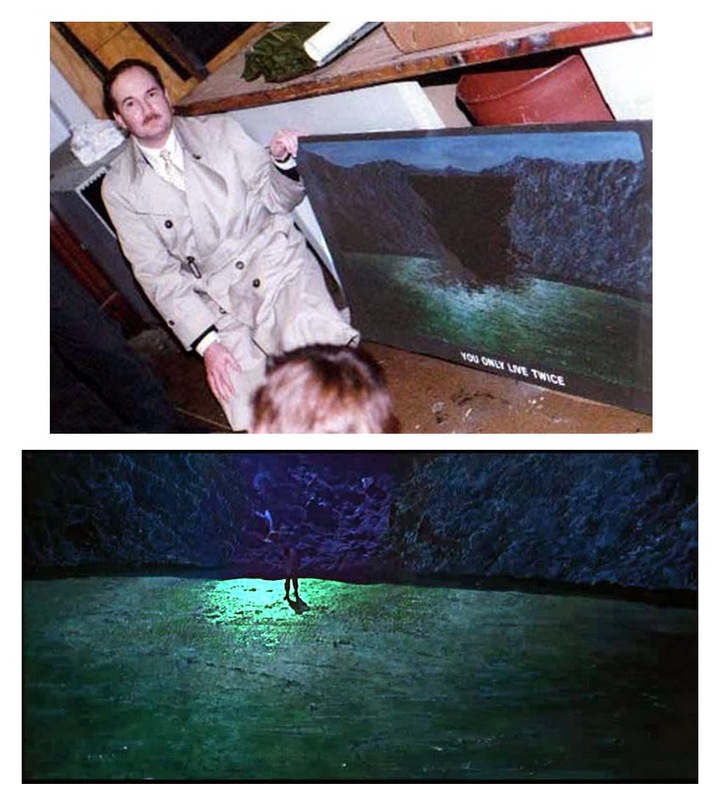 A closer look at the TROTTIE TRUE painting and miniature aspects prior to addition of the small section of (unneccessary) live action next to the tree, which isn't even noticeable in the finished scene. 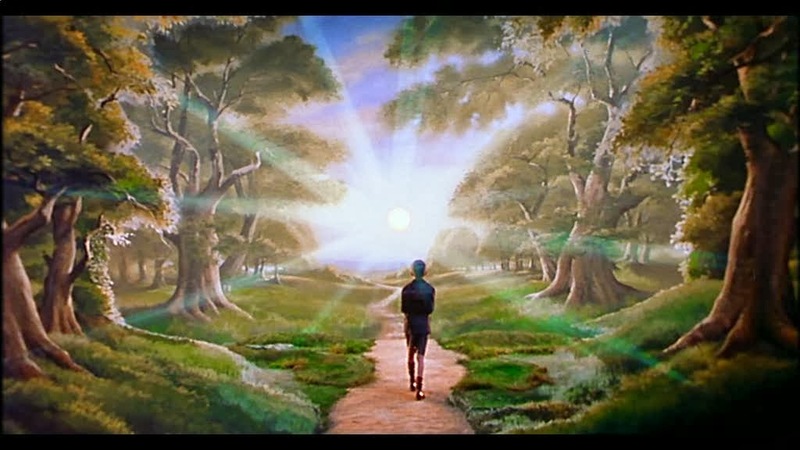 Final composited shot as seen in the film. 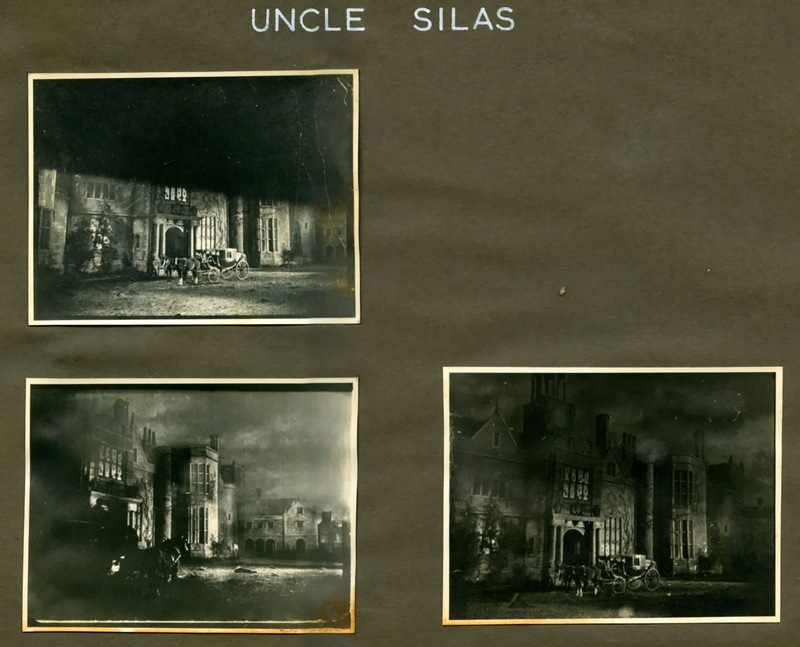 Before and after matte proofsheet for the 1947 film UNCLE SILAS. 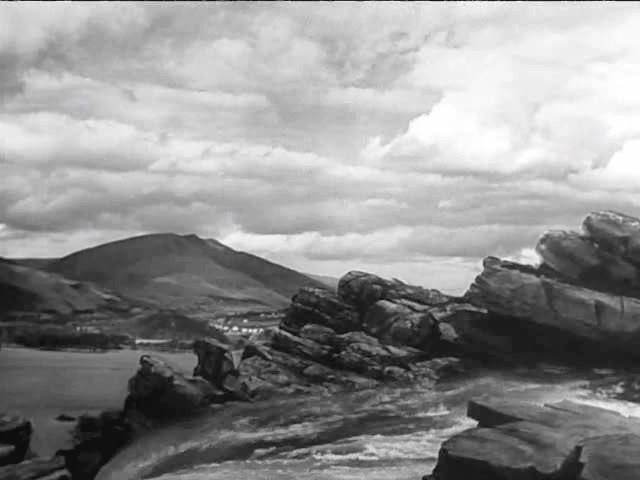 Joan Suttie was credited for the shots. A closer look at one of the UNCLE SILAS matte comps. Close view of the unused matte. An arresting glass shot from the Glam Rock picture VELVET GOLDMINE (1998), possibly by Leigh Took, who's company supplied effects shots on the film. 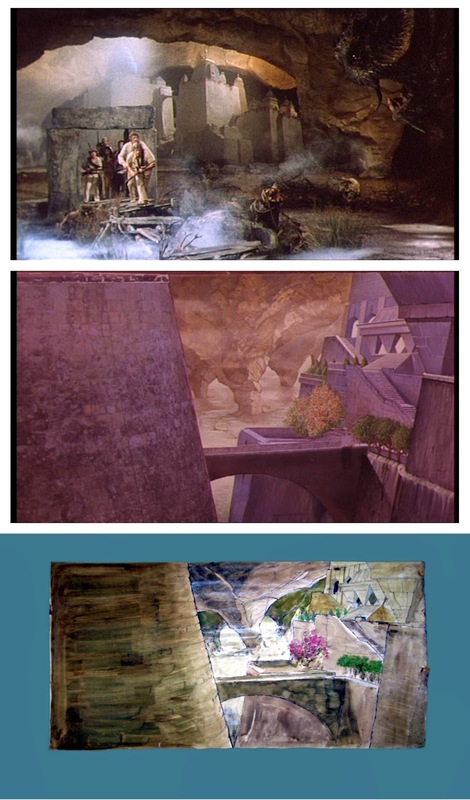 The undersea adventure yarn, Kevin Connors' WARLORDS OF ATLANTIS (1978) used a lot of matte art to depict the undersea world with imaginative flair. 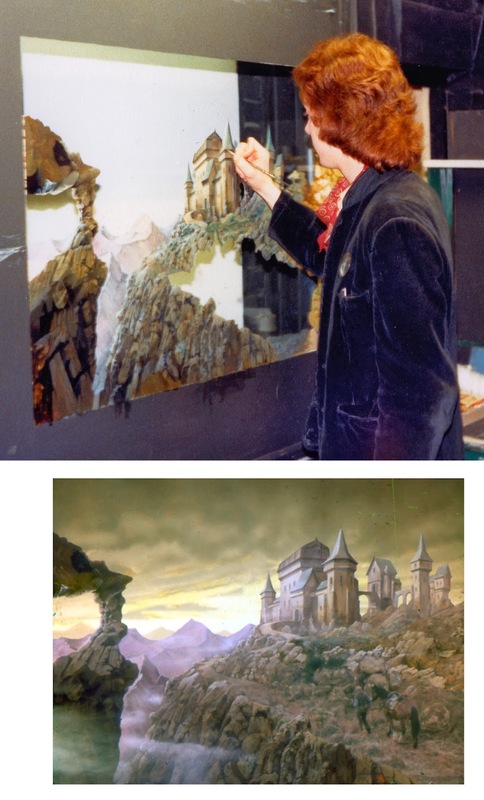 Cliff Culley was primary matte artist, with new trainee assistant Leigh Took along for the creative ride. 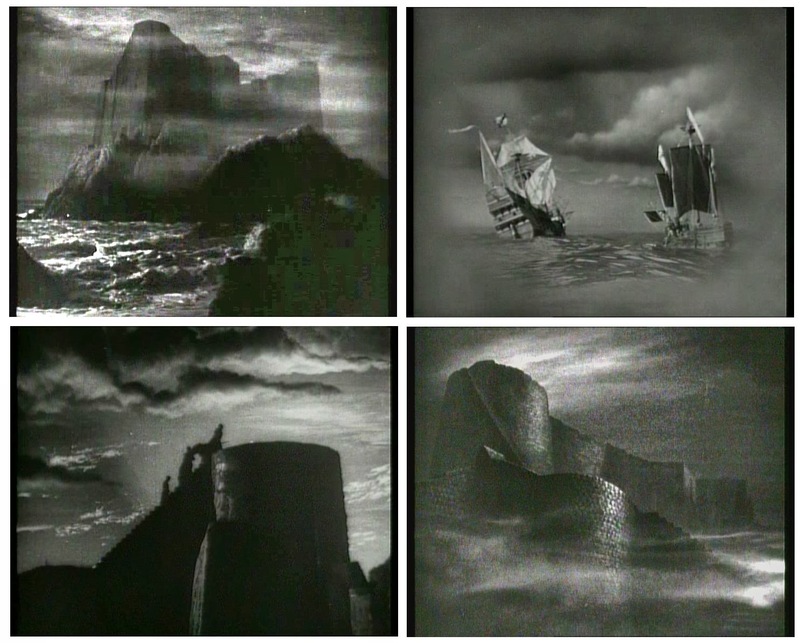 More from WARLORDS OF ATLANTIS with the bottom being the art director's drawing for the matte shot (centre). The original Charles Laughton version of WITNESS FOR THE PROSECUTION was terrific, and this 1980's remake had it's positive points too. 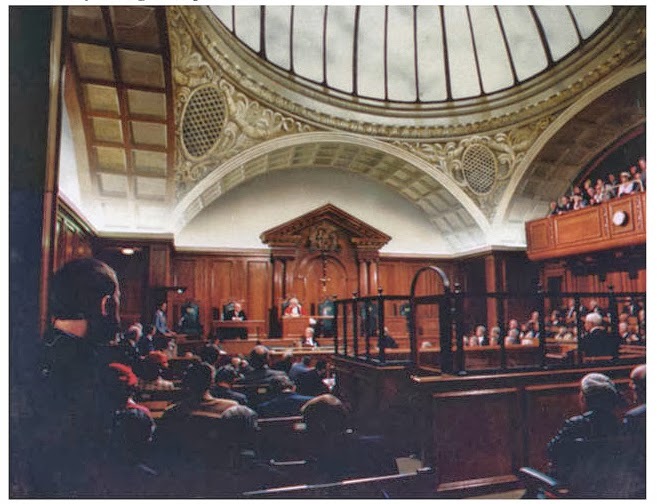 Matte painted ceiling of the Old Bailey by Leigh Took. The 1967 James Bond picture YOU ONLY LIVE TWICE was a hell of a good film - one of the best in fact - though the effects shots didn't hold up too well, at least not on the cinema screen nor tv for that matter where curious blocky garbage mattes abound in the opening space set piece and mismatched travelling mattes are evident. 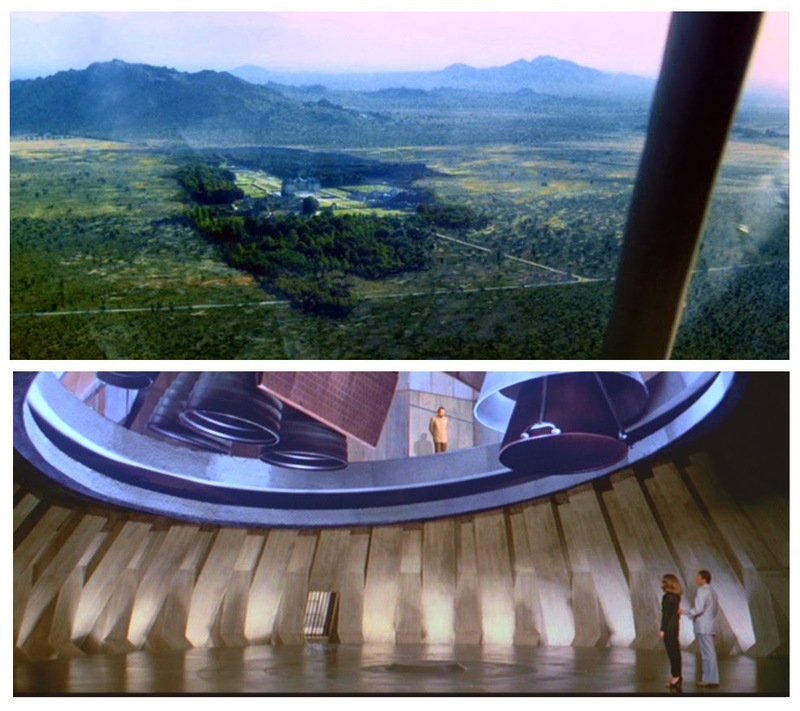 This shot of the so called volcanic lake atop of Blofeld's lair got past me though and I never spotted it. 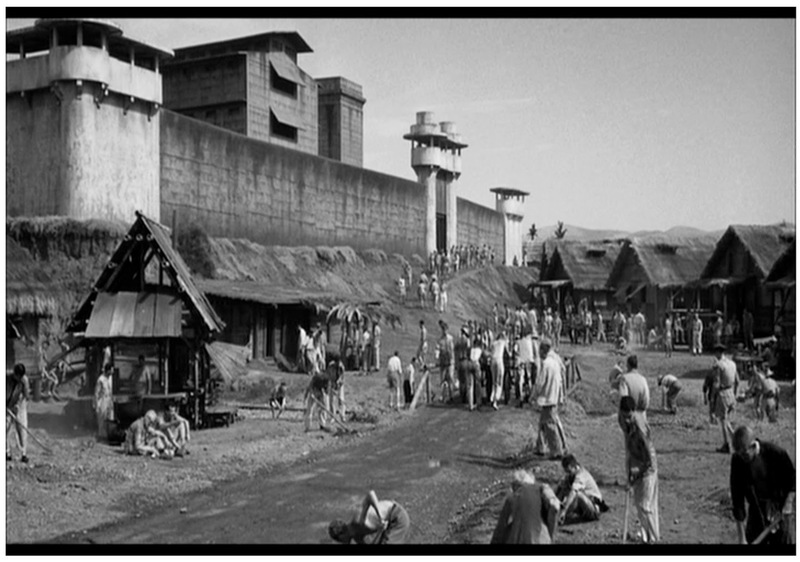 It's also one of the rare still surviving Pinewood matte paintings by Cliff Culley (not pictured... that's a journalist). 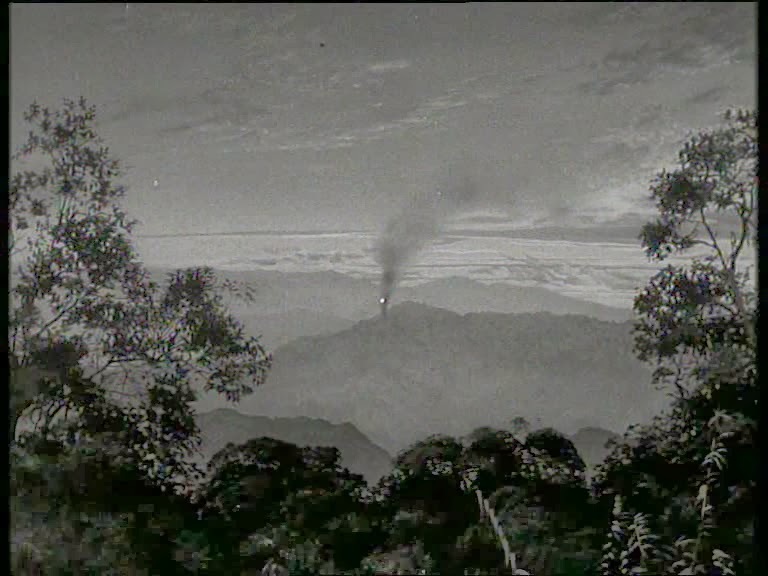 Cliff would also supply animated vapour trails to the missiles fired from Little Nellie. Multi-plane matte shot with both painted ceiling and painted steel framework hatch, animated frame by frame as launchpad readies for liftoff. 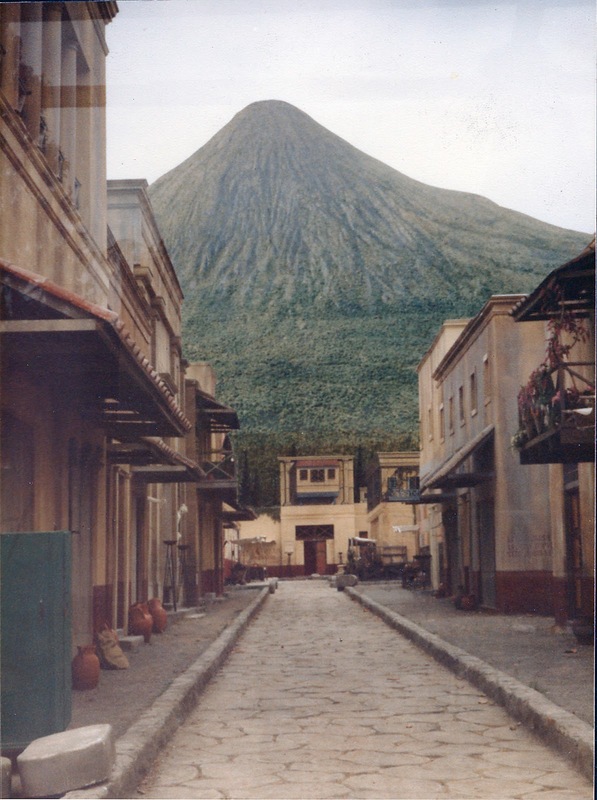 Cliff Culley's matte art for the Blofeld volcanic lair in Japan. 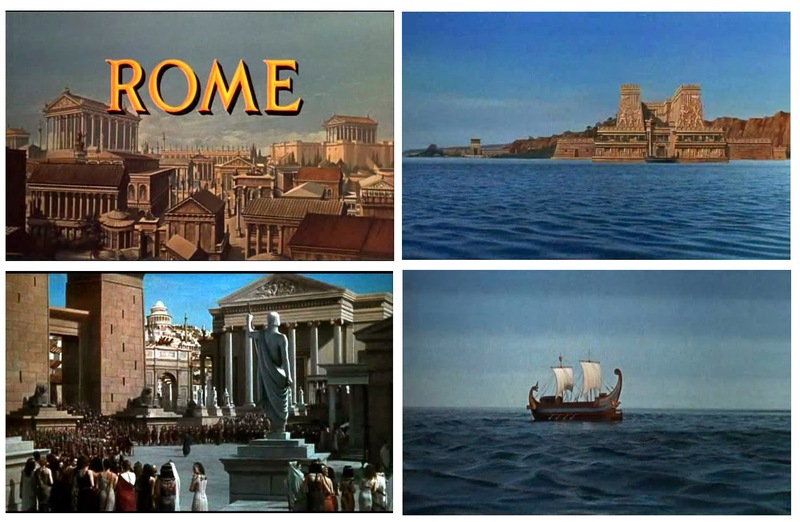 Great film, huge scale and a most exquisite score by John Barry, with Nancy Sinatra just adding to the aural wonder. 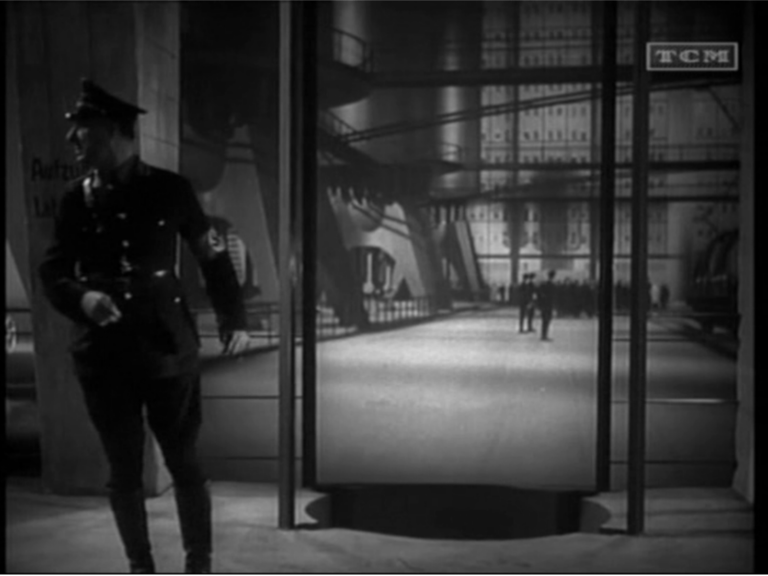 Alfred Hitchcock's YOUNG AND INNOCENT (1937) had some great miniatures and some good matte art. Among the technicians was a very young (and innocent?) Albert Whitlock who at the time was painting backings and lettering signs as well as dabbling with miniatures and the then mystical Schufftan process.. 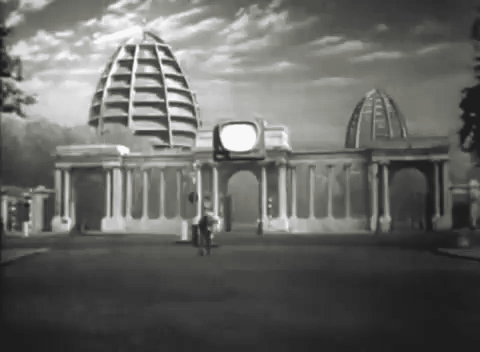 I don't know whether the 1956 film ZARAK is even a Pinewood film - maybe not - but here it is anyway. Cliff Richardson billed as effects chief and I've no idea who did the several mattes in the film. Well friends, that's about it. As Ringo Starr once said "I've got blisters on me fingers!" That typing sure takes it's toll. 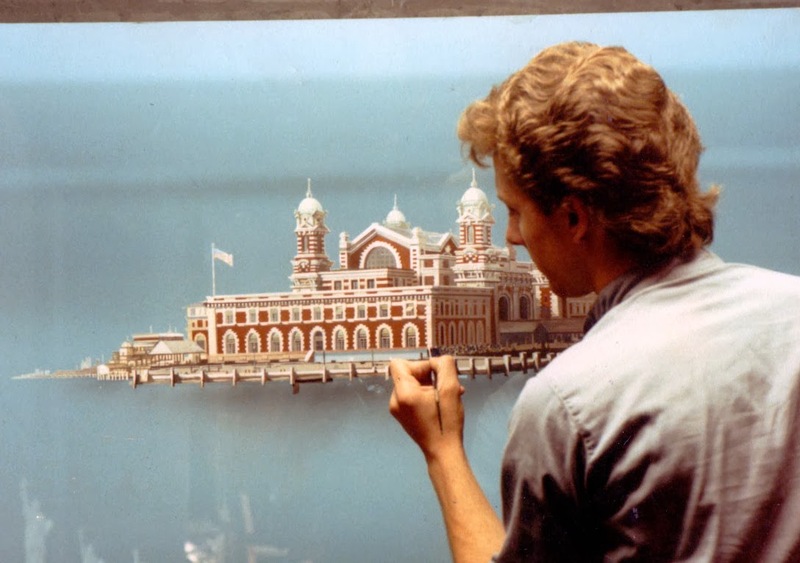 Coming up soon is an interview and career profile with British matte painter and scenic backing maestro, Steve Mitchell, who's done some phenomenal work in British cinema while staying way below the proverbial radar. I look forward to it.